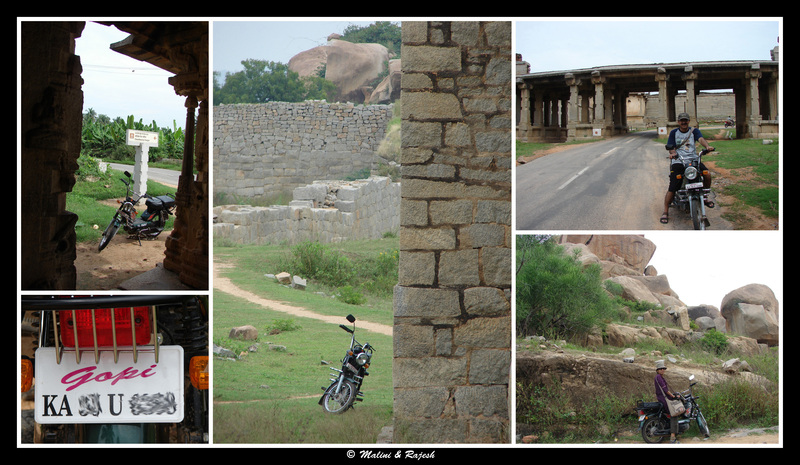 The moped dragged us across the bumpy terrain of Hampi. Today was our last day in this surreal landscape. There was only one agenda in mind. 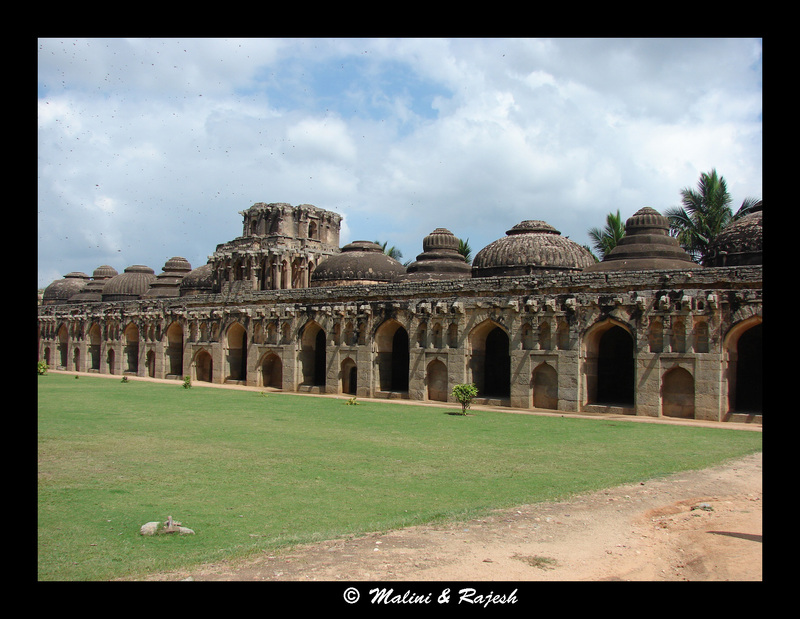 Hire a moped and explore the ruins of Hampi. 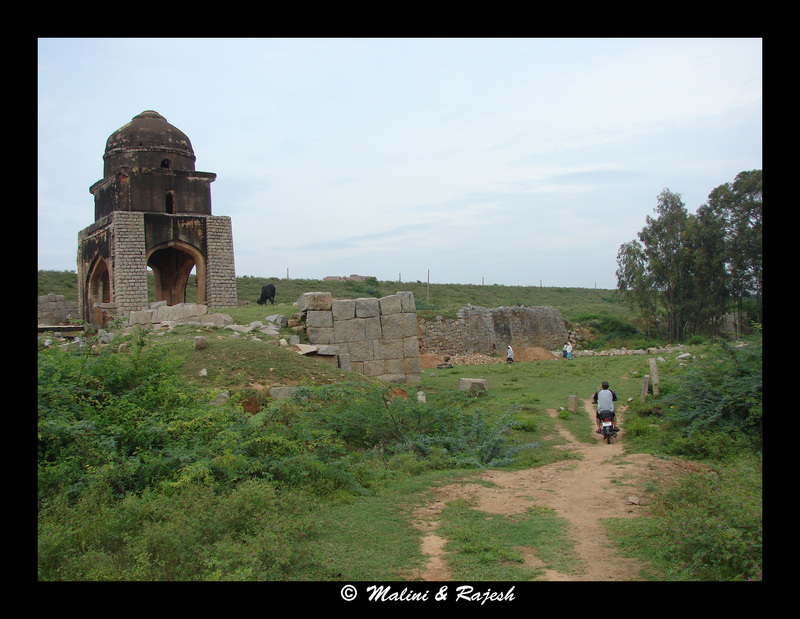 Follow the nose (of the moped) to the not much trodden paths and get lost somewhere among the boulders, broken palace basements, fallen temples and watch towers. 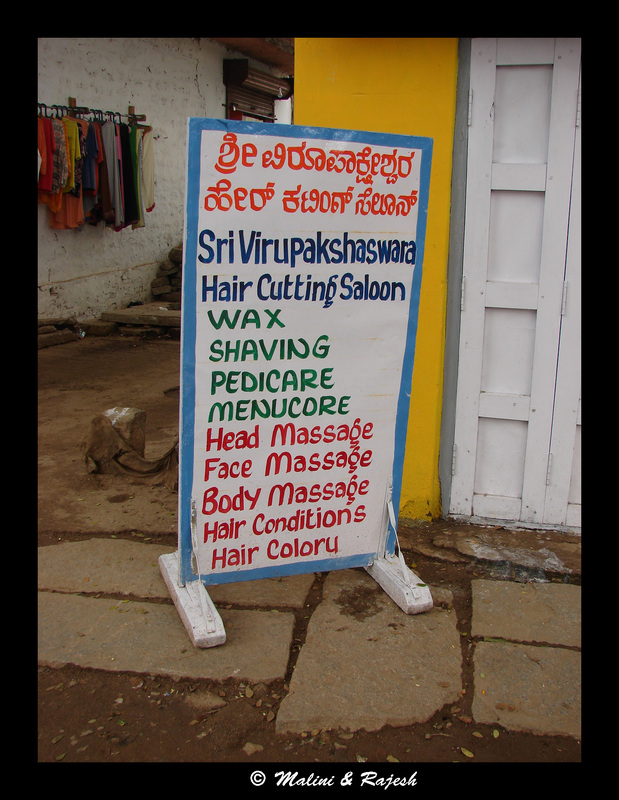 We had earlier rented a moped from Hampi bazaar and had paid Rs. 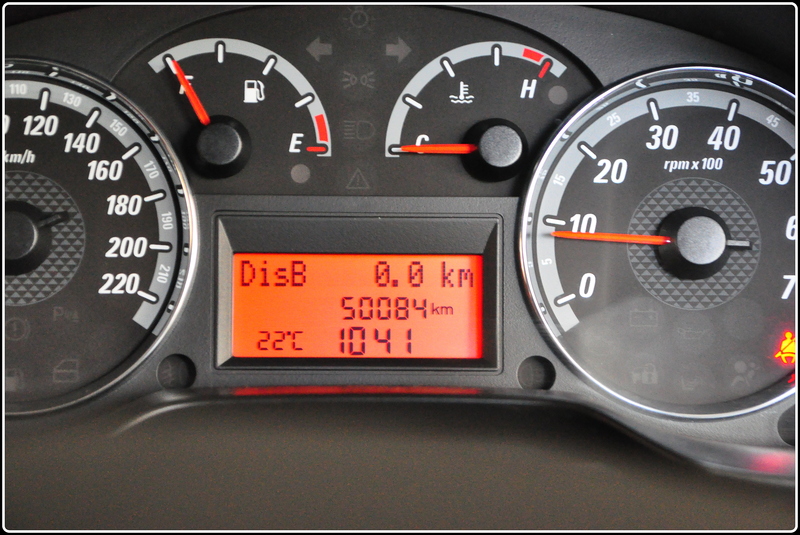 300, inclusive of the fuel. 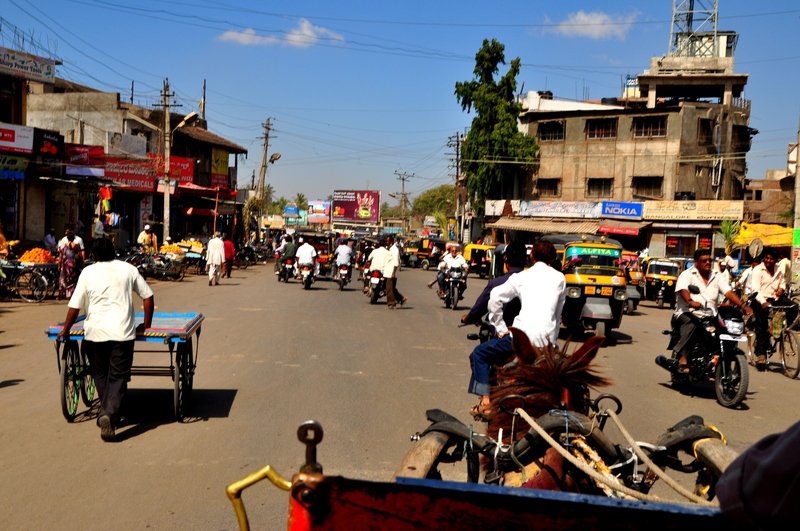 There are numerous shops in Hampi bazaar that rents out cycles, scooters and mopeds. They even let you to keep the vehicle overnight at your hotel. You just have to give them a xerox copy of any valid photo identity proof. 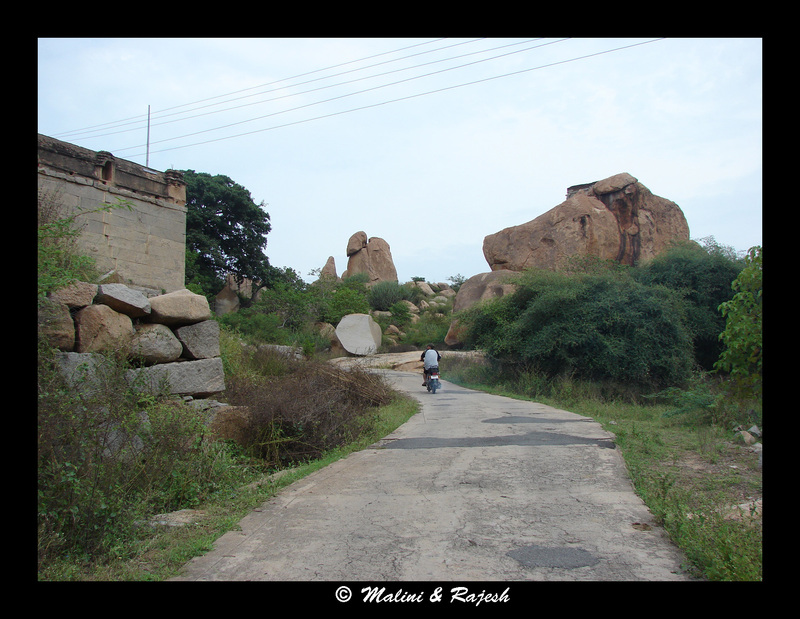 From Hampi bazaar we took the road to Kamalapura village. 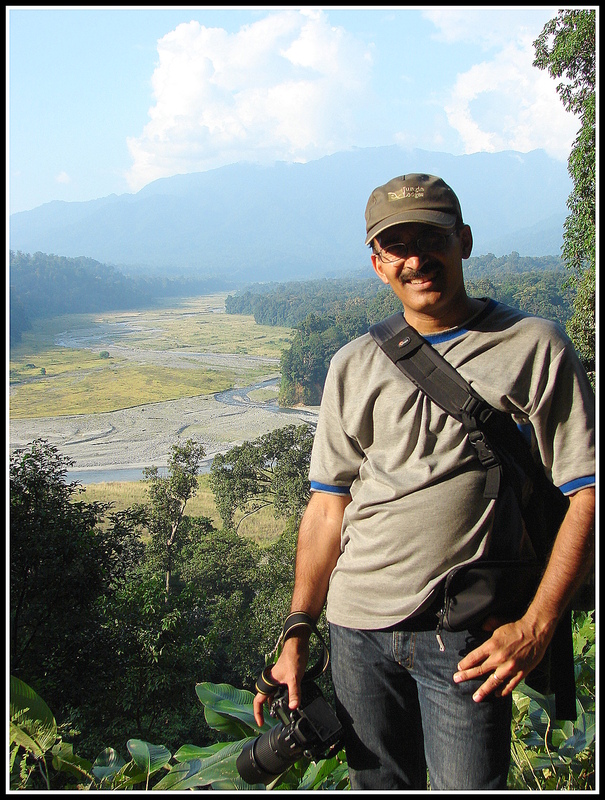 Right before the underground Shiva temple we saw a mud track and decided to follow it. 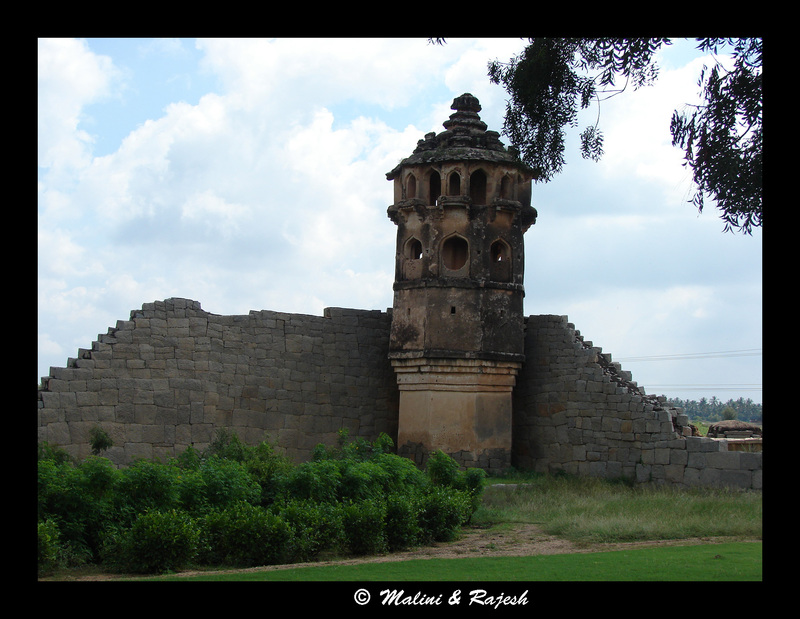 After a few turns we reached a watch tower called the Mohammadan watch tower. 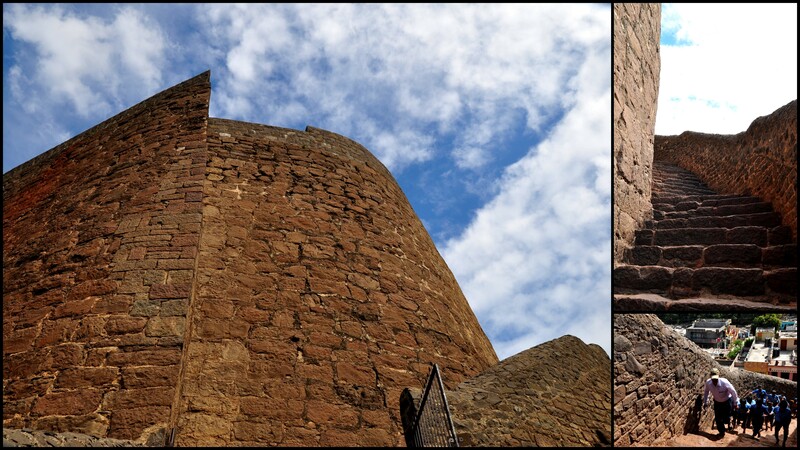 The watch tower had steps leading up to a balcony which overlooked the mud track. 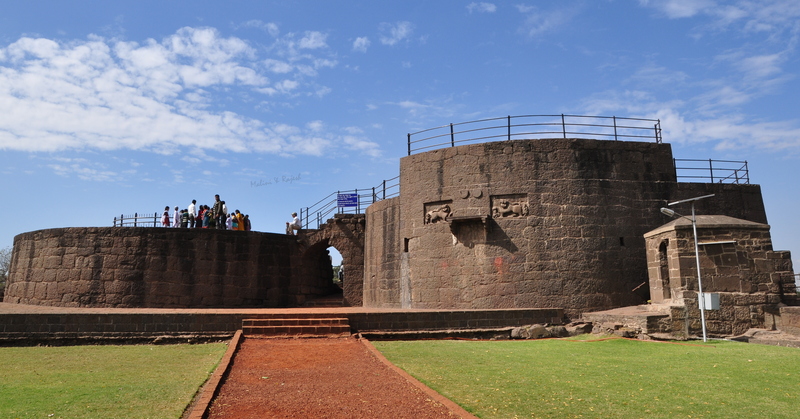 A few meters from the watch tower is the Danaik enclosure. 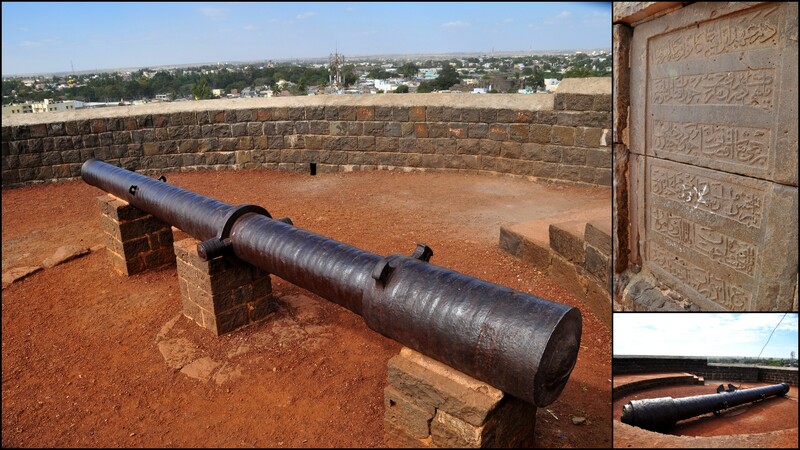 This was used as the military training area. Only the systematically partitioned basement of the enclosure remains. 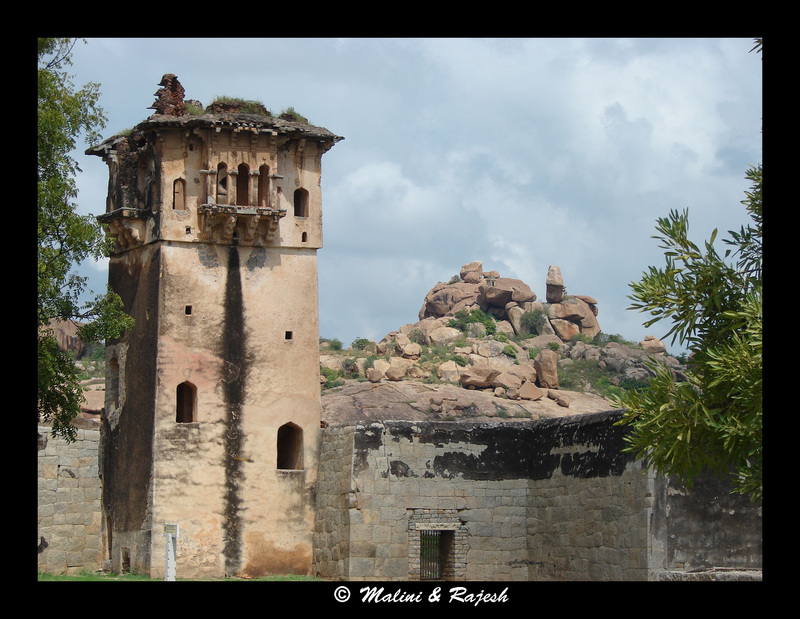 Right next to the Danaik enclosure is a mosque and and another watch tower called the band tower. 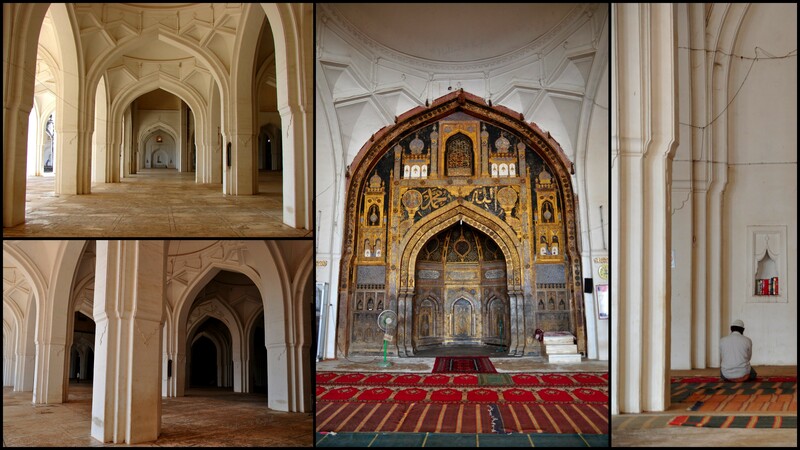 On the other side of the Mohammadan watch tower is the noblemen’s quarters. This was where the aristocrats lived. Just like the Danaik enclosure, only the basement remains. 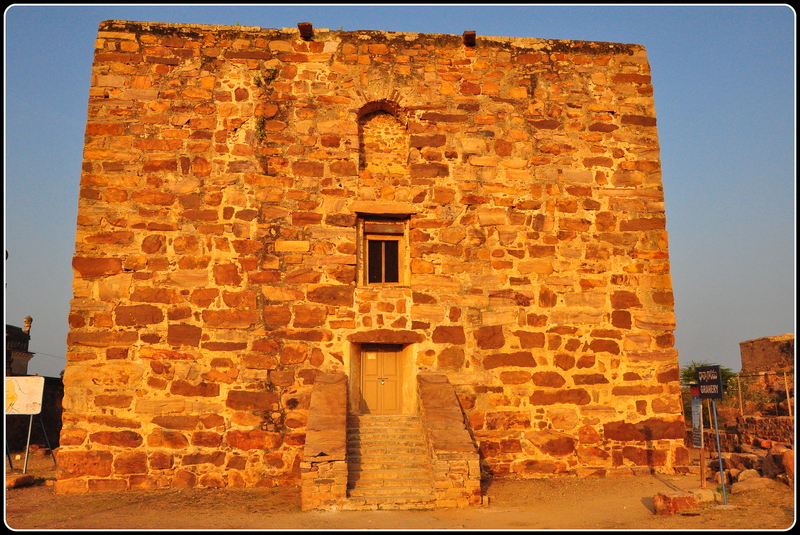 Right next to the quarters is a modern watch tower with steps, railings et al. 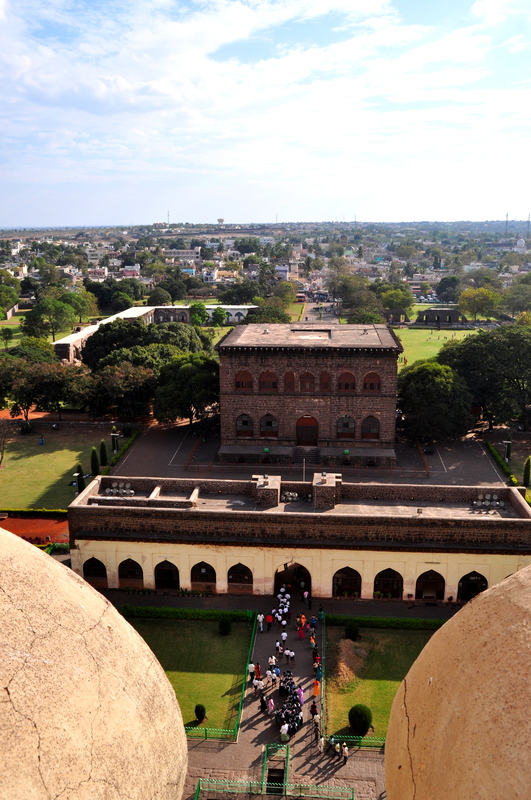 We climbed the watch tower to get a better view of the whole area. The bird’s eye view was worth the climb. 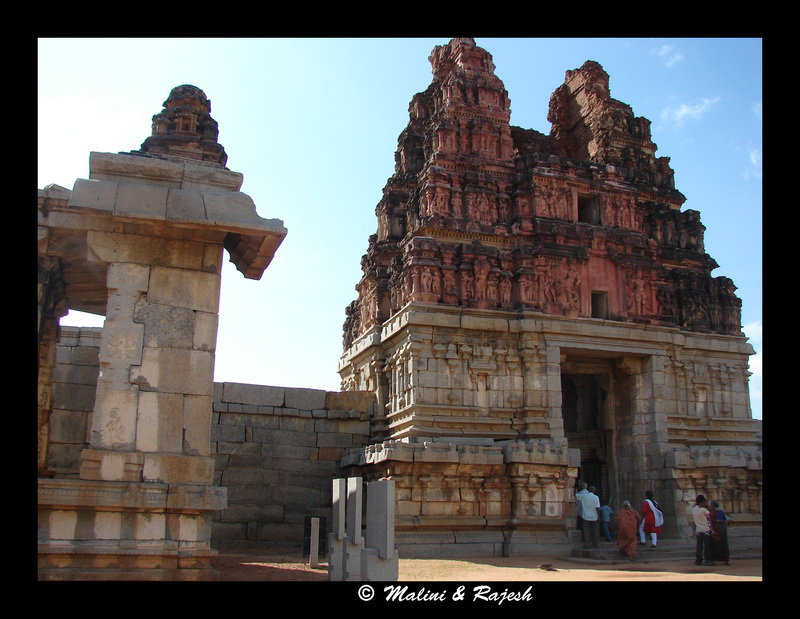 Our next stop was Malyavanta Raghunatha temple. 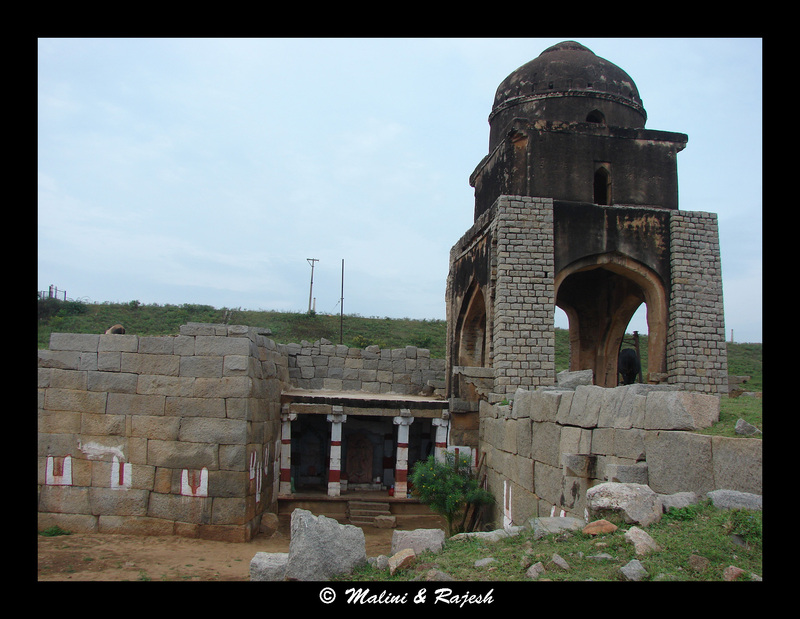 This temple is situated on top of Malyavanta hill which is on the way to Kampili village. 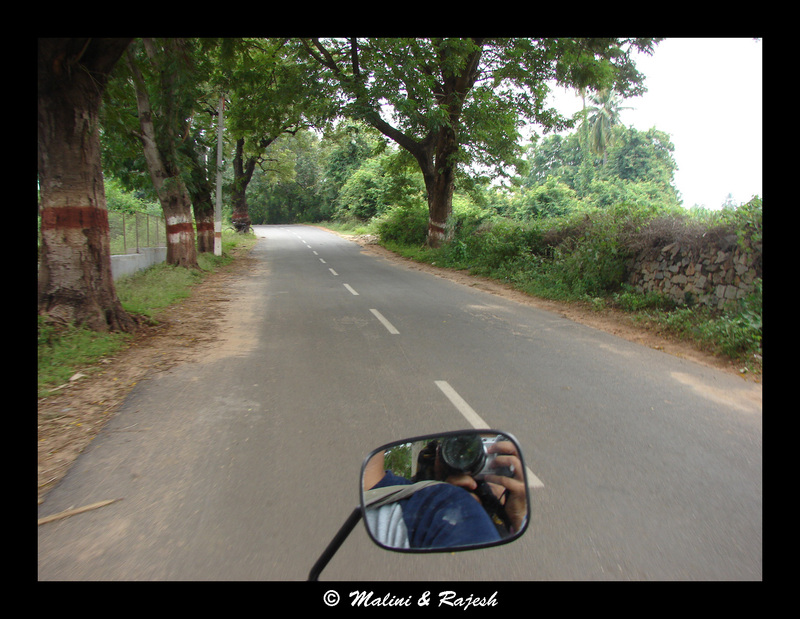 The road was steep, winding and long. I was obliged to dismount at a point and followed on foot. 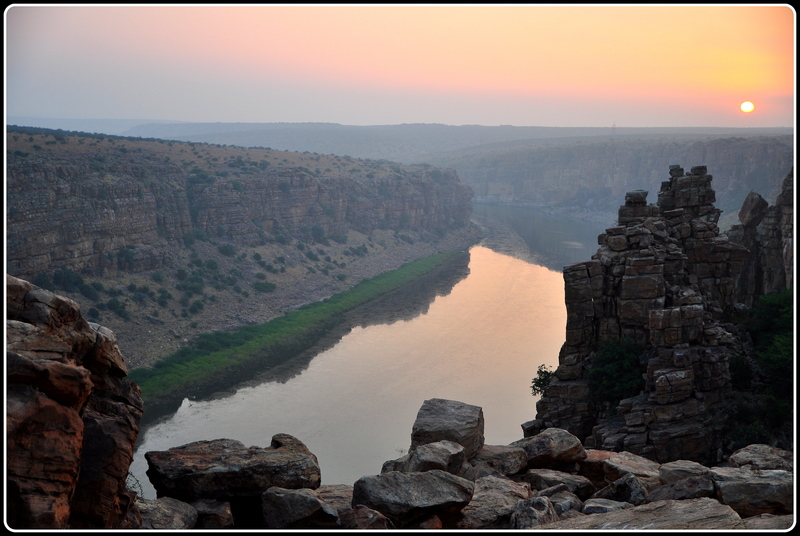 The legend is that, after killing Bali, Rama and Lakshmana rested at this place before going in search of Sita. 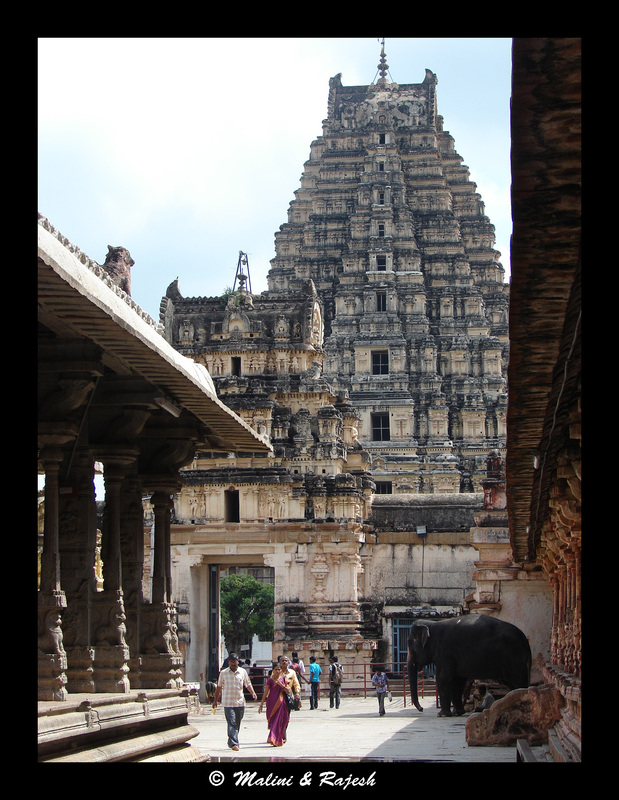 The 3-storeyed eastern gopura of the temple leads into a large courtyard. There were a few neatly pruned trees and a few dogs enjoying their pre-noon siesta. 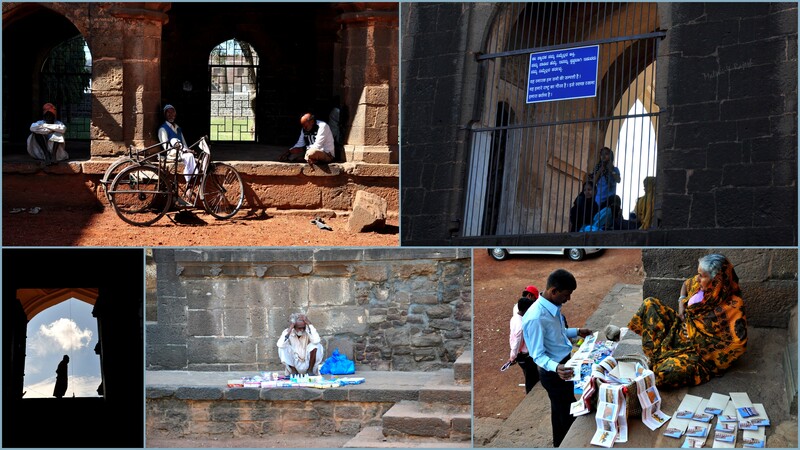 Other than a single devotee reading shlokas from Ramayana, we were the only people inside the complex. 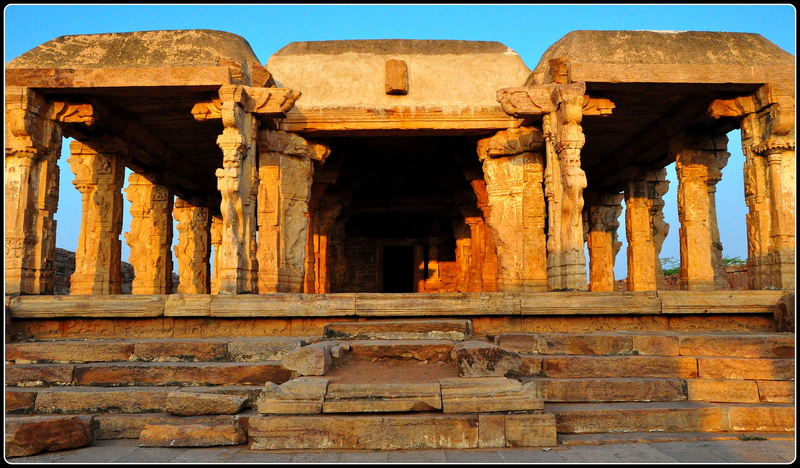 The temple has large pillared ornate mandapas on both sides. 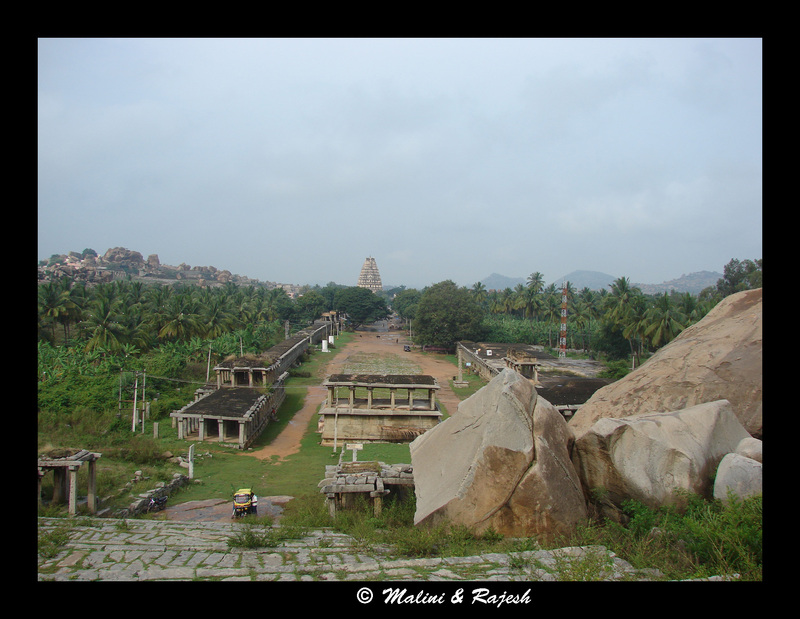 From the western side of the temple you can step onto the Malyavanta hill and climb a bit further up. 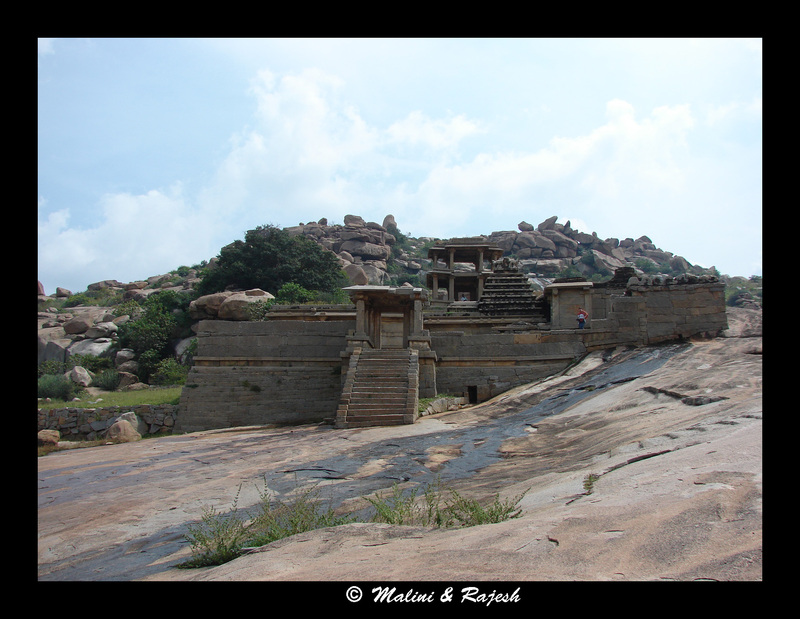 From the top of the hill you can get a view of the tough and rustic Hampi terrain. 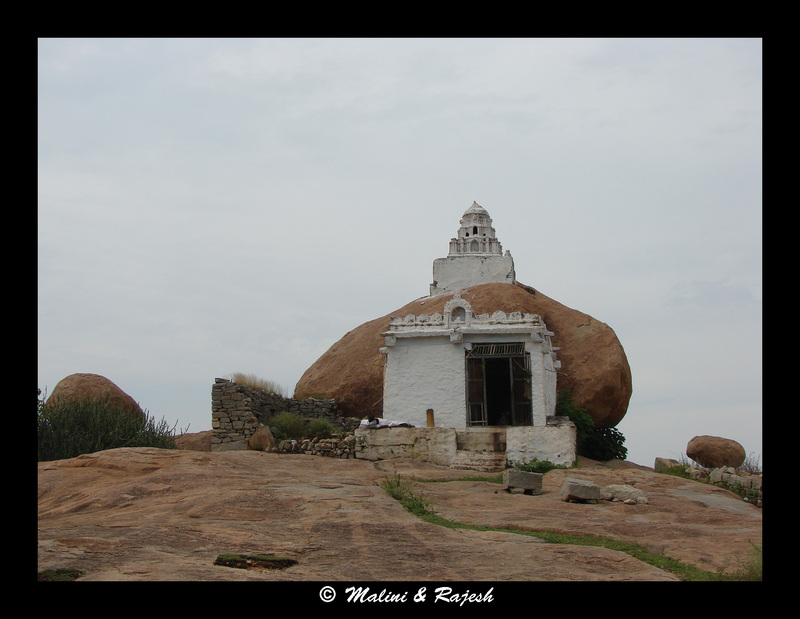 There is a small shrine on top of the hill with a lot of shivalingas sculpted out from the rocks. 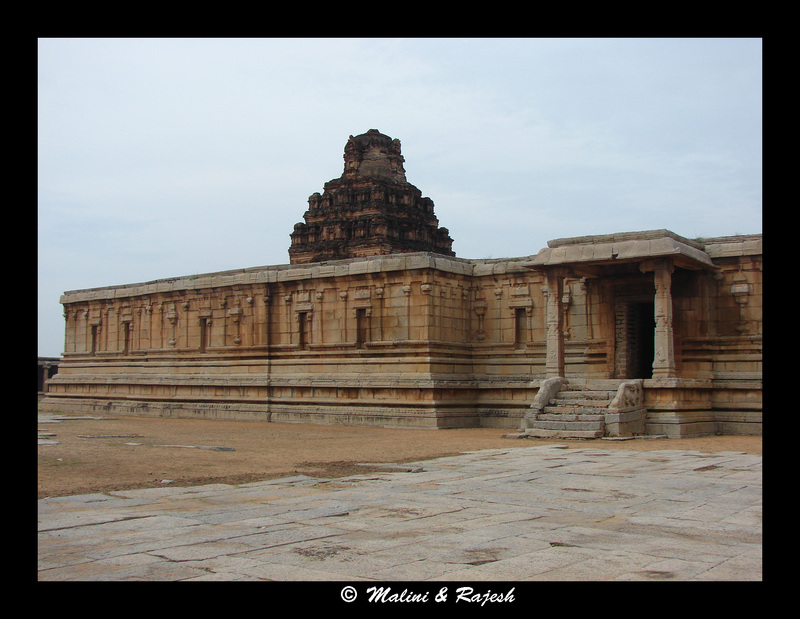 Our next stop, Pattabhirama temple, though as large as Vittala temple, is less frequented by tourists. 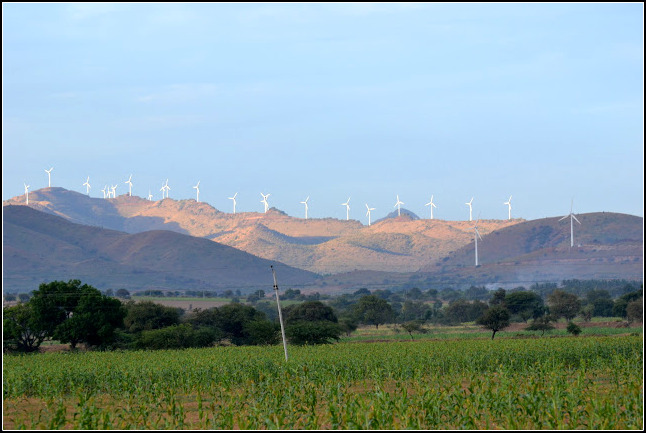 It is is probably due to its location being a little away from the rest of Hampi and just beyond the Kamalapura village en route to Daroji Bear Sanctuary. The security guard at the gate seemed a bit surprised to see us. 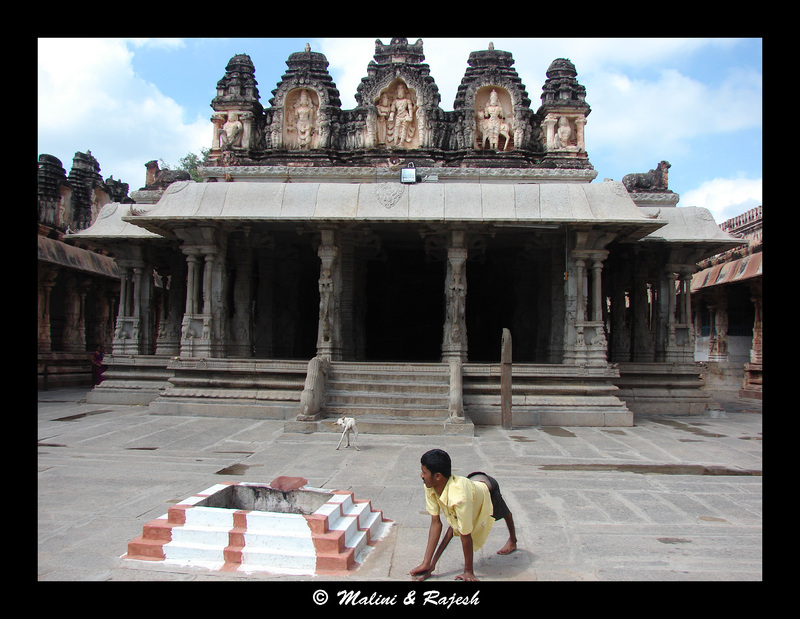 He said only the most committed of visitors make it to Pattabhirama temple. 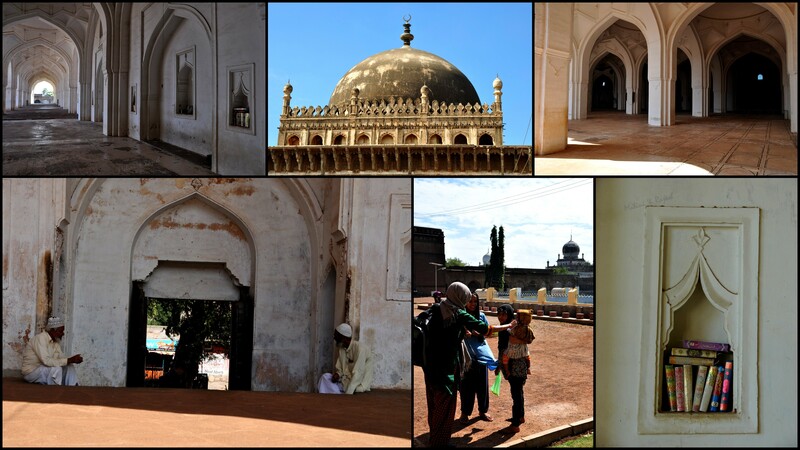 Modestly patting ourselves, we entered into the temple complex through a side entrance. 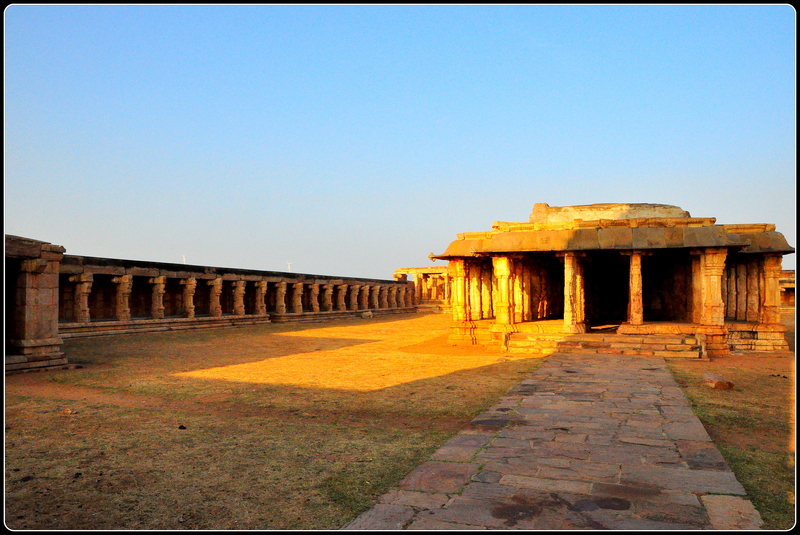 The temple must have been a grand structure during its prime. 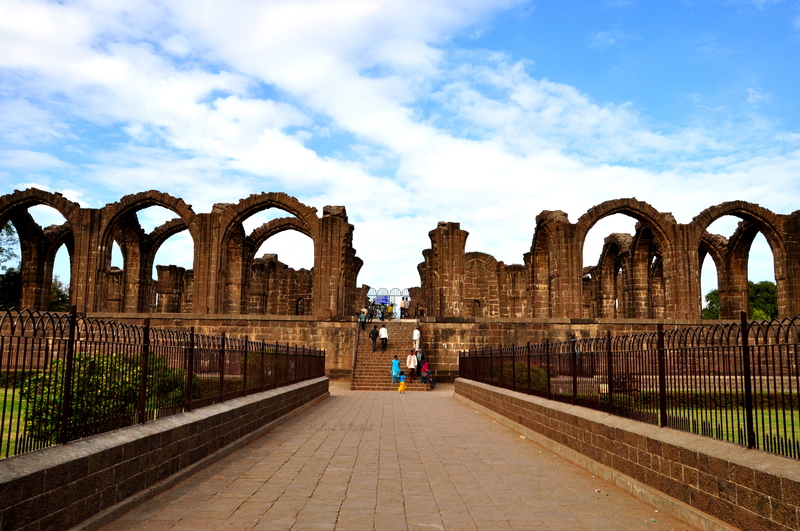 The huge courtyard has various mandapas on all sides with the main sanctum at the center. 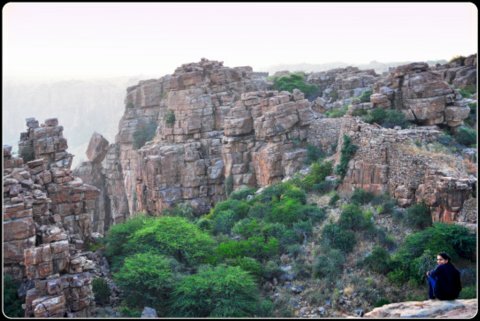 Other than the abundant simian population, both alive and sculpted, no other soul was in the premises. 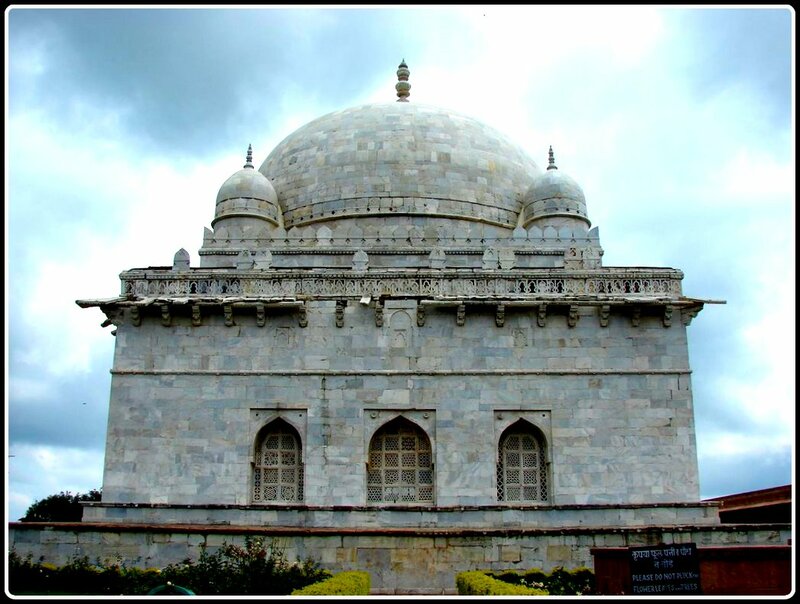 Further down the road we came across a rectangular shaped structure with a dome called the Domed gate. 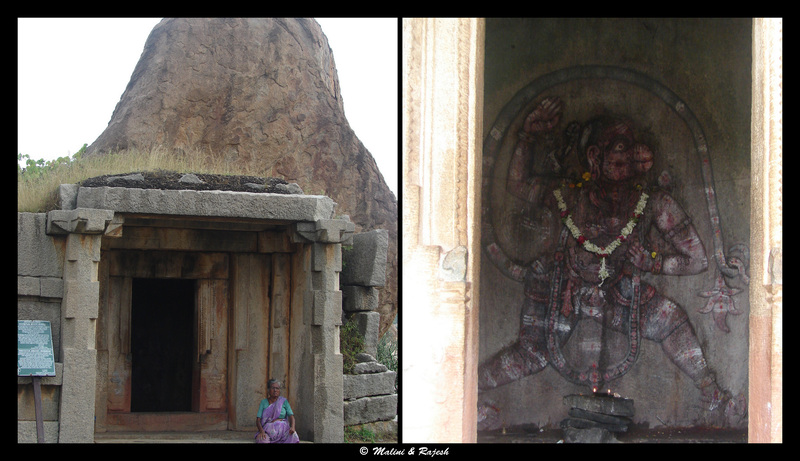 Within the Domed gate there is an image of Hanuman carved on the wall. 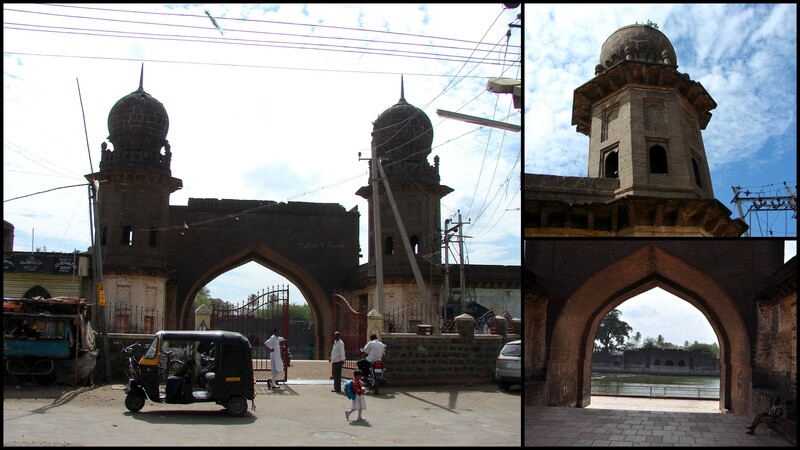 This gate had no similarities with the Bhima’s gate we had seen earlier. 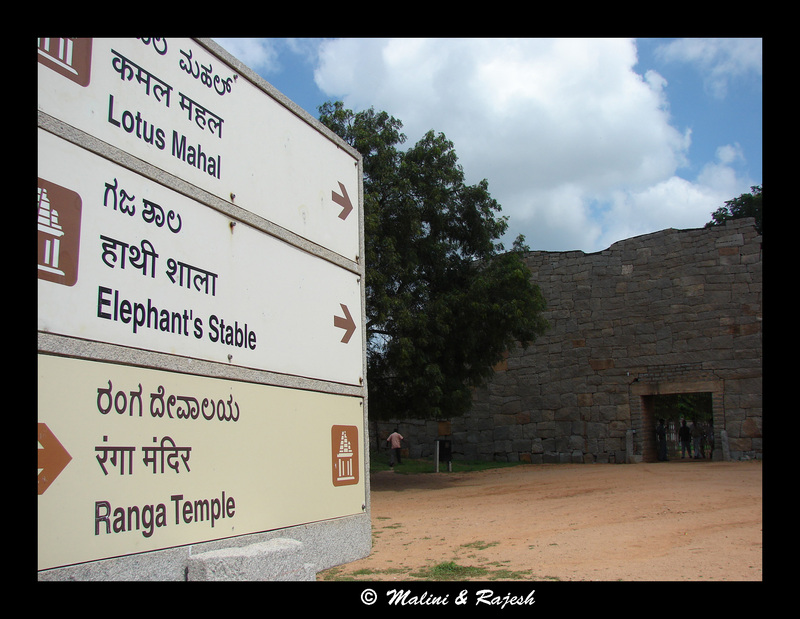 However, we did find some similarities with the Talarigatta gate we saw later. 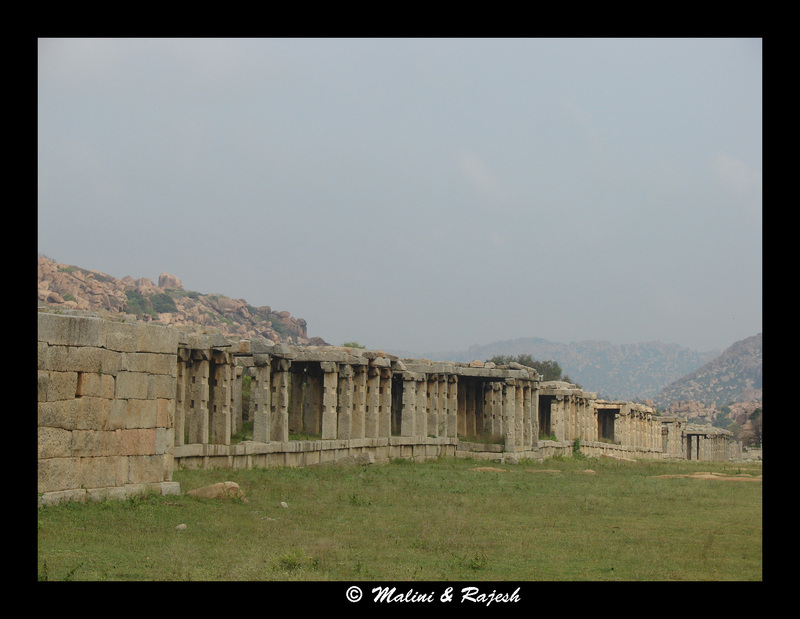 In ancient Hampi, very few people would have had houses with private bath areas. People must have enjoyed going to public bath houses. 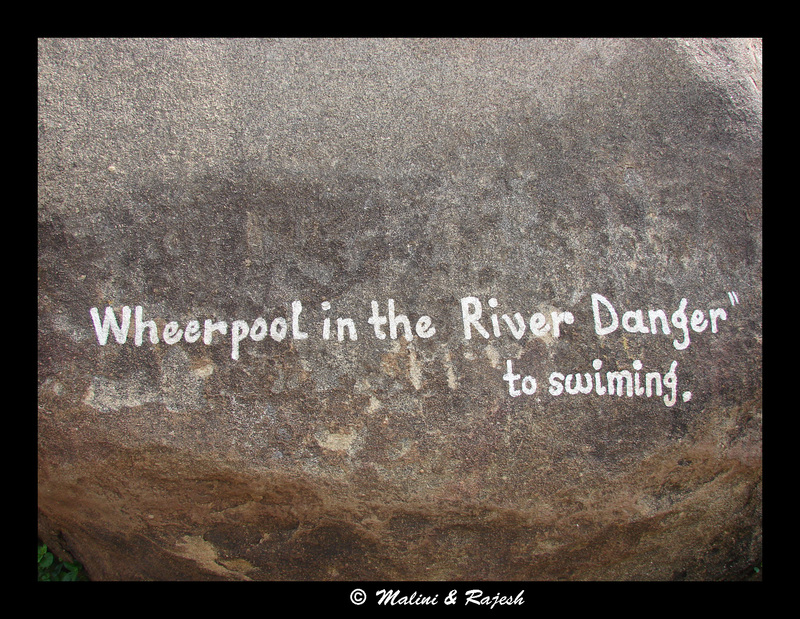 We came across at least three public bath houses, not to mention the innumerable pushkarinis (water tanks) we saw. 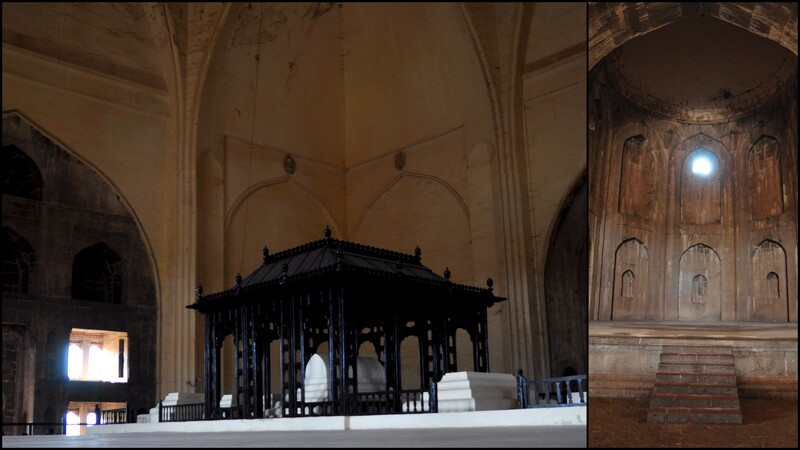 The most magnificent of them all is the Queen’s bath pavilion, the bathing area for the queen and the mistresses. The pavilion has a veranda that runs on all sides. In the middle is an open pond that can be accessed by steps. Projecting into the pond from the verandah are many balconies decorated with tiny windows. 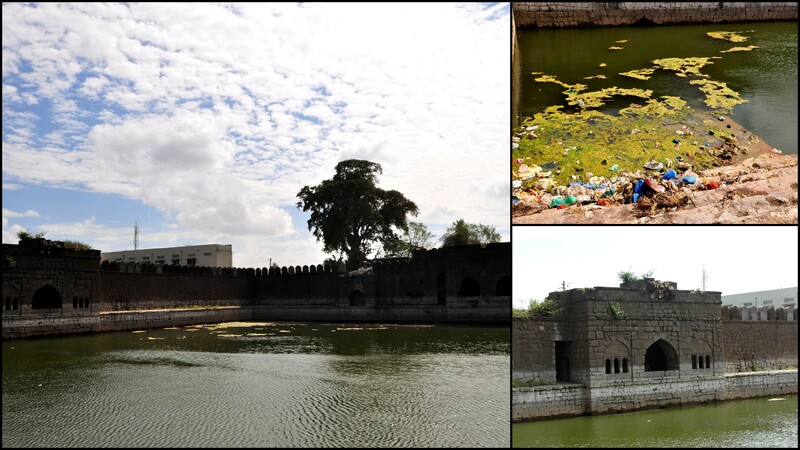 There are various aqueducts terminating inside the pond. The pavilion does not have a roof. 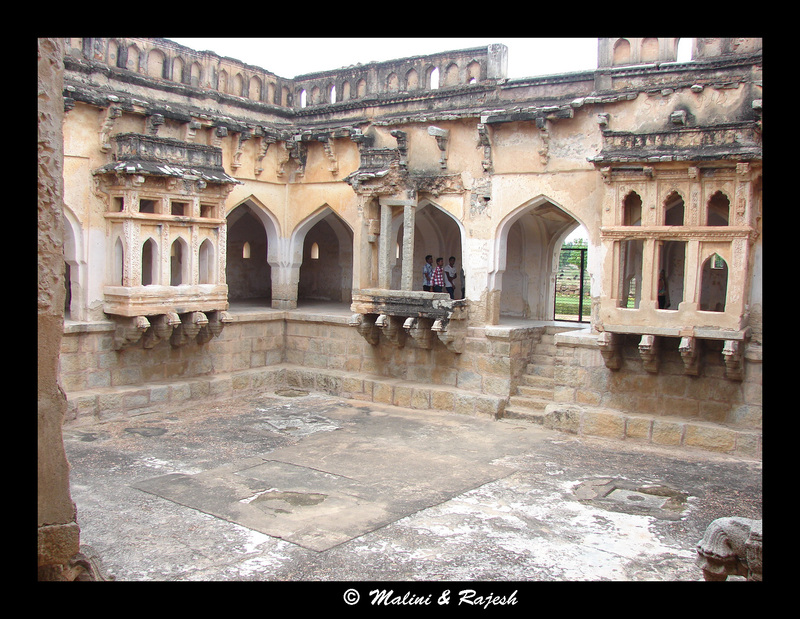 Around the building is a water channel that was probably designed to prevent intruders from walking into the pavilion when the women took bath! 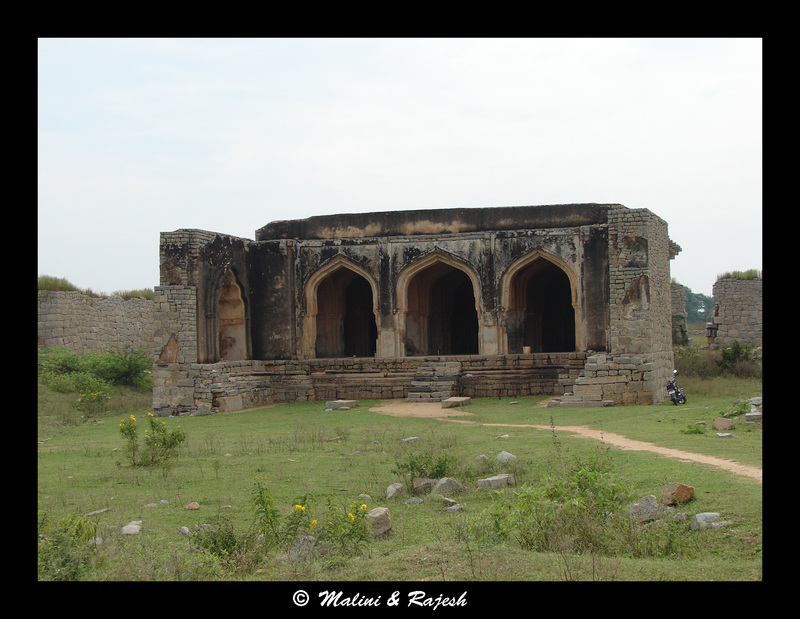 The Queen’s bath can be found right next to the road to Hampi bazaar. 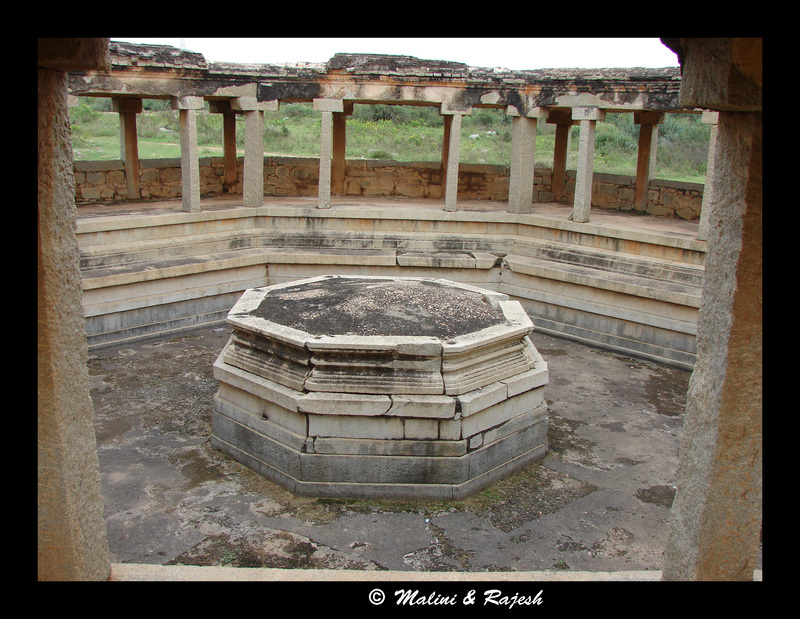 Another public bath, the Octagonal bath, as the name suggests, is an octogonal bathing area. 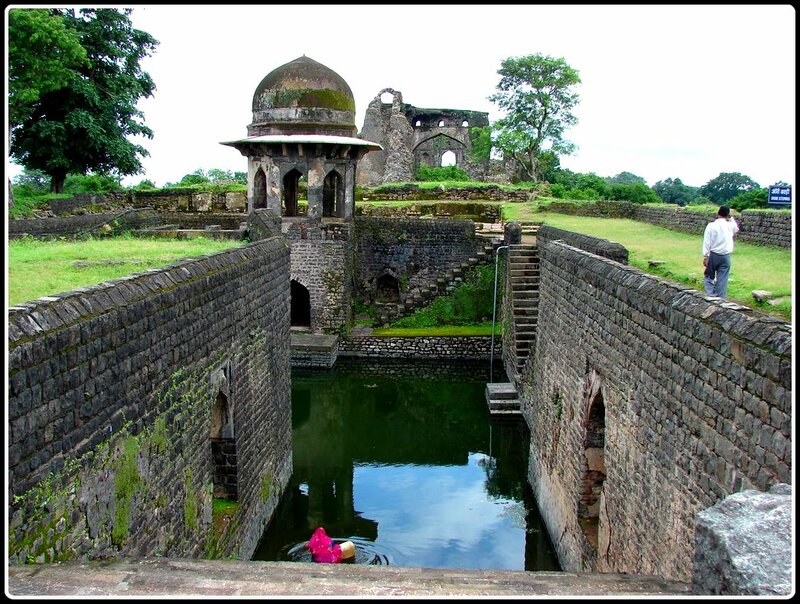 The bath has an octagonal shaped platform with aqueducts at the middle and has a pillared veranda around it. 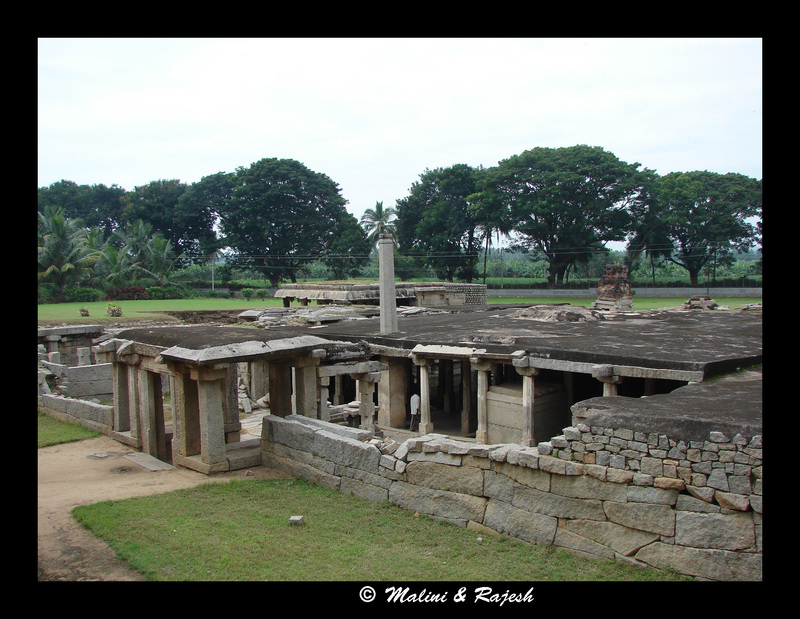 The area between the veranda and the platform must have been the bathing area. 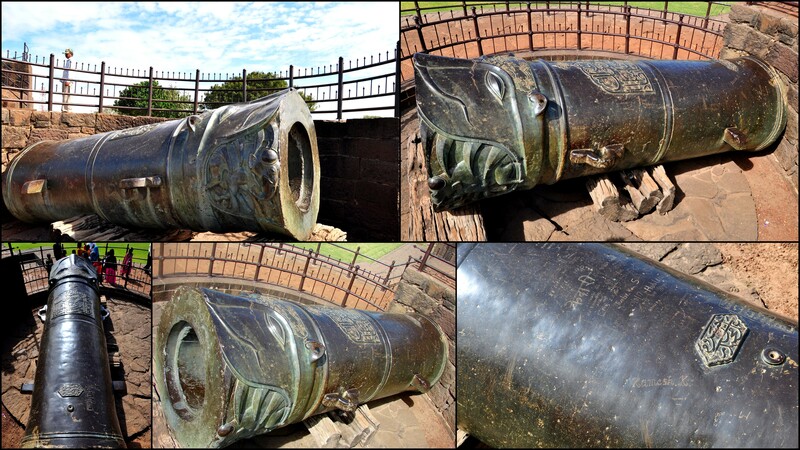 This is found on a mud path about a kilometer from the Queen’s bath. 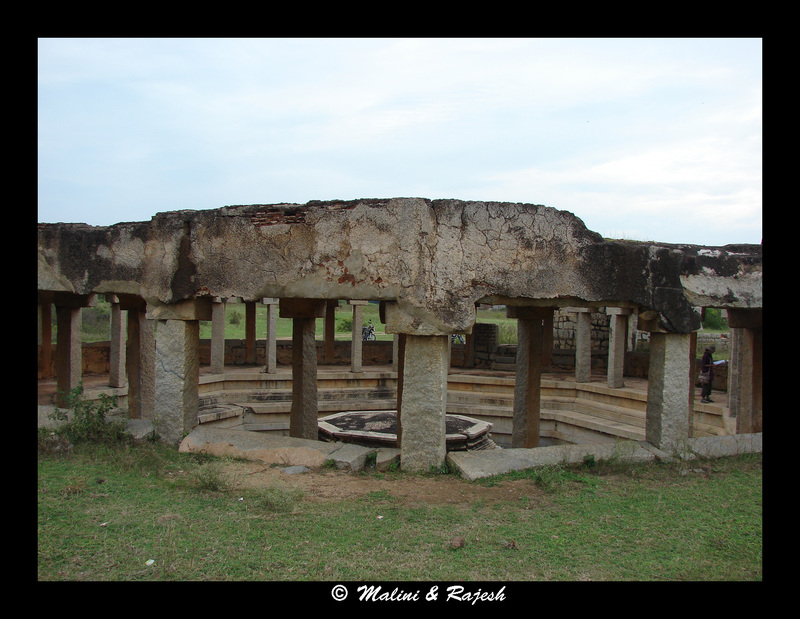 The Octogonal water pavilion, found on the road to Hampi bazaar, could have been a magnificent water fountain in its prime. Now practically in an abandoned stage with bushes and wild grass growing around, it looks more like a makeshift cooking place. 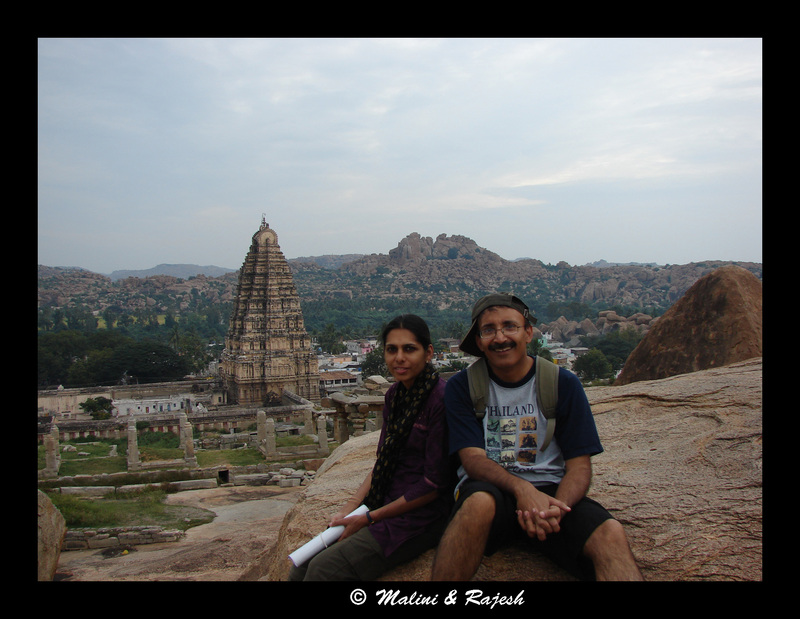 We had spent three days in Hampi and had not seen the sun rise or set. 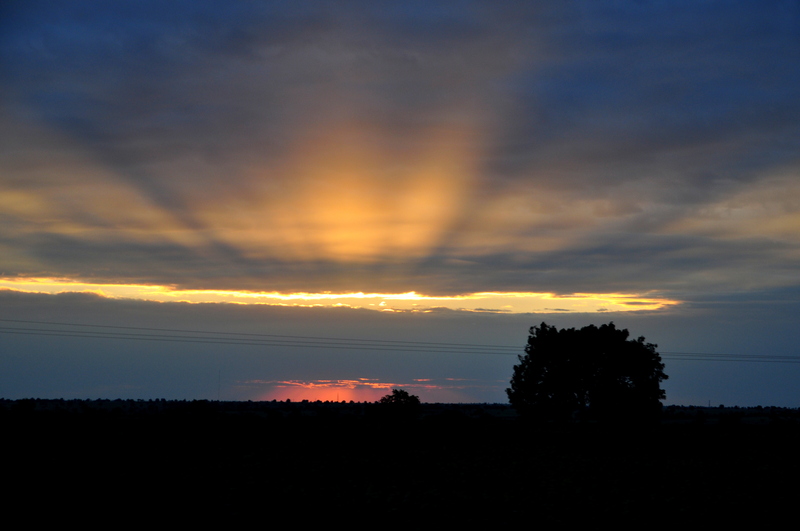 The sky was overcast on all days during dawn and dusk, not allowing us to capture the beautiful event. 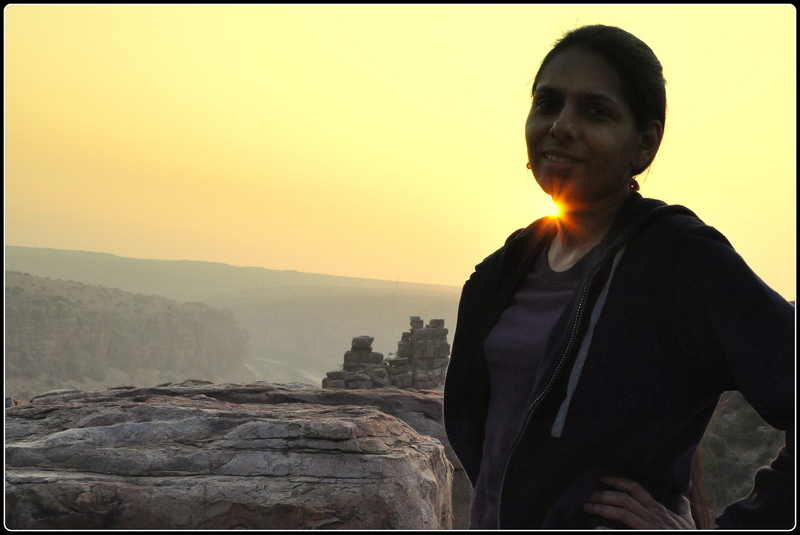 We climbed up the Hemakuta hill with whatever energy that remained to capture whatever remained of the sun through the overcast skies. 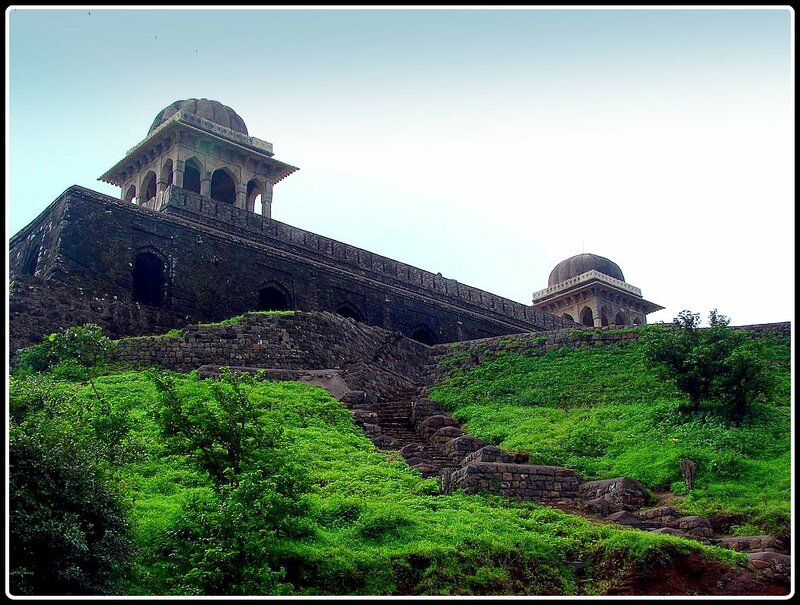 The Hemakuta hill is dotted with a lot of temples, the main being the Jain temples. 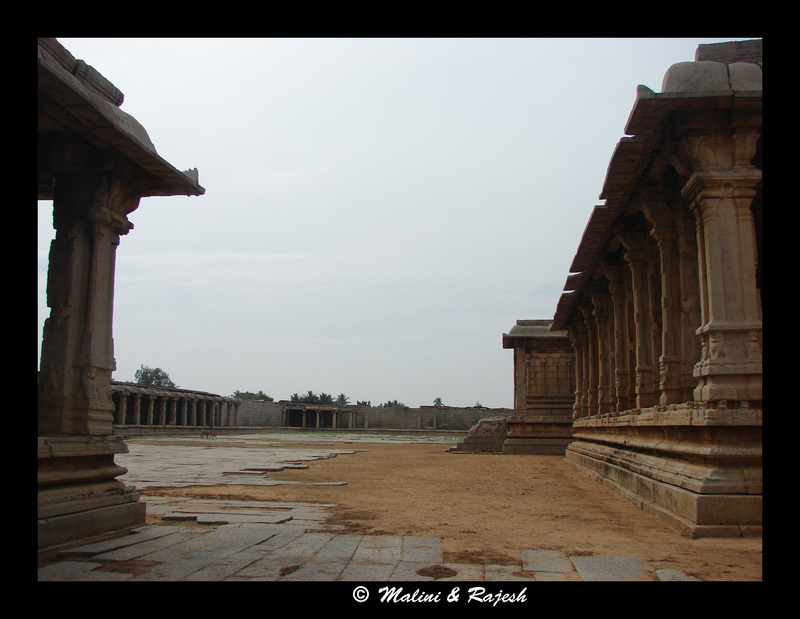 The Jain temples look a bit different from the other temples. 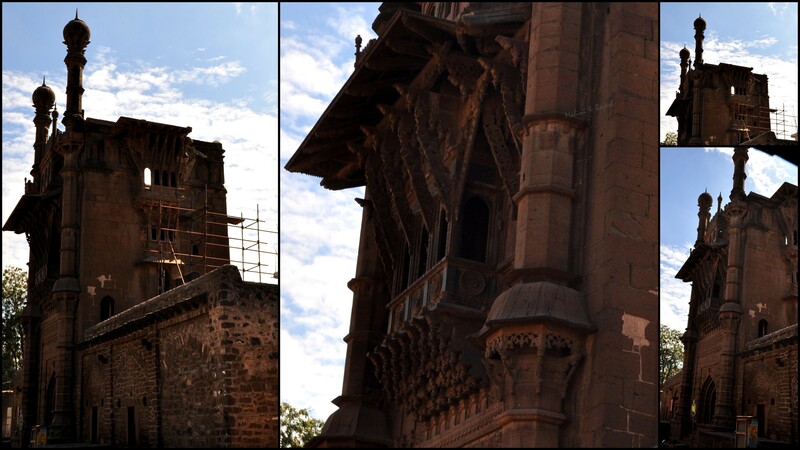 The main difference is in the stepped tower over the main shrine. 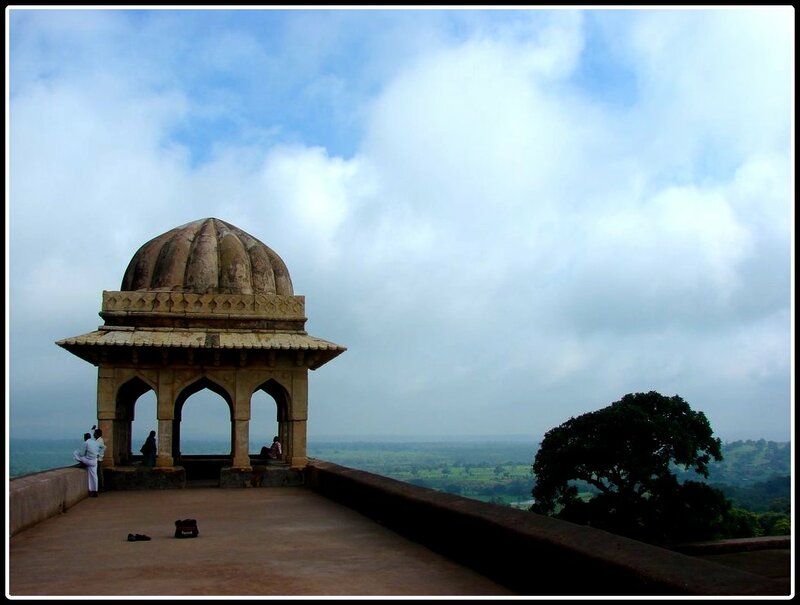 Hemakuta hill is an excellent vantage point. 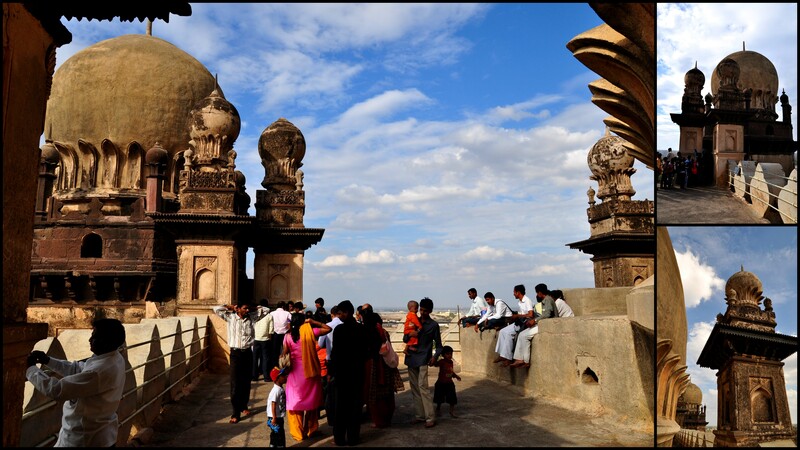 Other than the Virupaksha temple and the bazaar, a lot of other temples and ruins can be spotted from the top. Sun or no sun, a lot of tourists had come to enjoy the light cool breeze of the evening. It was time for us to leave. 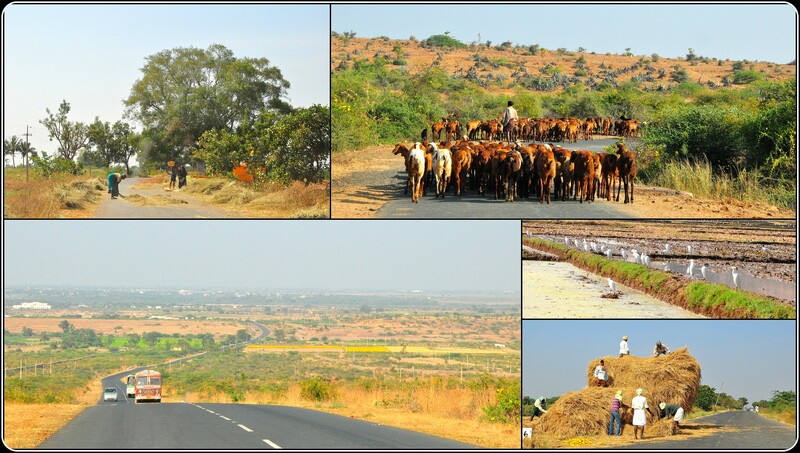 Return journeys are the most toughest. What we did figure out, though, was that this journey was so worth it. The sky was a little overcast the next morning. We decided to go for a walk before breakfast. 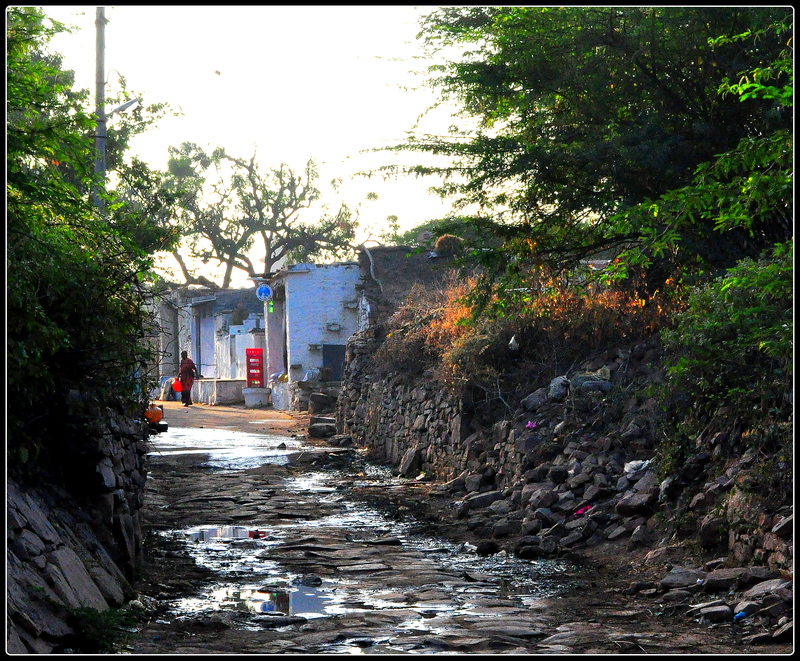 Taking a mud path, we walked, enjoying the bird songs and the cool breeze. 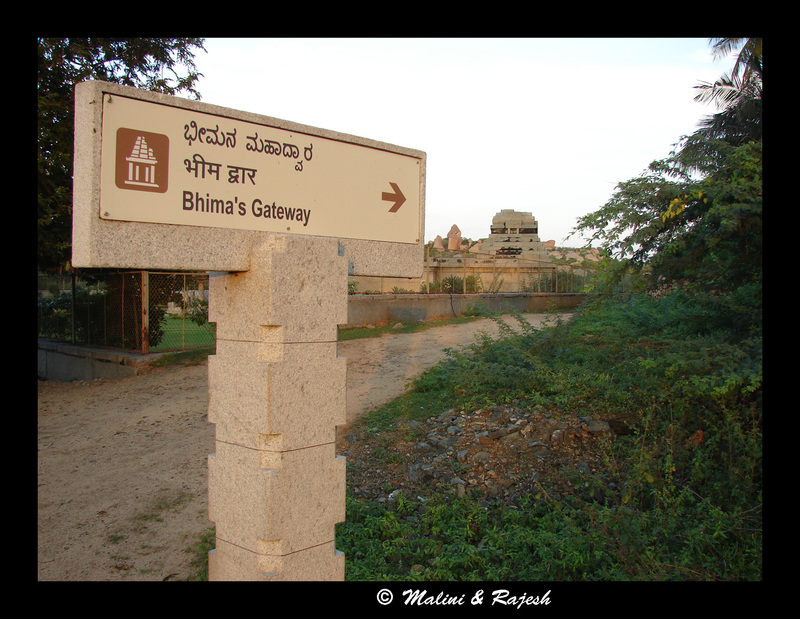 The mud path led to a board that said ‘Bhima’s gateway’ beyond which was an arched gateway. 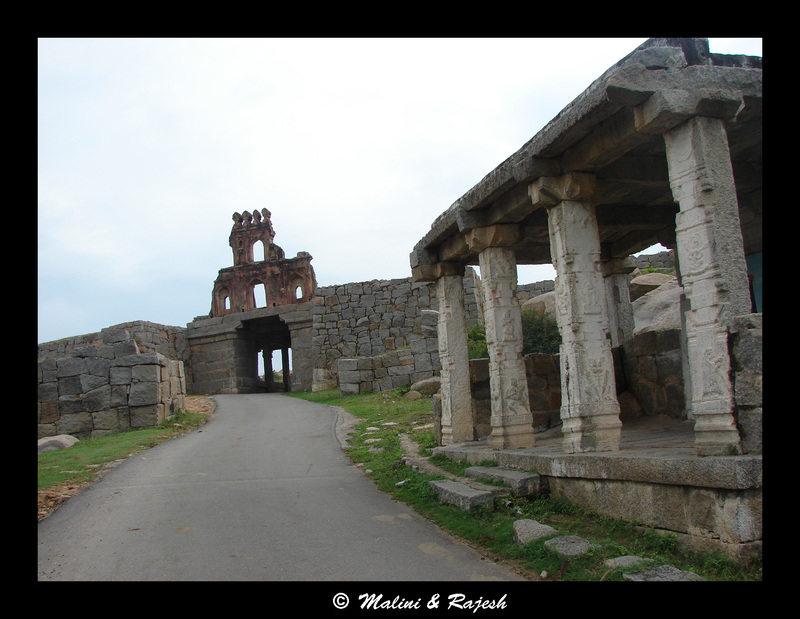 The gate led into a courtyard which had a lot of stone carvings depicting the stories of Bhima. 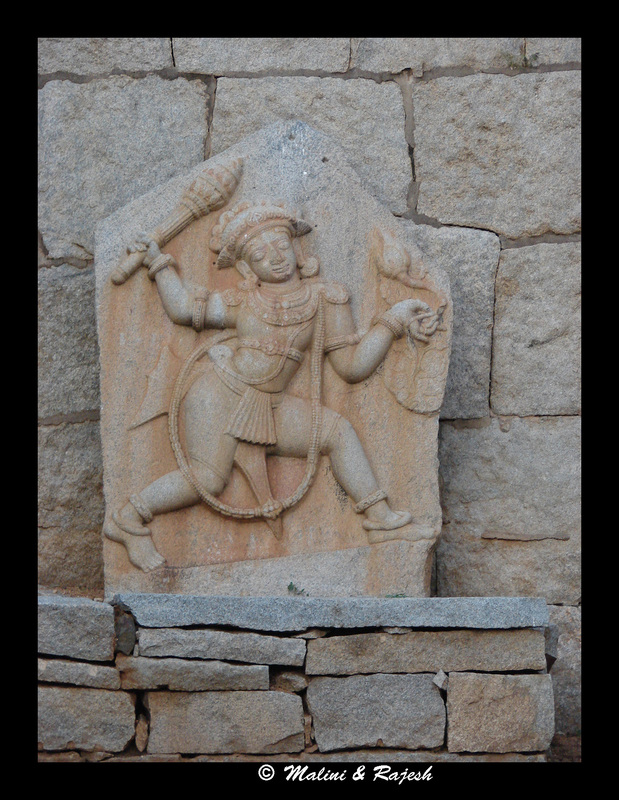 One carving shows Bhima carrying the ‘Sowgandhika’ flower. 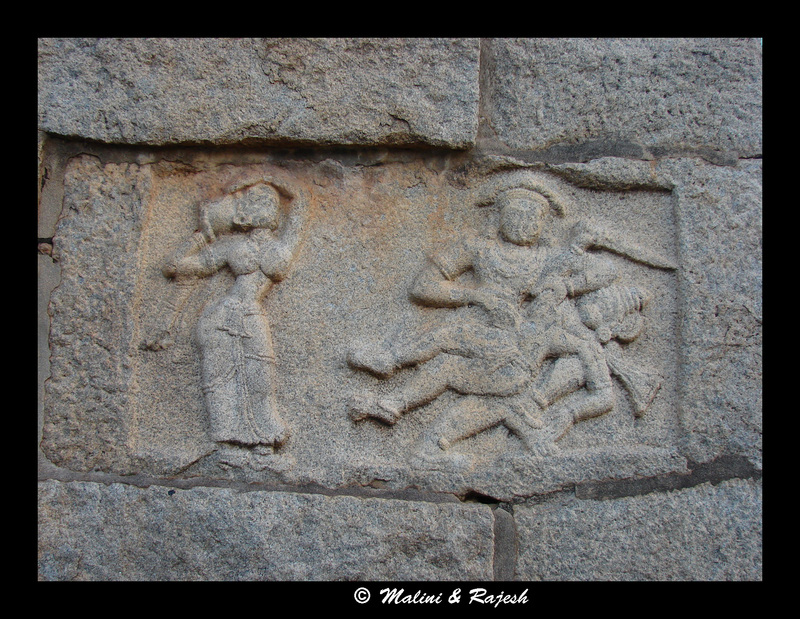 Another one shows Bhima killing Keechaka. 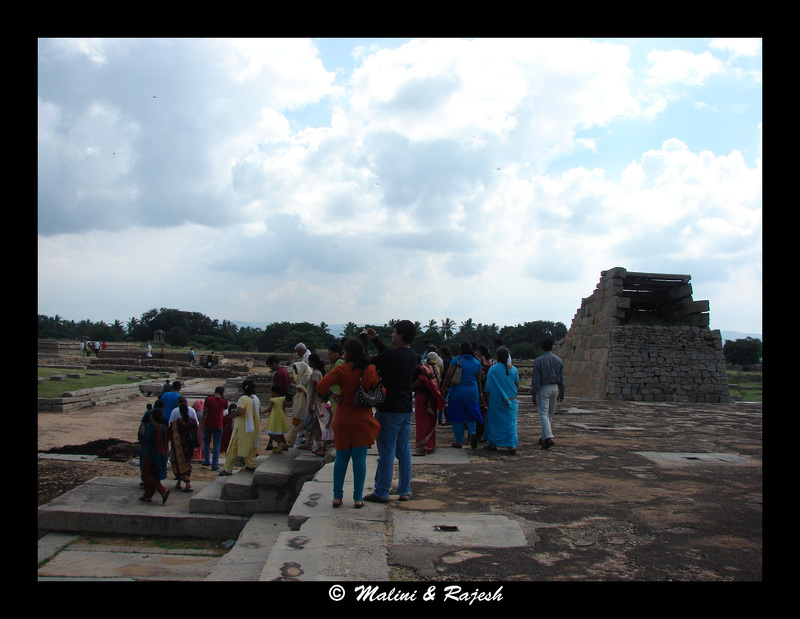 Draupadi is standing nearby watching the scene. 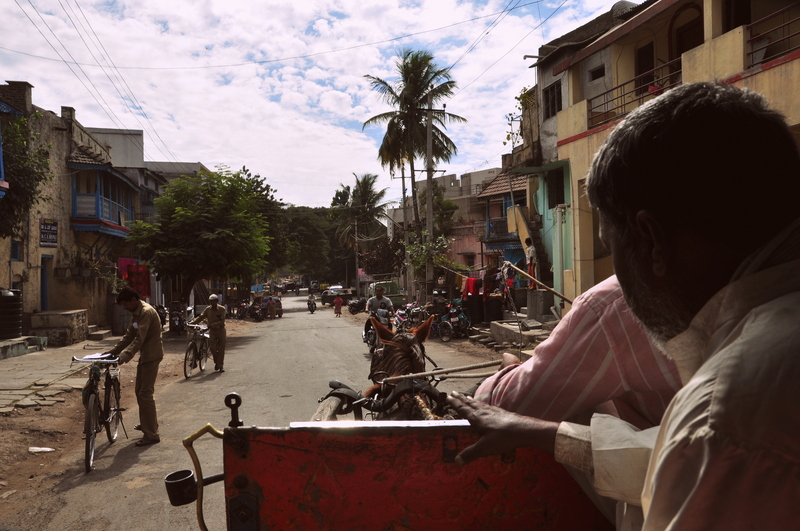 After breakfast, we hired an auto rickshaw to take us to Hampi bazaar. It had started to rain. The drizzle did not dampen our spirits. We were trying to see the positive side of it. Rain can give a totally different texture to any landscape. 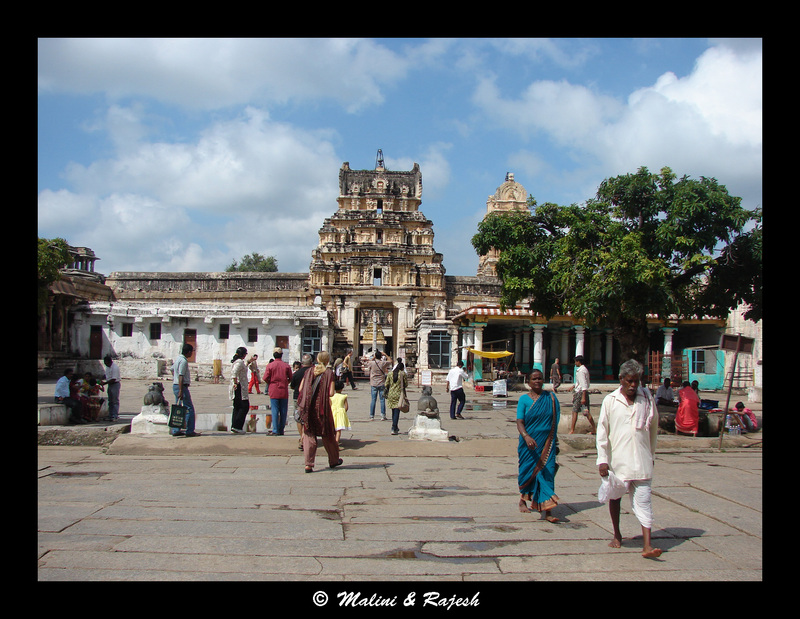 We walked through the Hampi bazaar, in the opposite direction of the Virupaksha temple. 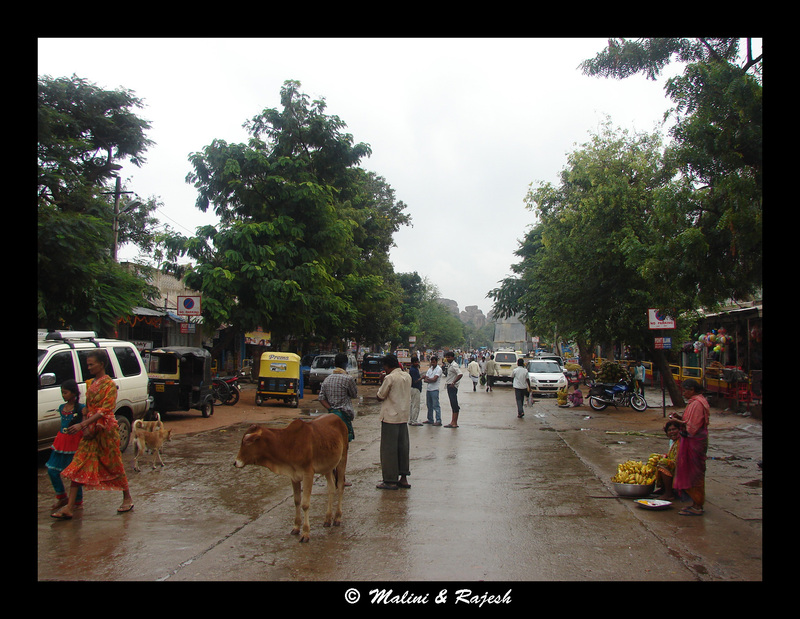 The bazaar was slowly waking up to a wet morning. 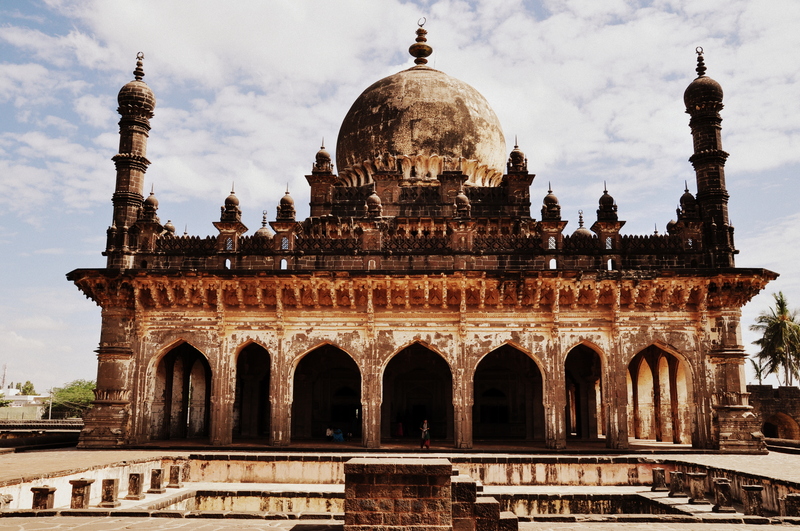 At the end of the bazaar is a huge idol of a bull called the monolithic bull. A lot of monkeys were swinging around. 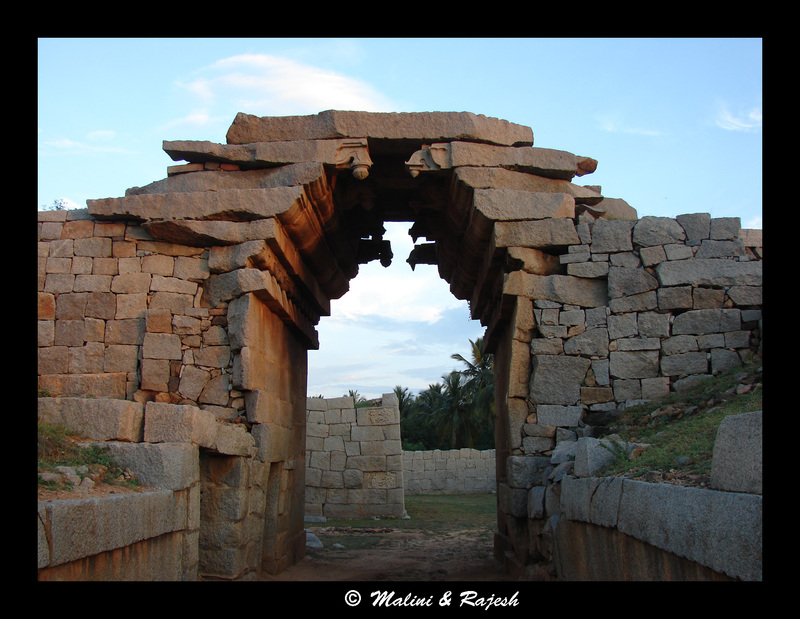 The steps from the bull led to a small mandapa from where the Virupaksha temple could be seen. 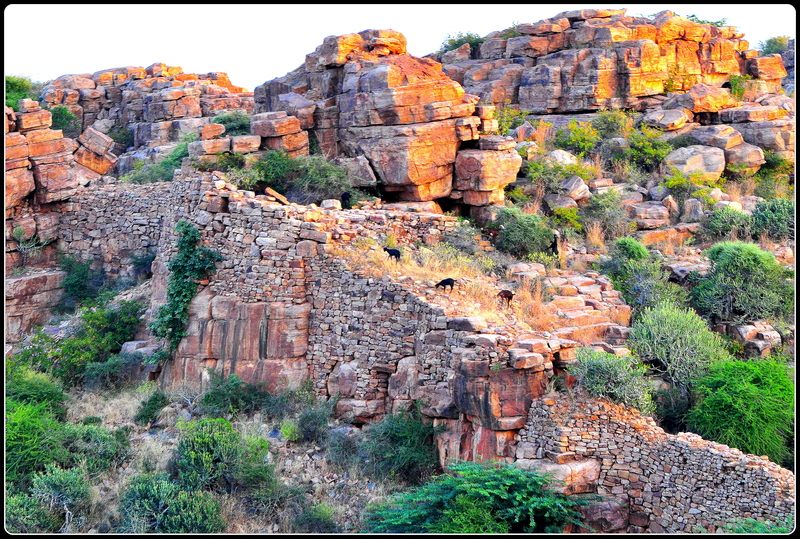 Further up, was a small Hanuman temple. A lady, who was sitting in front of the temple, gave us ‘prasad’. 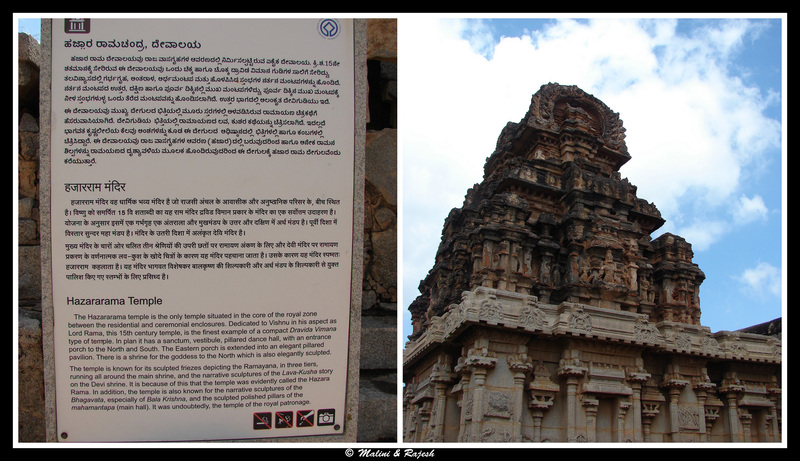 From the Hanuman temple, we climbed down a few steps to reach the Achutharaya temple complex. 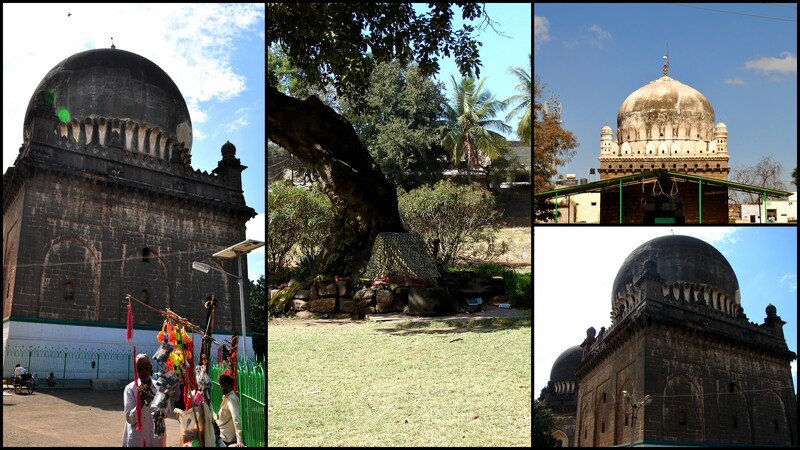 Located at the foot of Matanga hill, this large temple complex has a Devi shrine at the center. 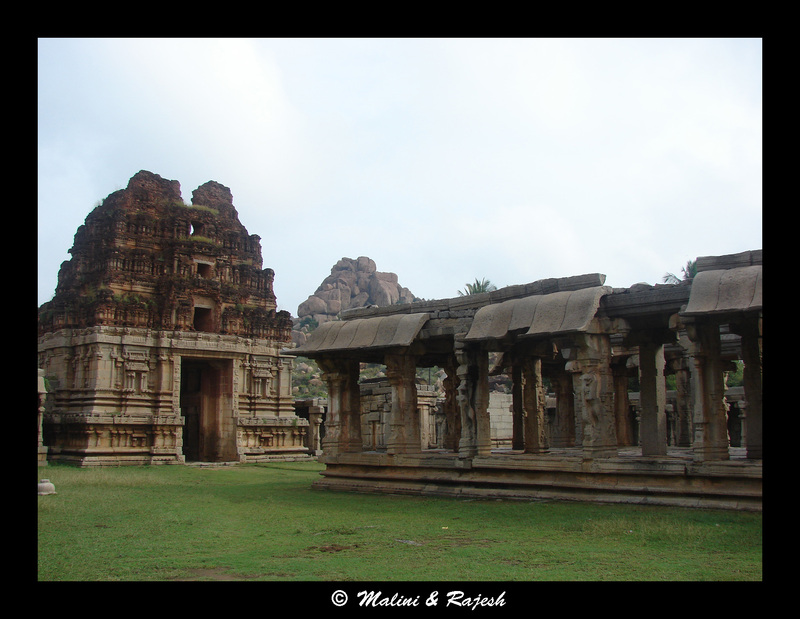 This temple, as the other temples in Hampi, has many gopuras. 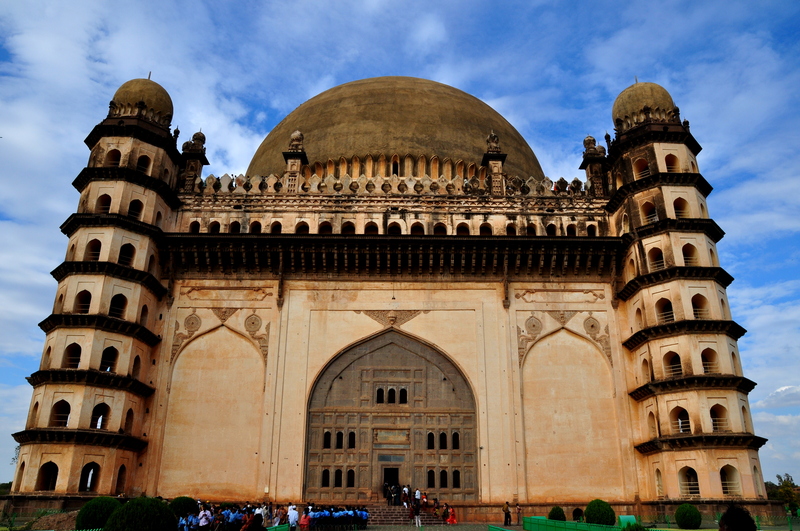 The outer courtyard has a large gopura on the northern side which is also the main entrance and the inner courtyard has three gopuras, on the north, east and west. 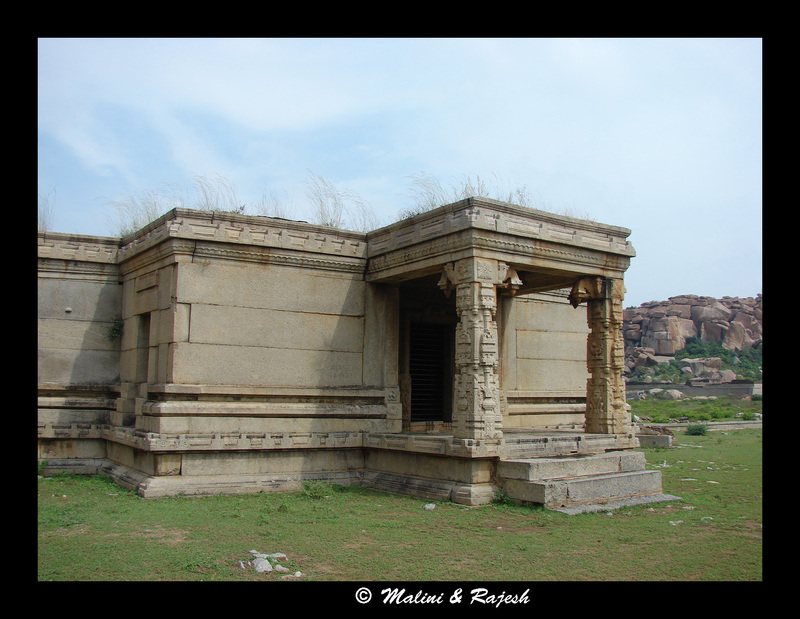 There are various pillared mandapas around the courtyards. 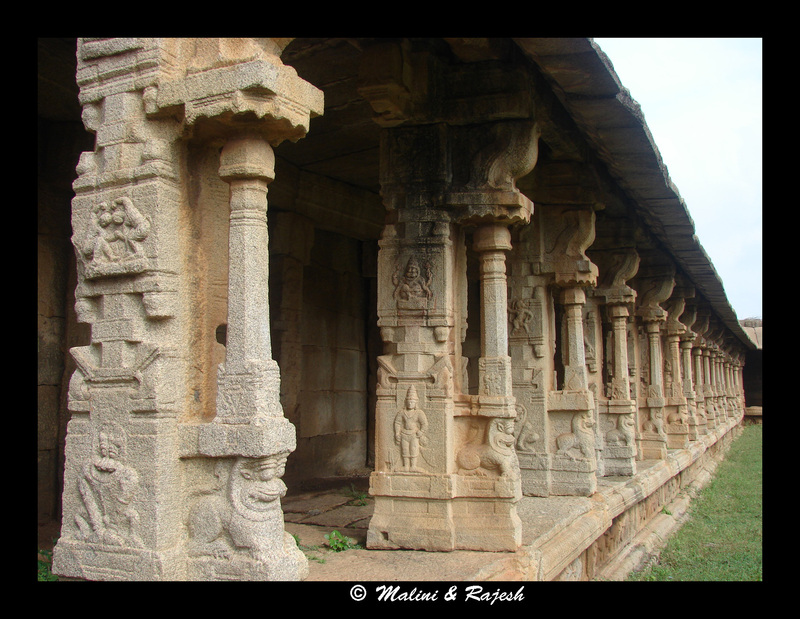 Most of the carvings depict stories from Ramayana. 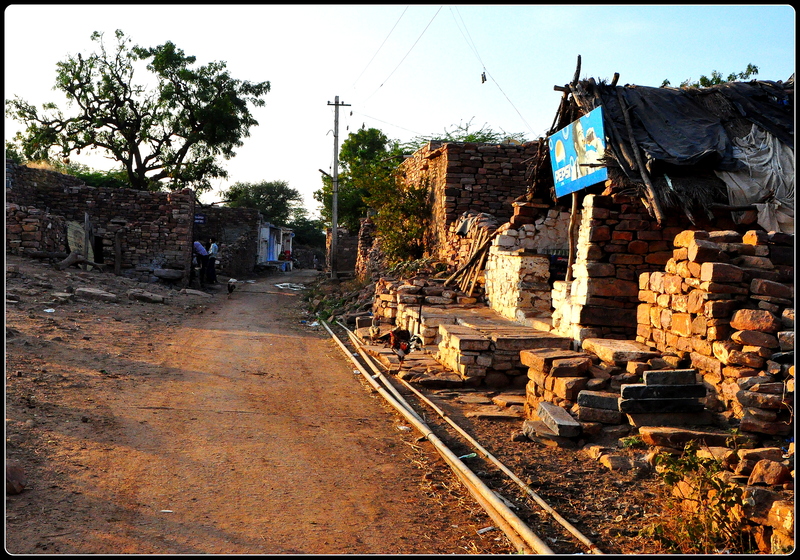 Right outside the temple are the ruins of a long street or bazaar once famous as the Soolai bazaar or dancing girls’ street. 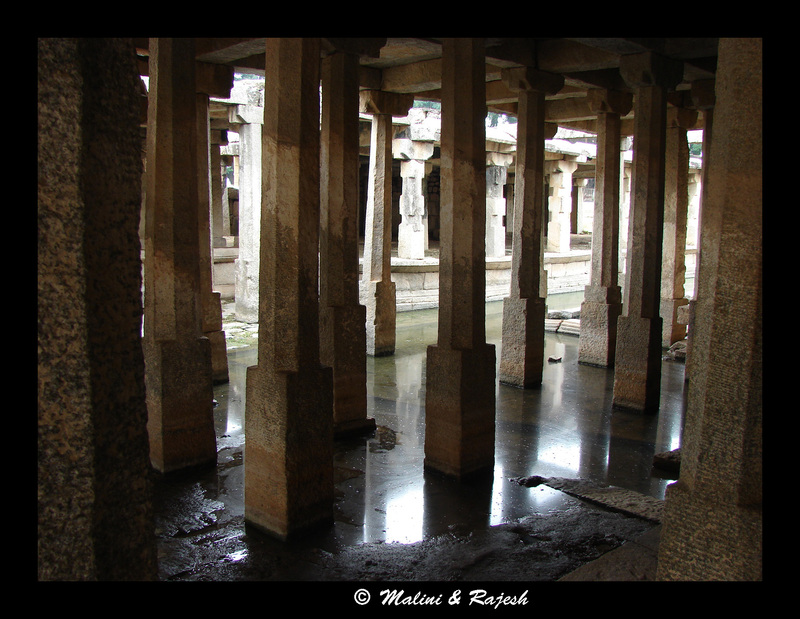 At the end of the bazaar is a beautiful water tank with steps on all sides and a small mandapa in the center. From the tank we walked further to our right and reached a small cave called the Sugriva’s cave. 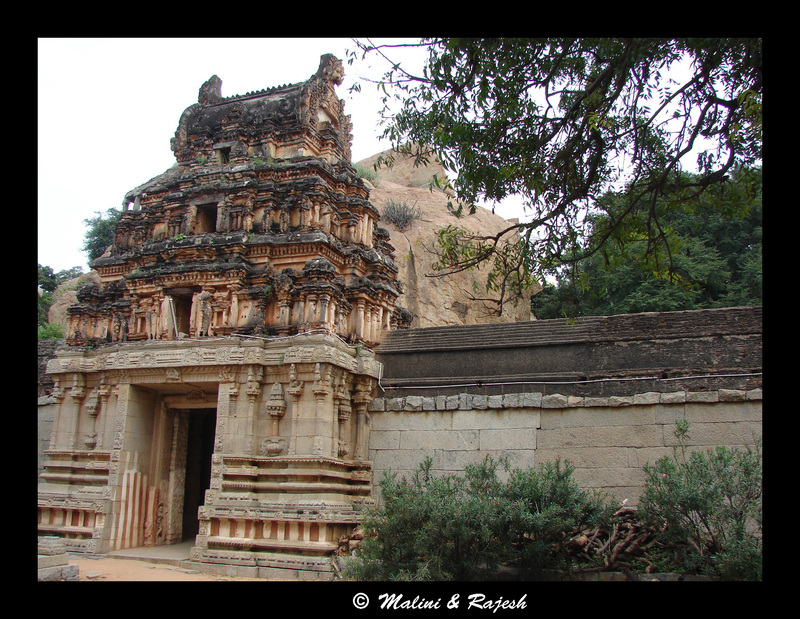 The legend is that Sugriva kept Sita’s jewels inside the cave. 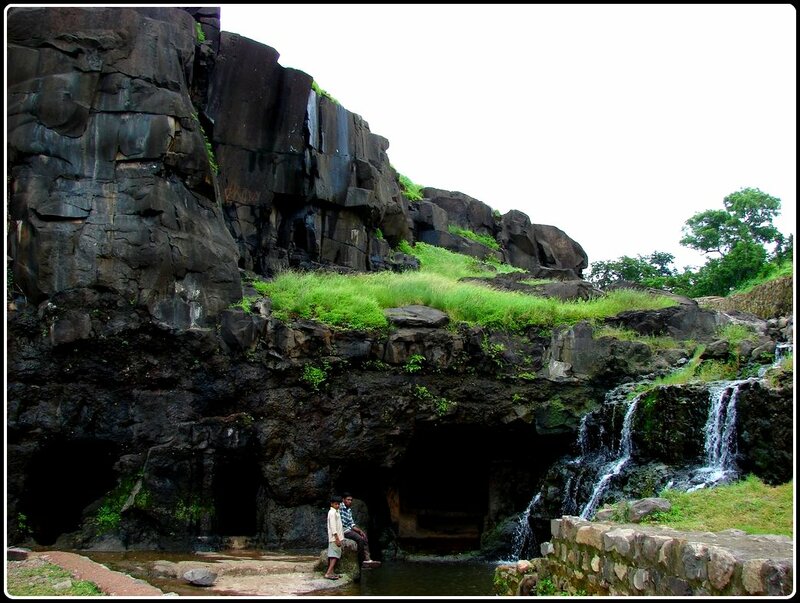 Right outside the cave is a pool called Sita sarovar. 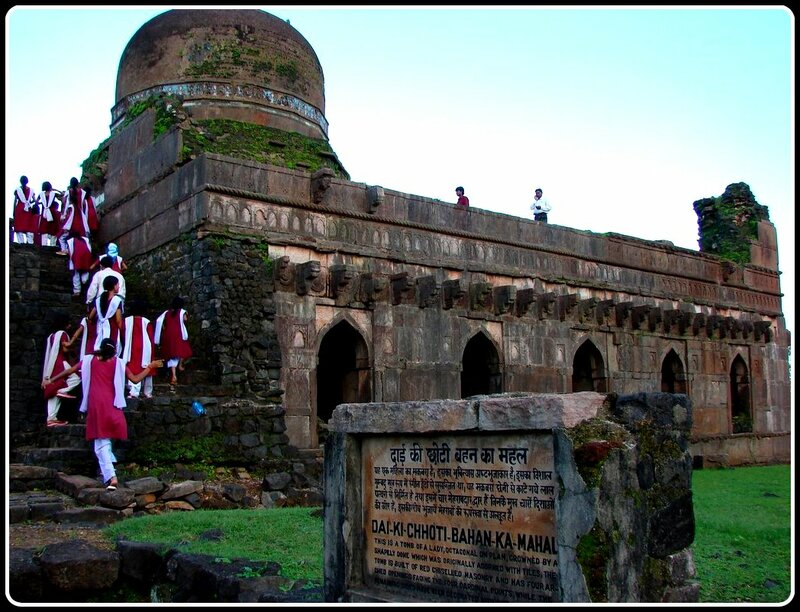 Opposite to Sugriva’s cave is another temple which has a stepped tower over the shrine, thus making it look like a Jain temple. 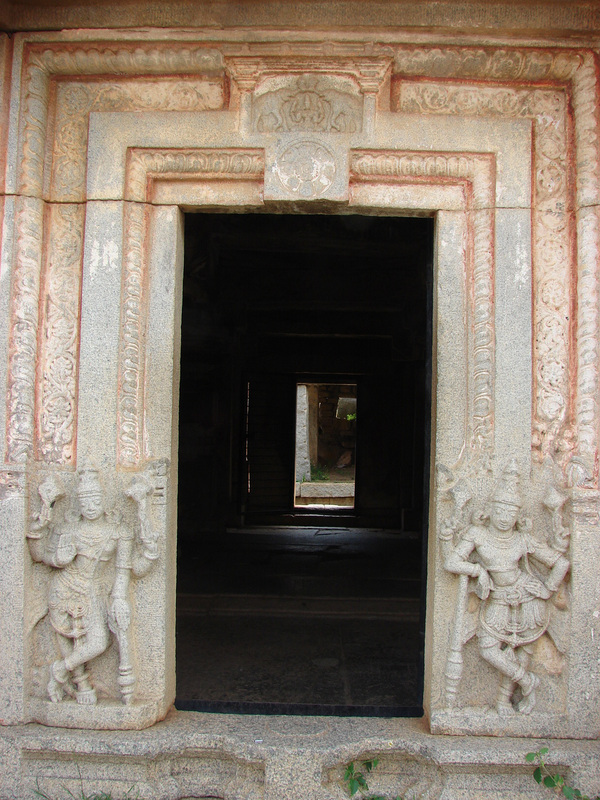 But there are a lot of Vaishnavite sculptures in the temple like the two dwarapalakas at the entrance. 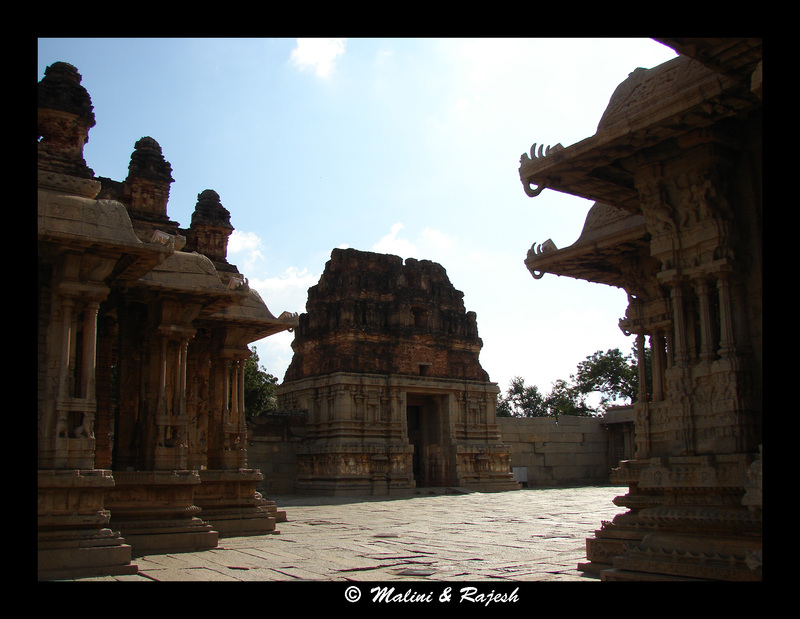 The temple has a two-storeyed mantapa which is reached by a flight of stone steps. 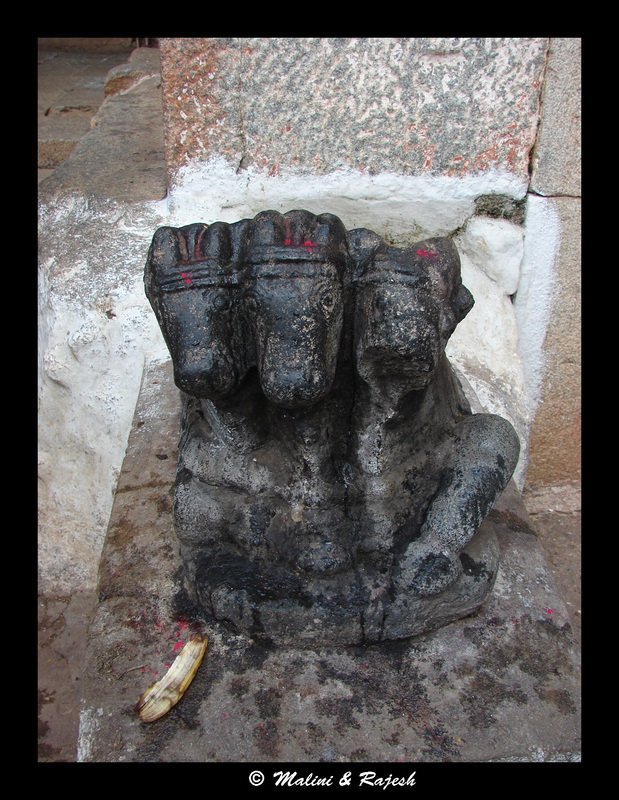 In front of the temple is a stone deepasthambham. 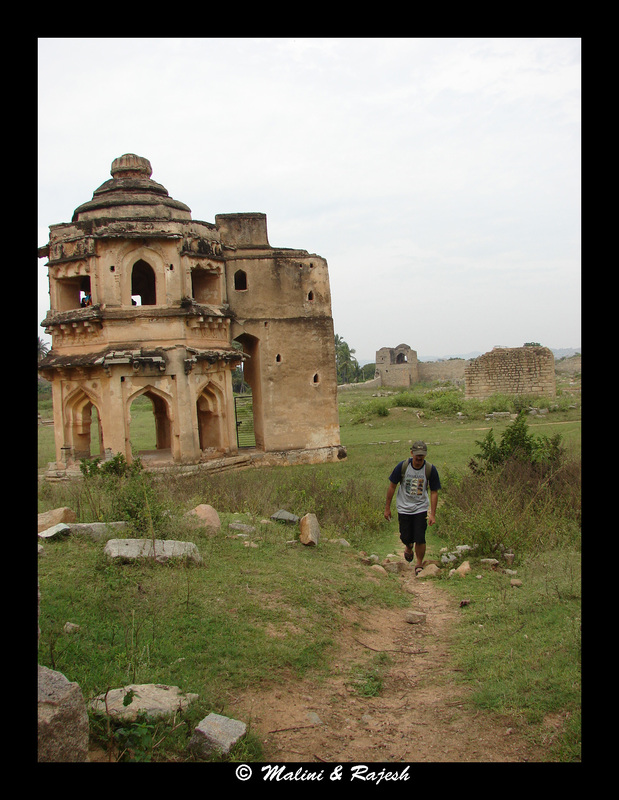 The path further leads to a gateway popularly known as the King’s balance. This balance was used for weighing the king against gems and gold during auspicious occasions. 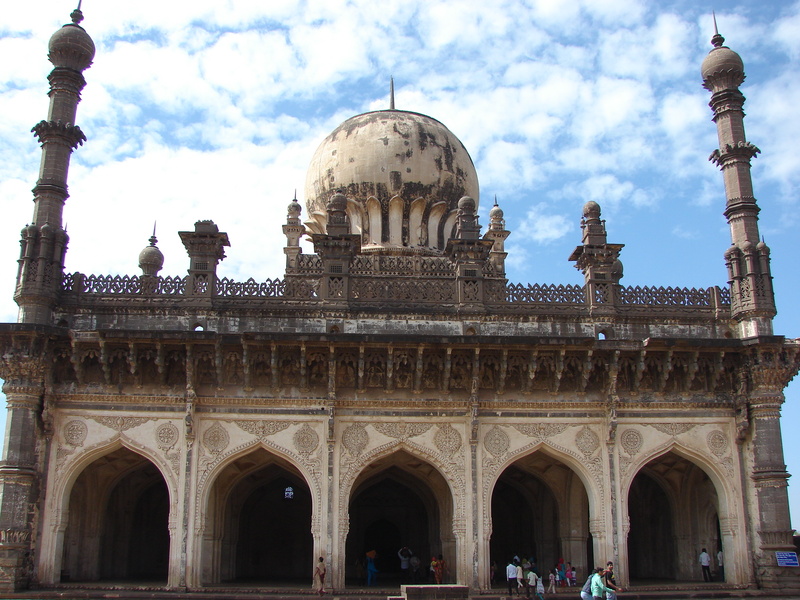 The balance has two huge granite ornate pillars supporting a stone beam. 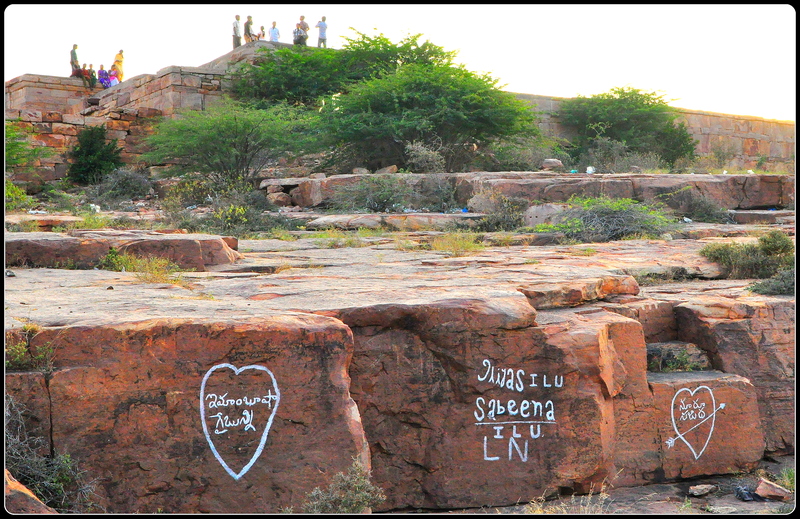 There are a number of ruined shrines near the balance. 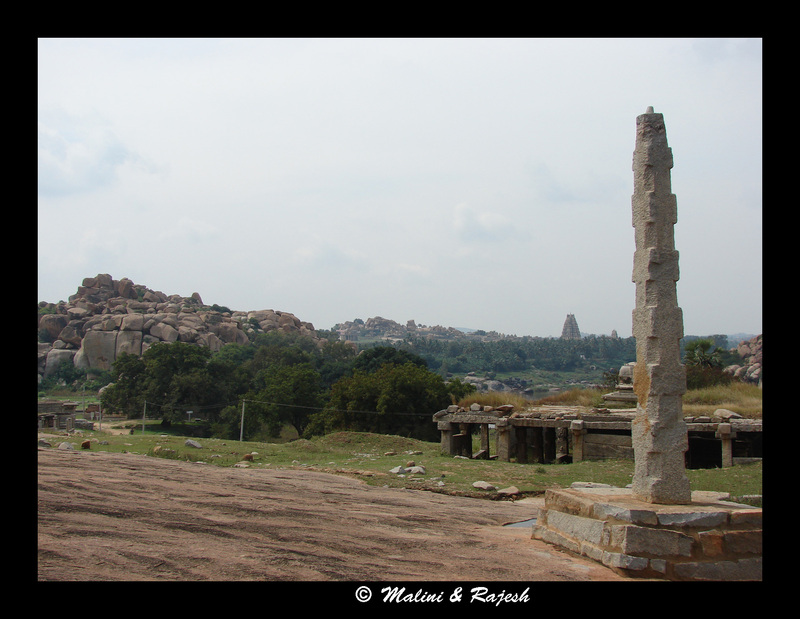 On the opposite side of the balance is the ruins of a structure called the Raya-gopura which has tall pillars. 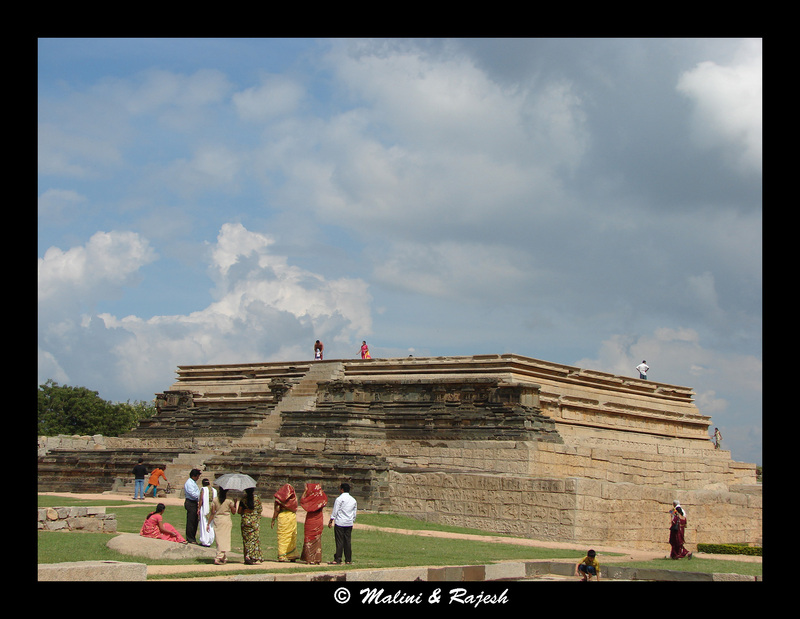 Behind the Raya-gopura is a Vishnu temple which was closed for renovation. We started walking back. 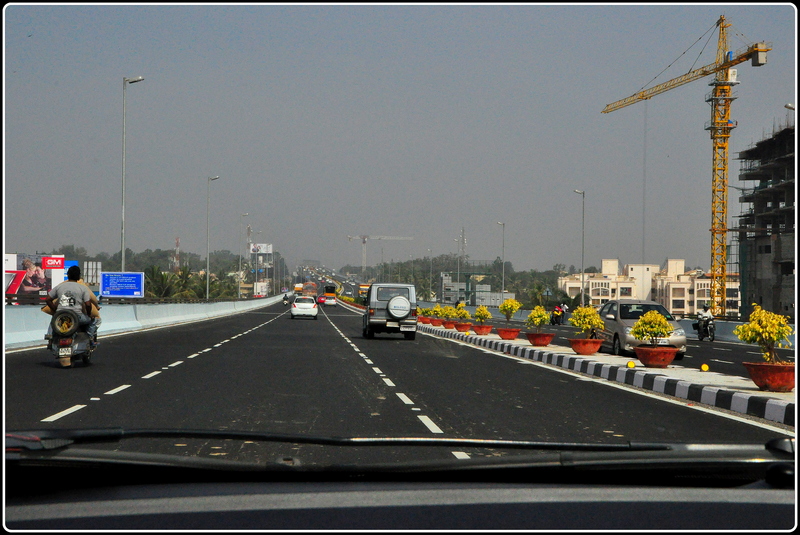 We were to reach the Soolai bazaar from where we had taken a right. 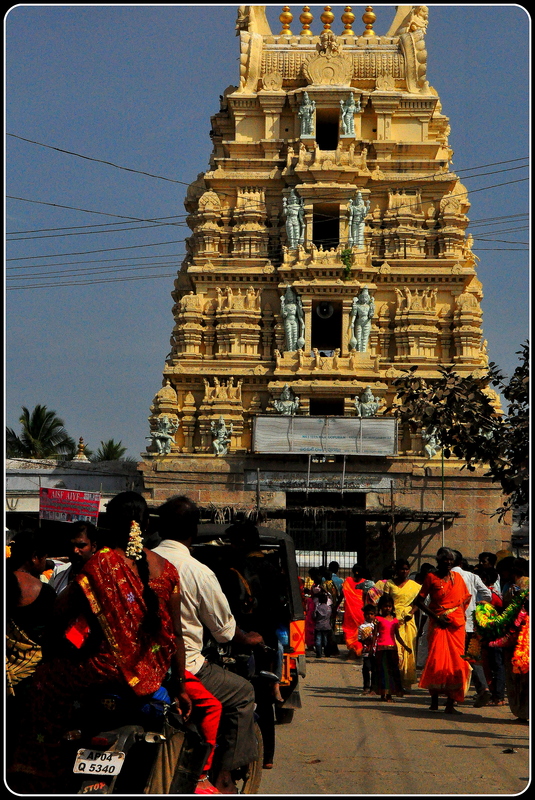 We walked past the Soolai bazaar and reached the Kodandarama temple. 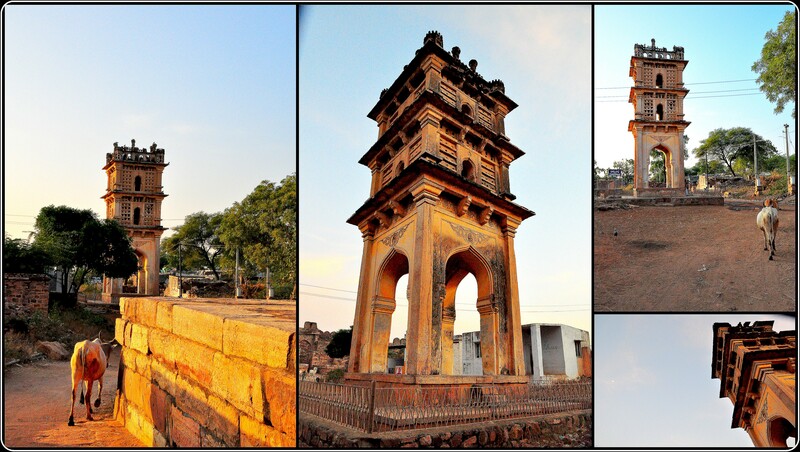 The temple stands on the banks of Tungabhadra river, opposite the chakratirtha, a bathing ghat. 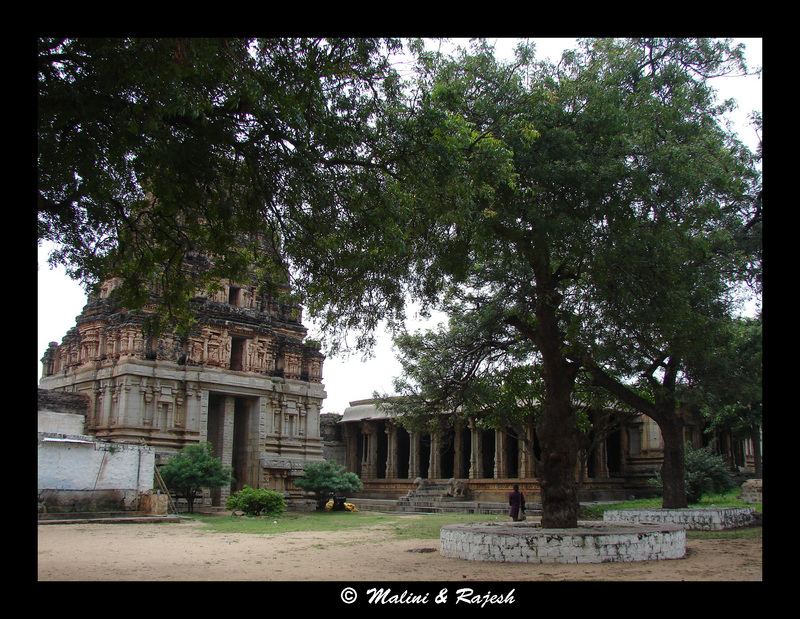 The temple contains the standing figures of Rama, Sita and Lakshmana. 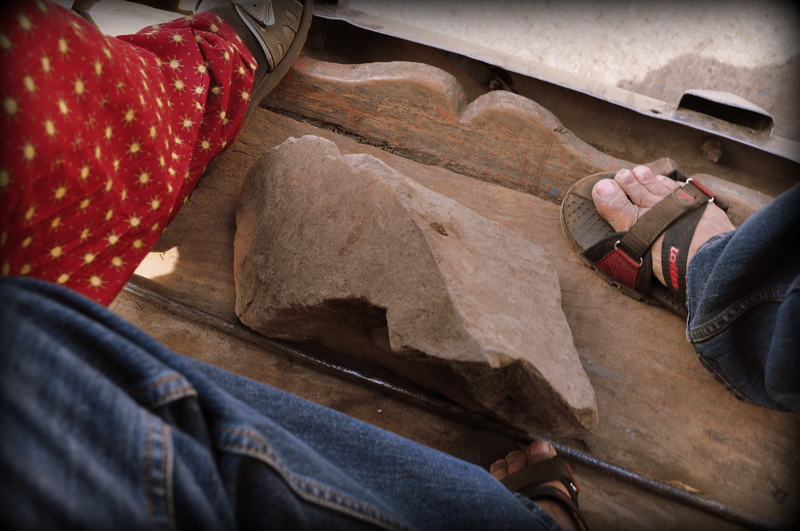 We rested for a while on the banks watching people crossing the river on coracles. It was way past lunch time. There was a small restaurant on the banks of the river, where we had lunch. 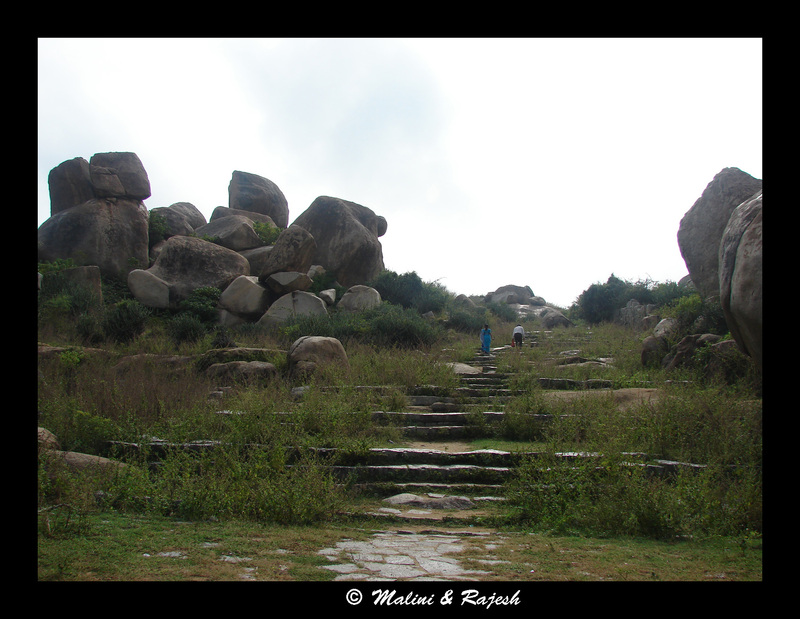 After lunch, we then took a stone paved pathway, passed by some huge boulders that took us right back to the monolithic bull. 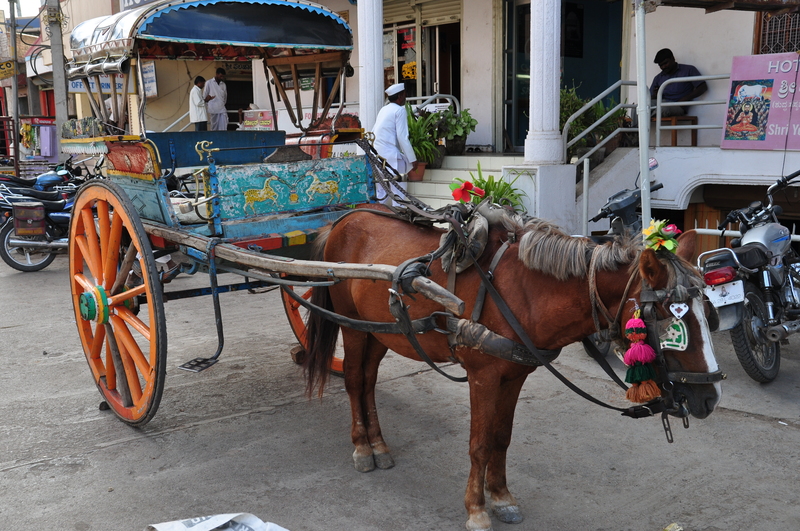 We then walked to Hampi bazaar, did some shopping and then took an auto rickshaw and returned back to our hotel. But not before finalizing our next days plan. We were to rent a moped for the next day. 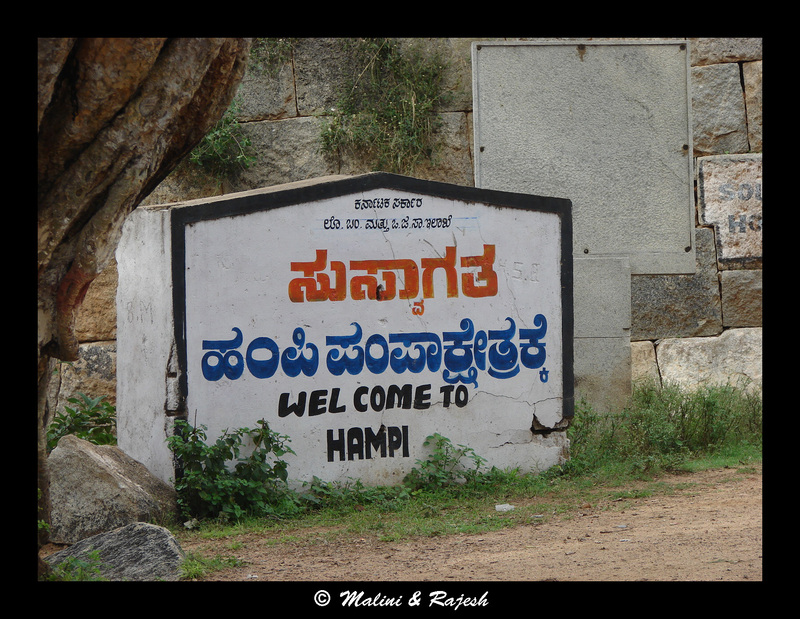 By 8 am we had reached Hospet, a sleepy nondescript town, 20 km from Hampi. 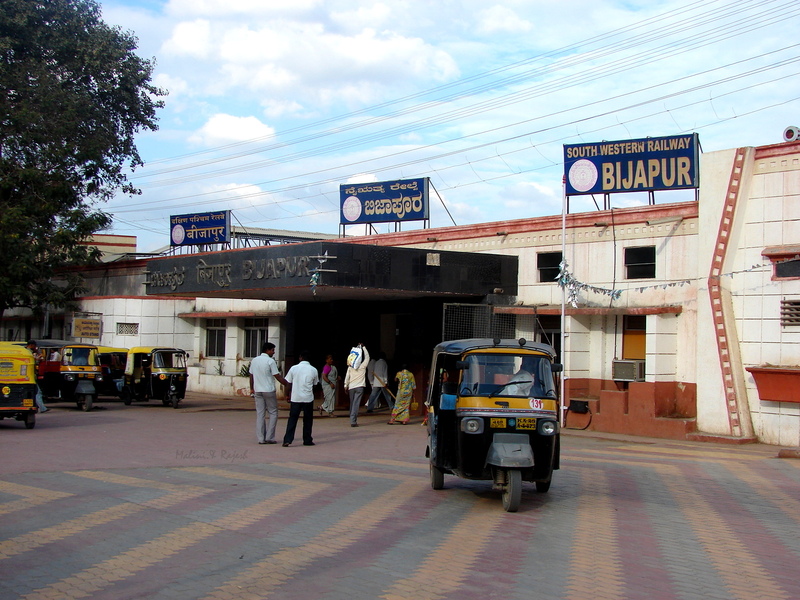 We took an auto from the bus stand to the Karnataka State Tourism Development Corporation (KSTDC) owned Mayura Bhuvaneshwari. 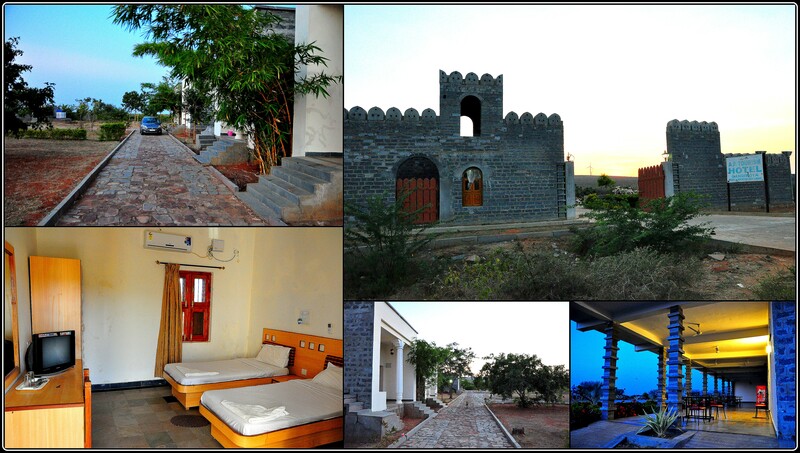 Mayura Bhuvaneshwari is an ideal choice to stay in as it is very close to Hampi. 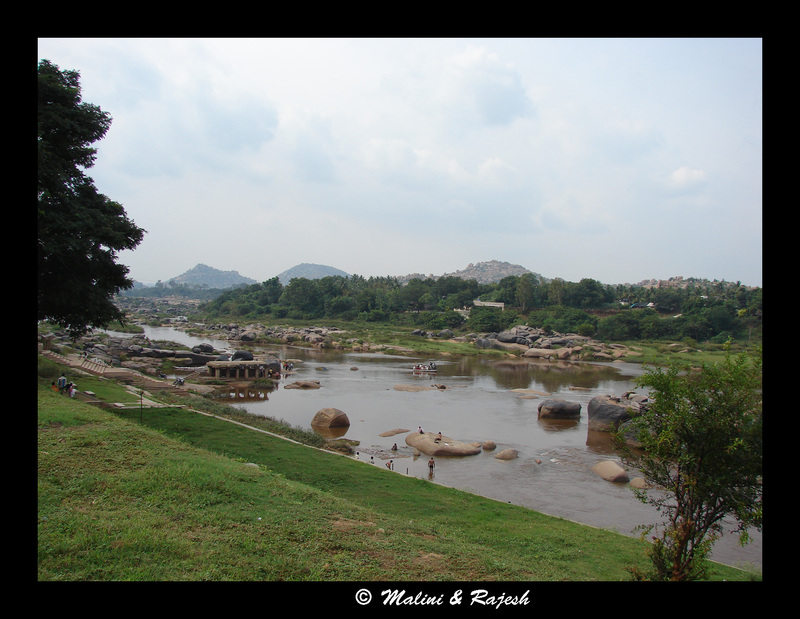 Hospet is a bit too far off for anyone keen on staying in the thick of the Hampi action. 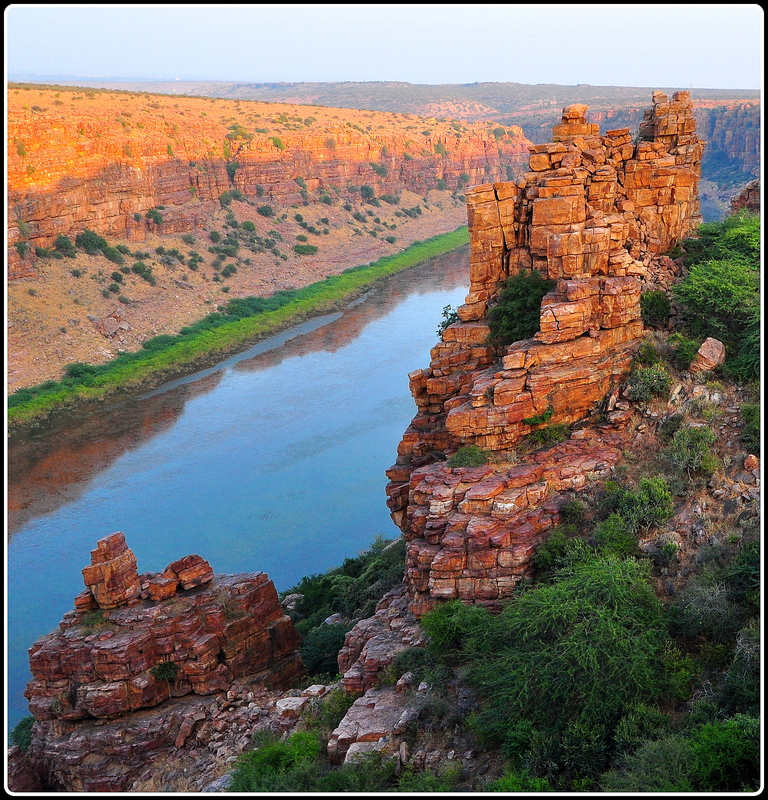 This resort is in Kamalapura and it is a further 4 kms to Hampi Bazaar but a much better bet than the accommodation options in the Bazaar area. 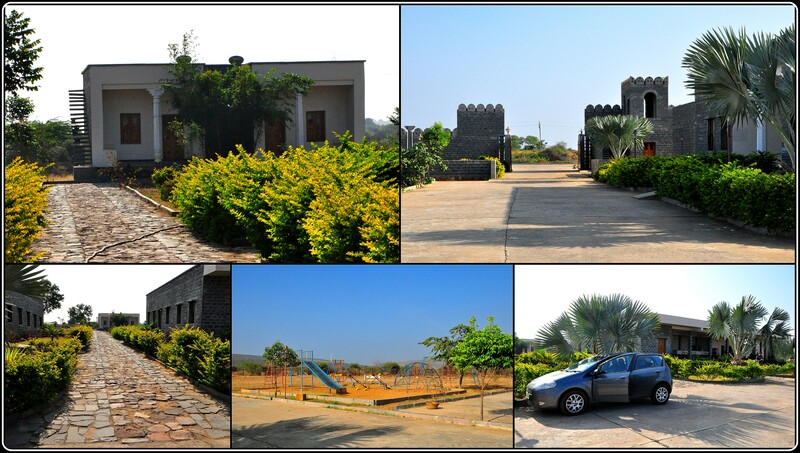 The complex is sprawling and peaceful and has a laidback charm to it. 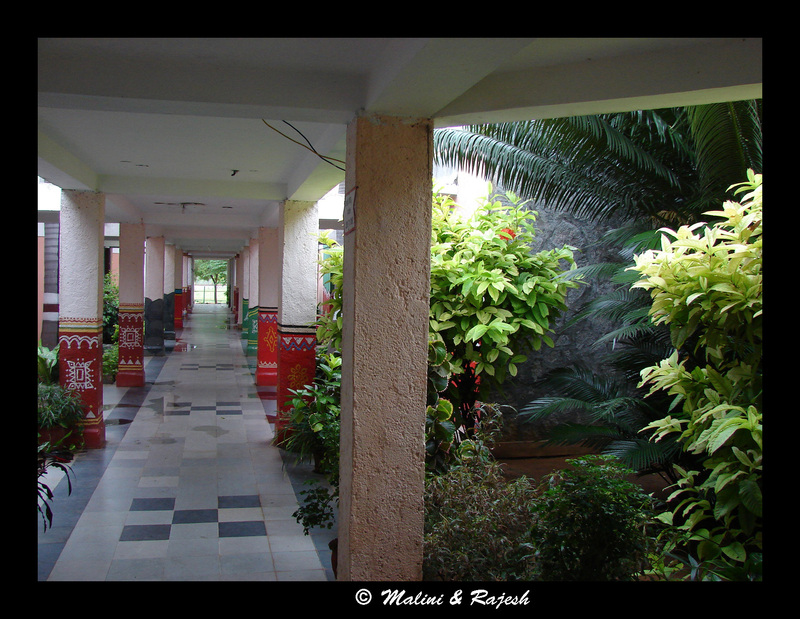 The reception area takes you into a large courtyard which doubles up as the dining area. 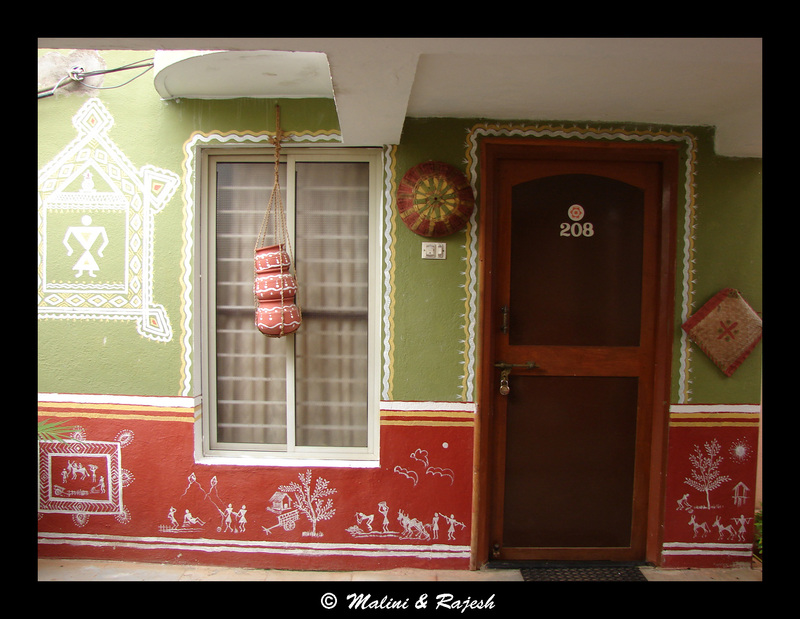 Besides the lovely photos of Hampi that hung on the walls, the rooms had some endearing artwork both outside and inside. Before checking in, the manager told us that KSTDC was conducting a one day guided tour to all the major points. 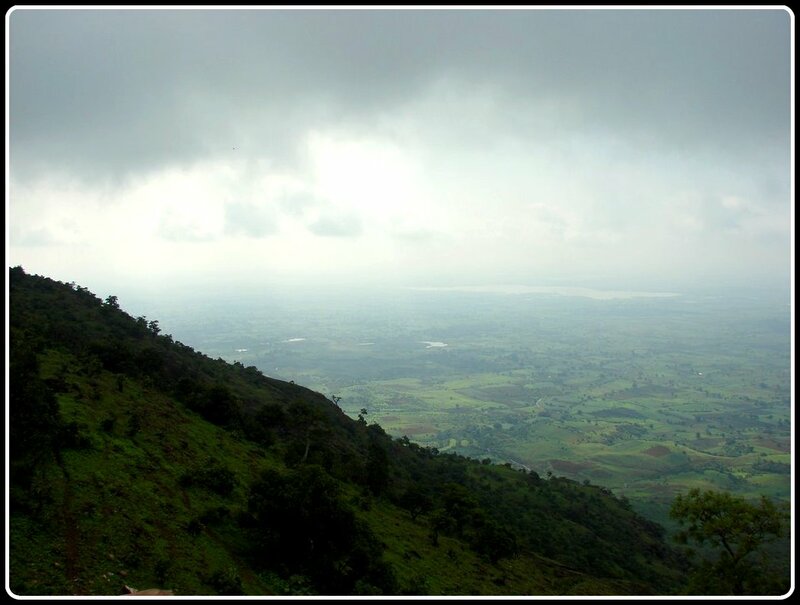 We thought, to get a better idea of the place, it would be better to go for it. 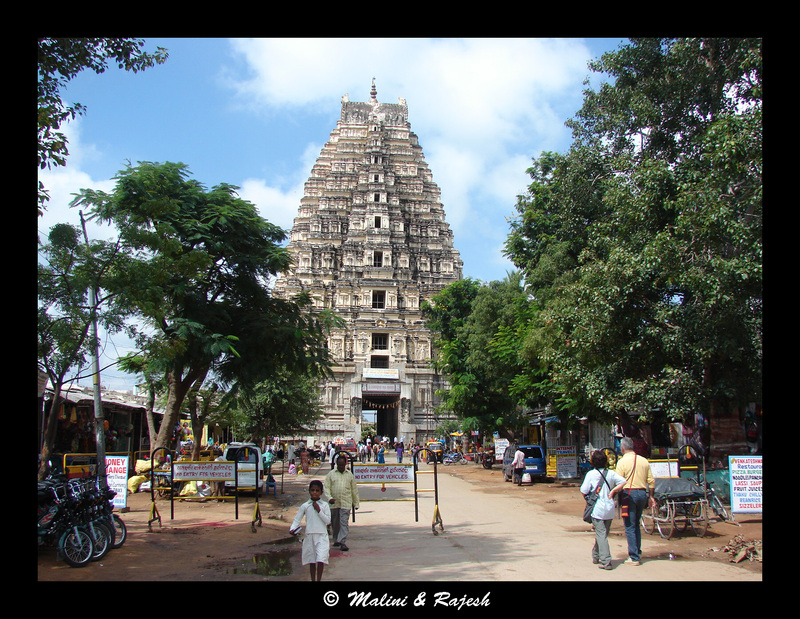 By 10.30, we boarded the KSTDC bus and were on our way to Hampi bazaar to see one of the most important temples in Hampi, the Virupaksha temple. Today, we decided to be tourists. 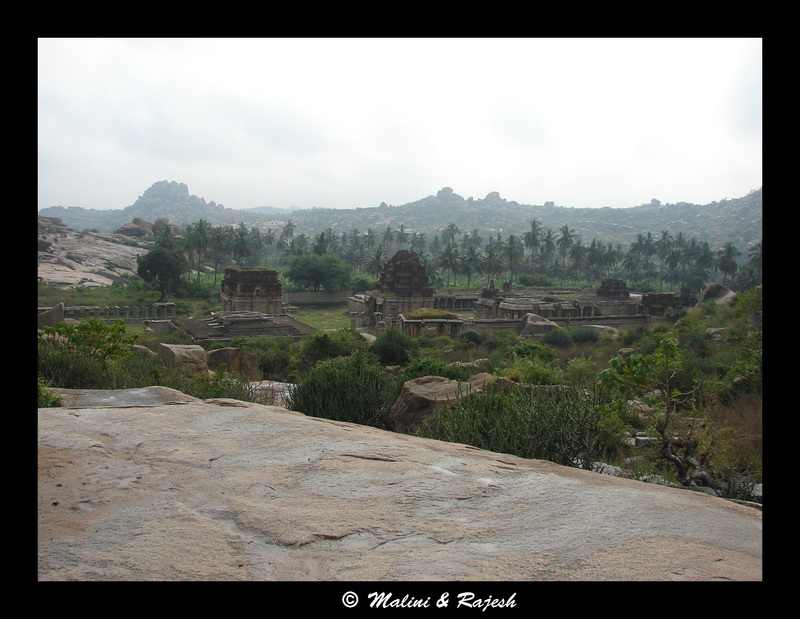 From whatever research we did on Hampi, we came to understand that there were more than 1000 ruins in and around Hampi. 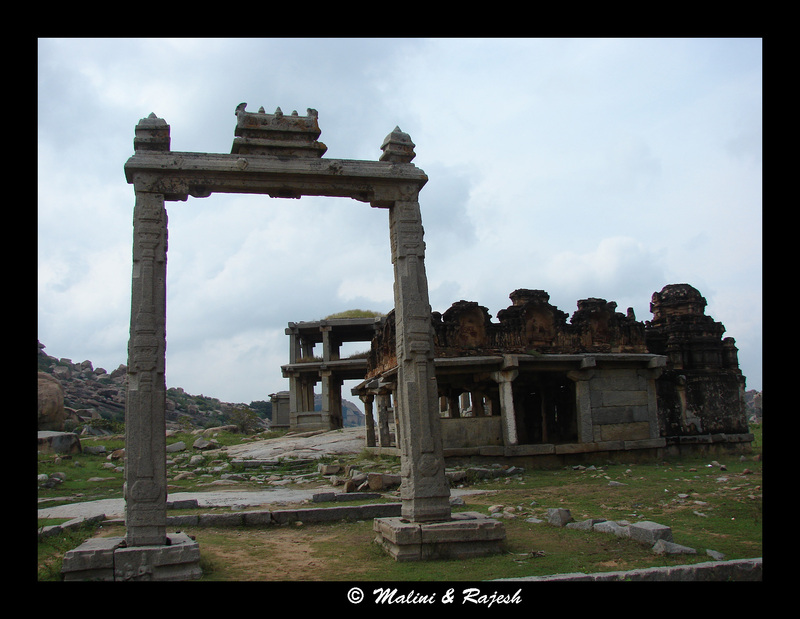 Hampi’s ruins are broadly divided into the sacred center (mainly the temples and mandapas) and the royal center (palaces, forts, gates etc). And to see them all in 3 days was no child’s play. 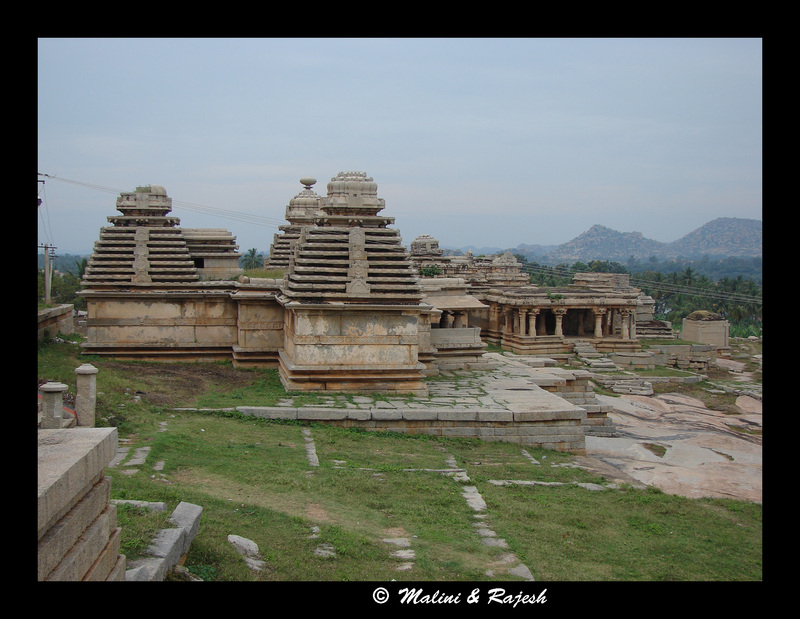 Virupaksha temple, one of the oldest and main temples in Hampi, is an important pilgrimage centre for the worshippers of Lord Shiva. 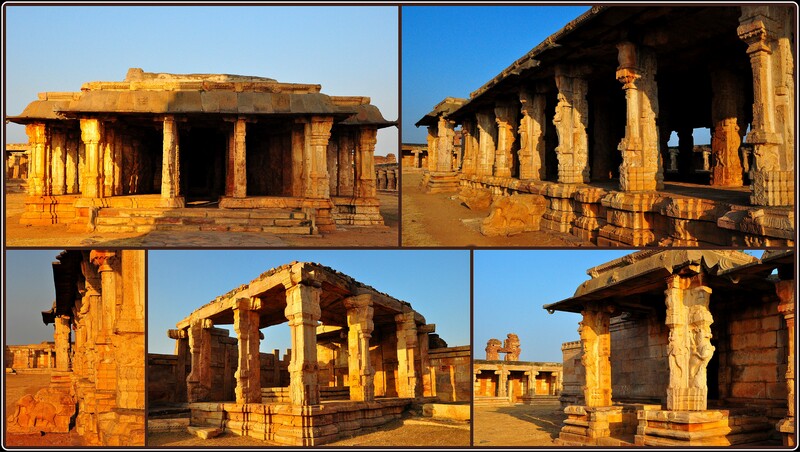 Located on the southern bank of Tungabhadra river, Virupaksha temple is said to be one of the oldest functioning temples in India. 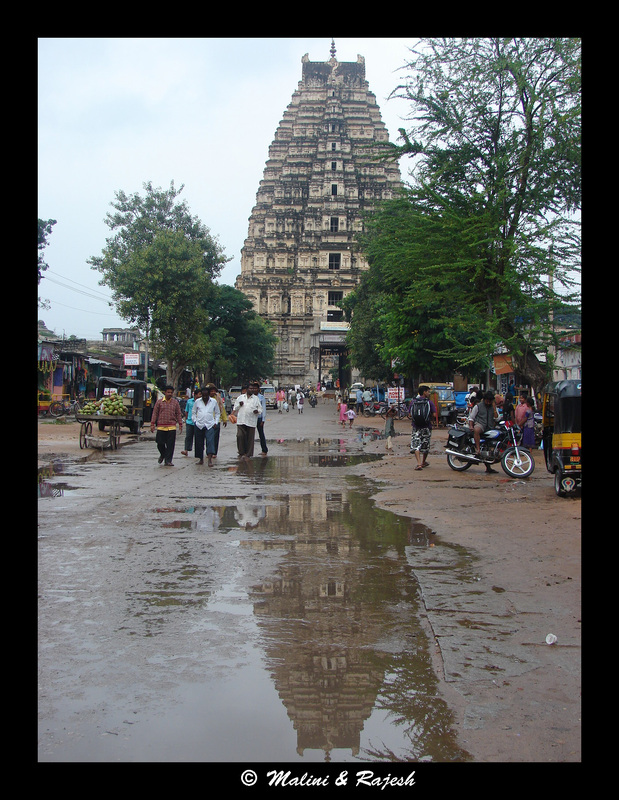 What stands out is the entry point into the temple, a 9-storeyed eastern gopura which leads to the outer courtyard. 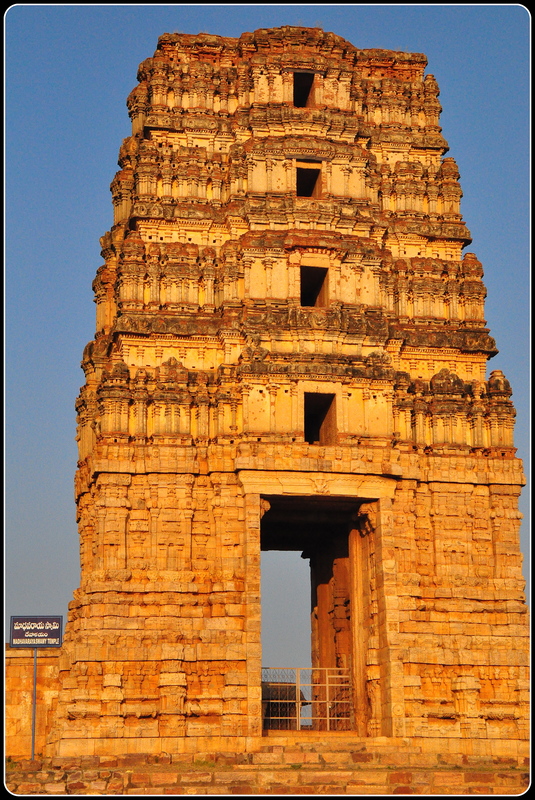 There is another gopura on the northern side too. 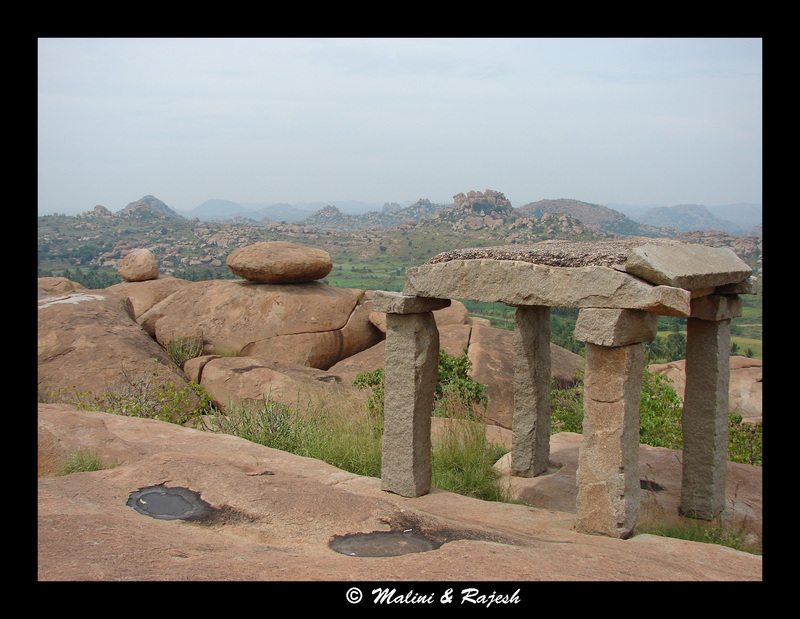 These gopuras are visible from almost anywhere in Hampi. 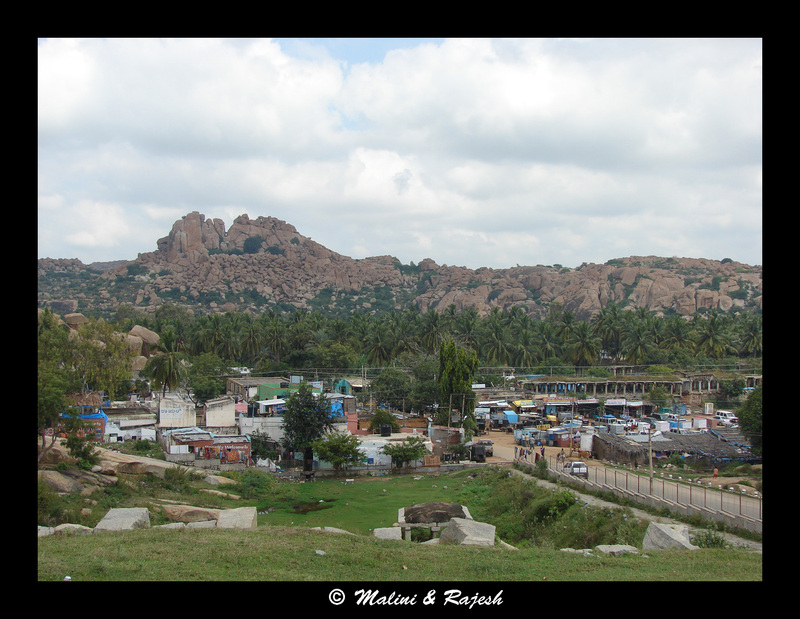 Right from the open restaurants in the Hampi bazaar from where one can endlessly gaze at those magnificent towers to the Hemkuta hills from where one can watch the sun set right behind the temple. 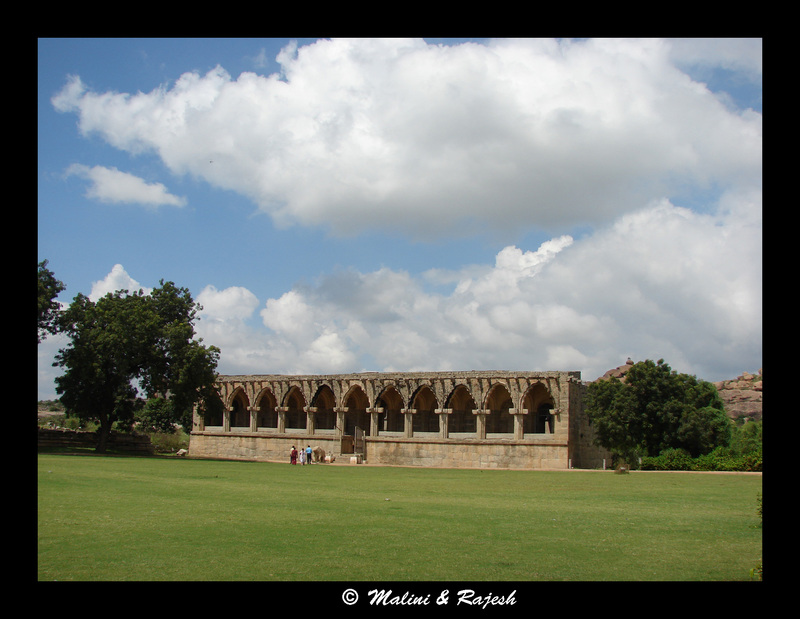 Upon entering the outer courtyard, on the left, a rare 3-headed Nandi is found. 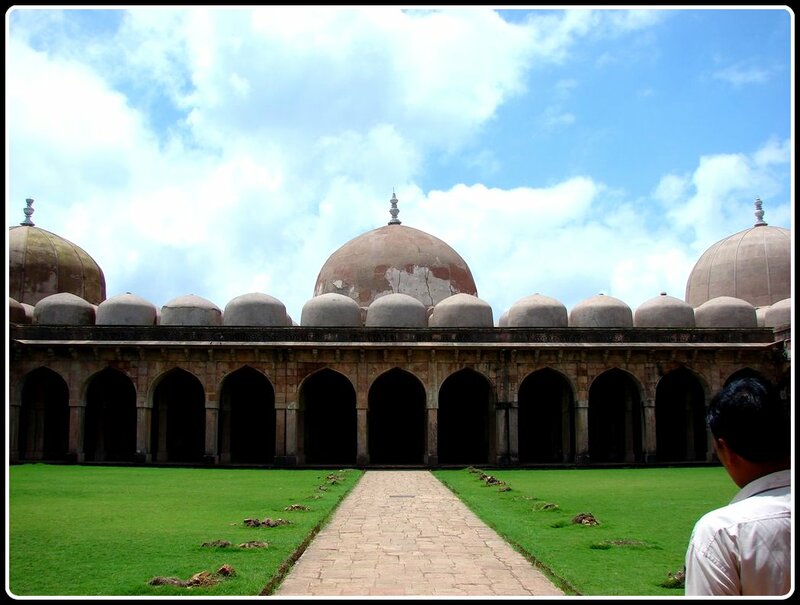 Other than the many small shrines present in the courtyard, the major structures found in the outer courtyard are the Phalapuja mandapas. 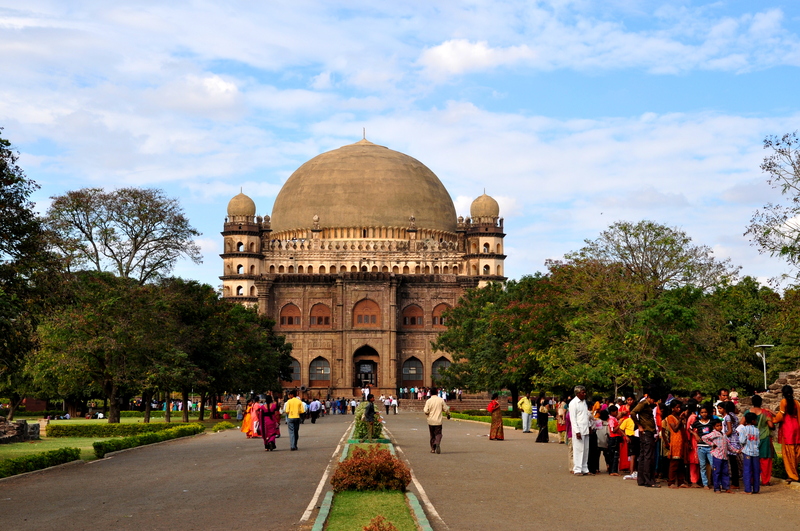 The outer courtyard is connected to the inner one by a small 3-storeyed gopura. 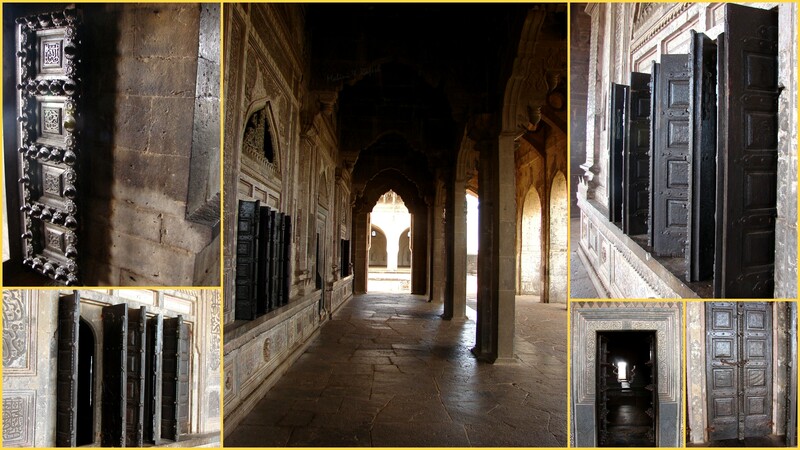 The inner courtyard has pillars running on all the four sides with a rangamandapa in the center. 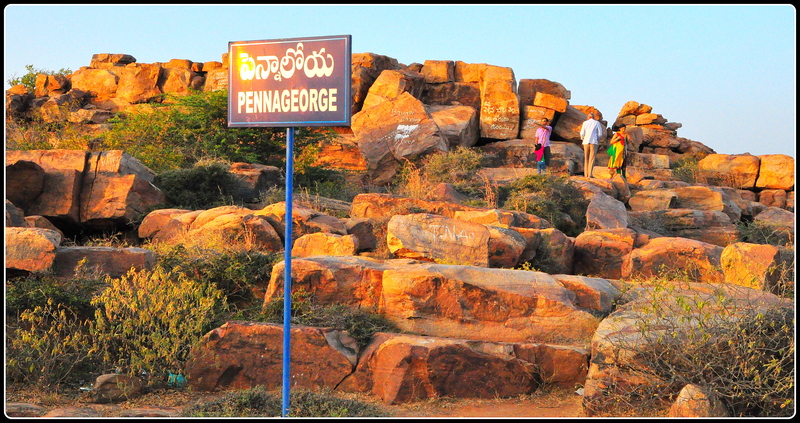 Behind the rangamandapa is the main shrine of Virupaksha. There are various sub-shrines around the inner court. 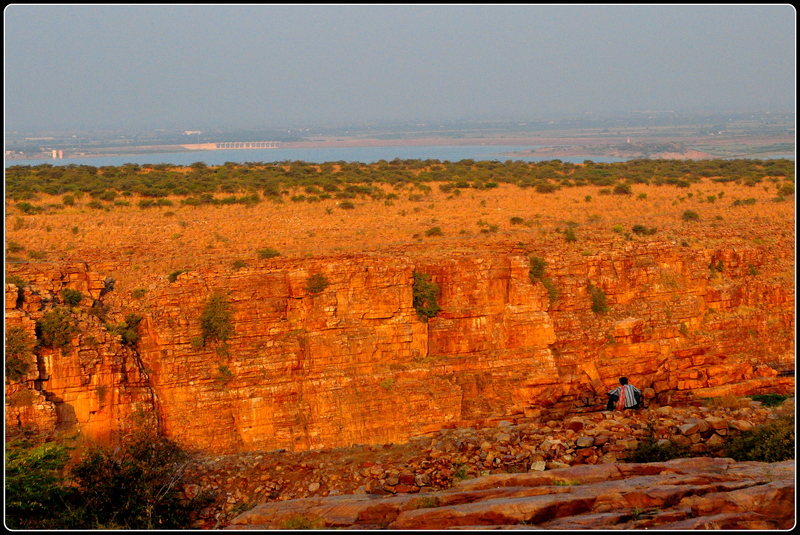 On northern side near the gopura is a water tank called the Manmatha tank. 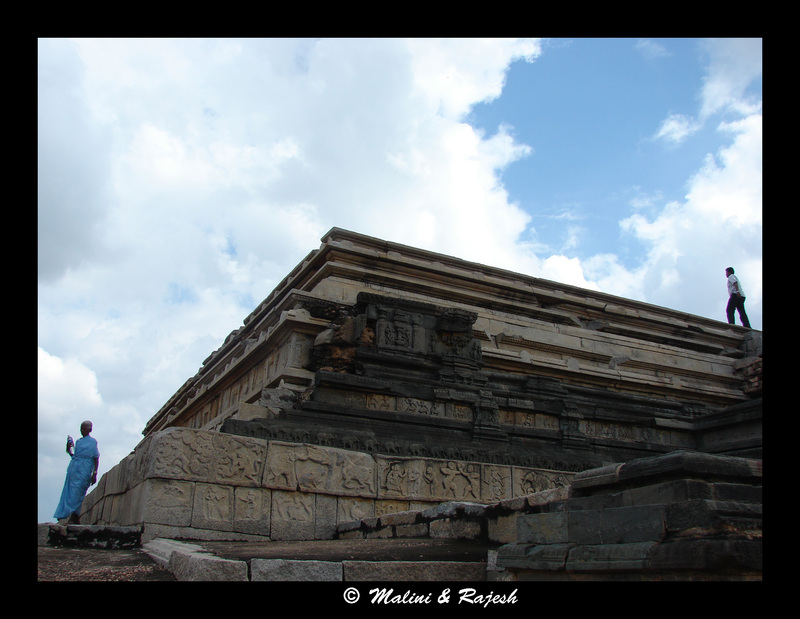 Towards the back side of the temple is a small dark room where you get to see an inverted image of the main gopura, as light falls through a small slit on the wall. 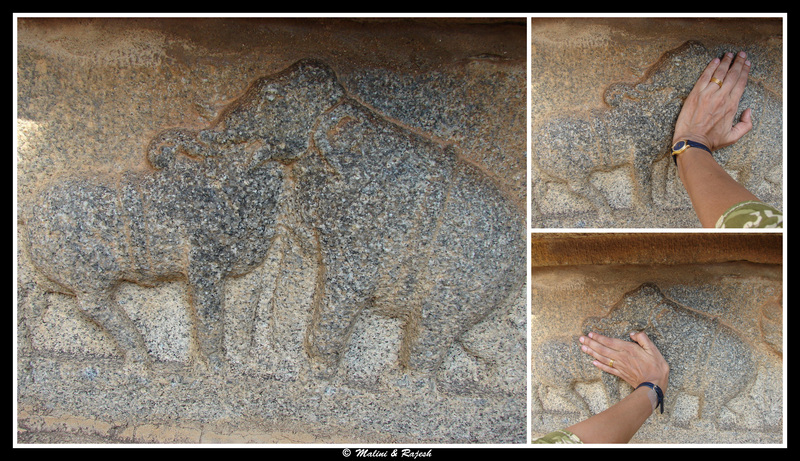 The temple has its own animal brigade. 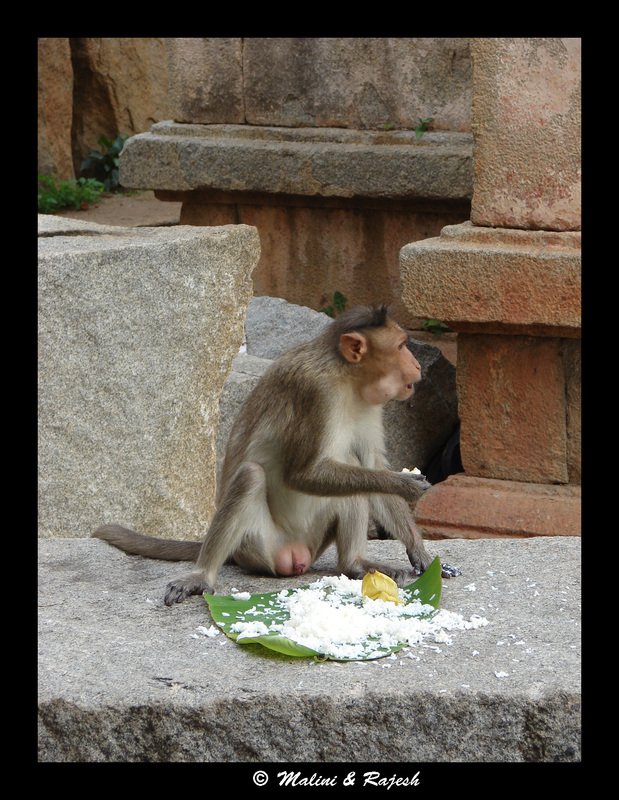 Right from Lakshmi, the temple elephant, which would eat bananas from your hand and bless you for a few rupees, to the monkeys hanging around the northern gopura eating rice from the plantain leaves offered by the devotees. 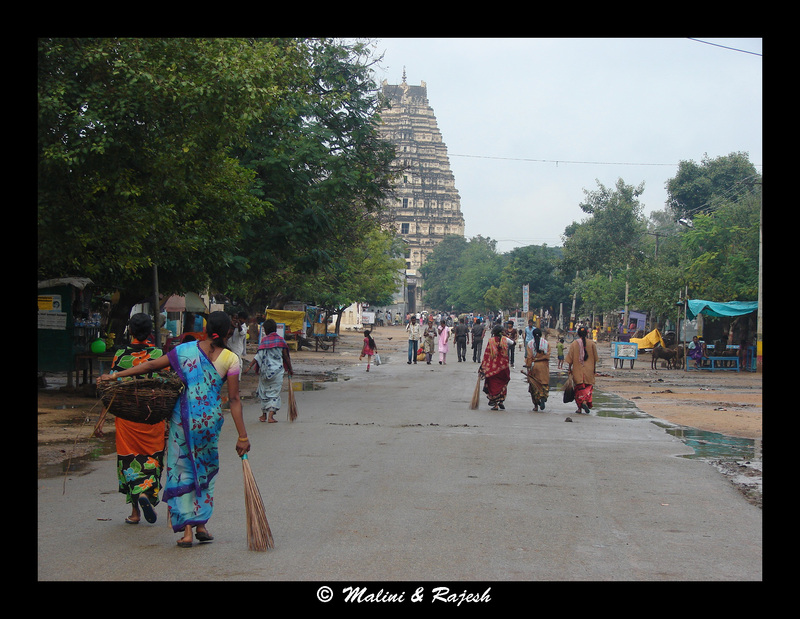 The street leading from the temple is called the Hampi bazaar. 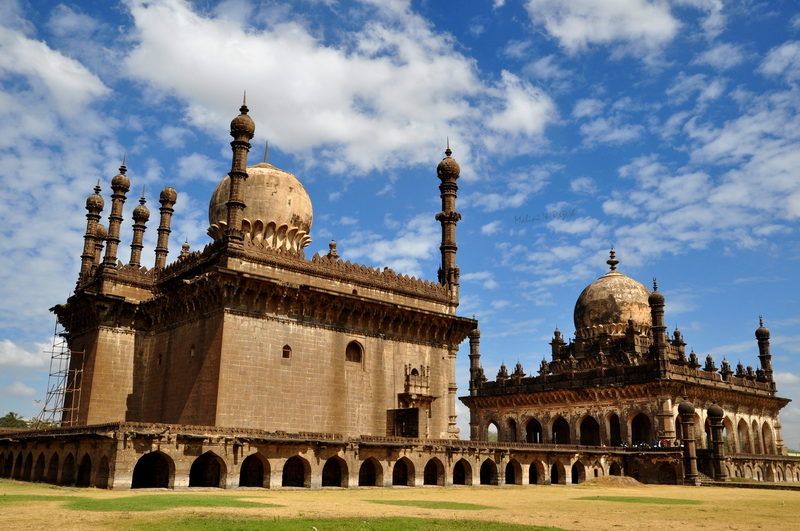 About a kilometre long, the bazaar is lined with a series of granite pavilions, some of them two storeyed. 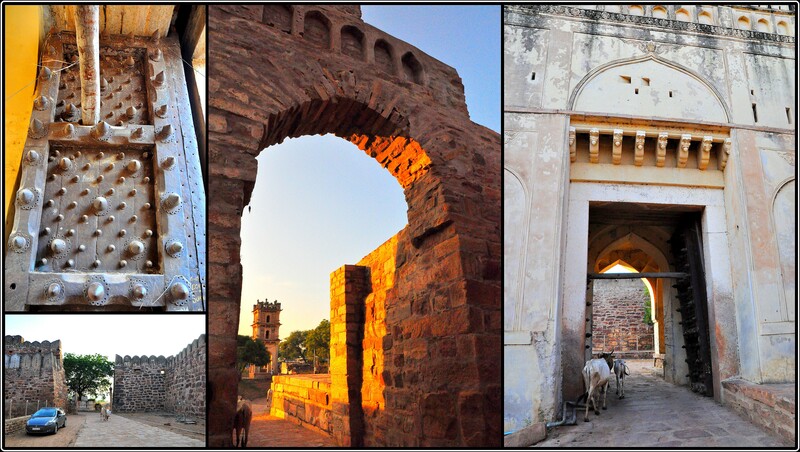 These structures were once part of a thriving market. 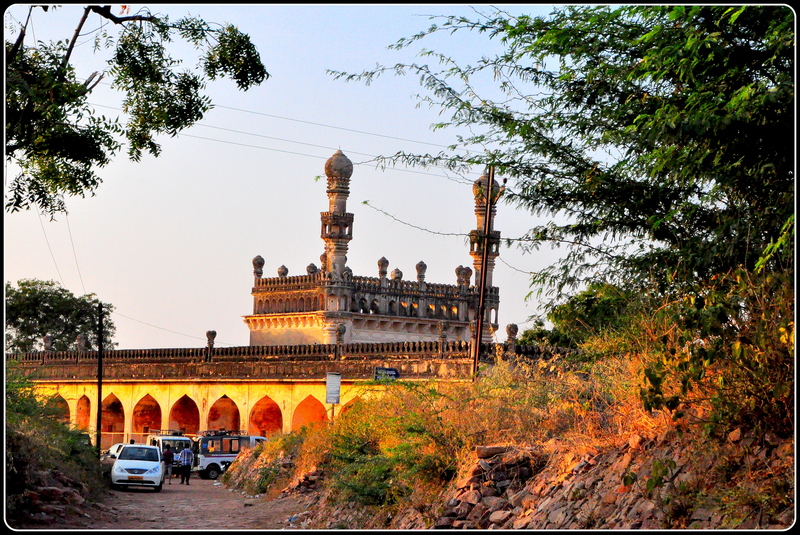 Most of these pavilions are encroached upon and made into shops, restaurants, homes, schools and even a police station. 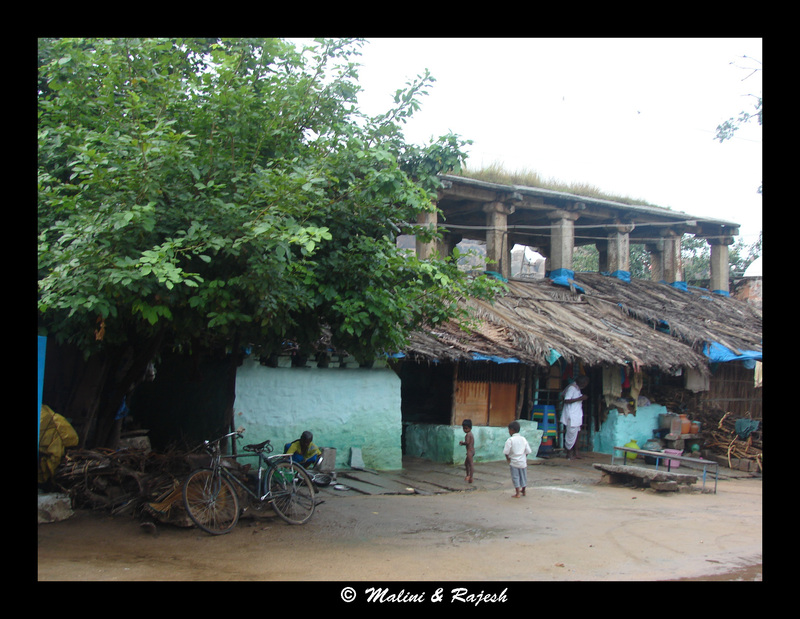 A lot of guest houses can be found around the Hampi bazaar area, mainly catering to backpackers. 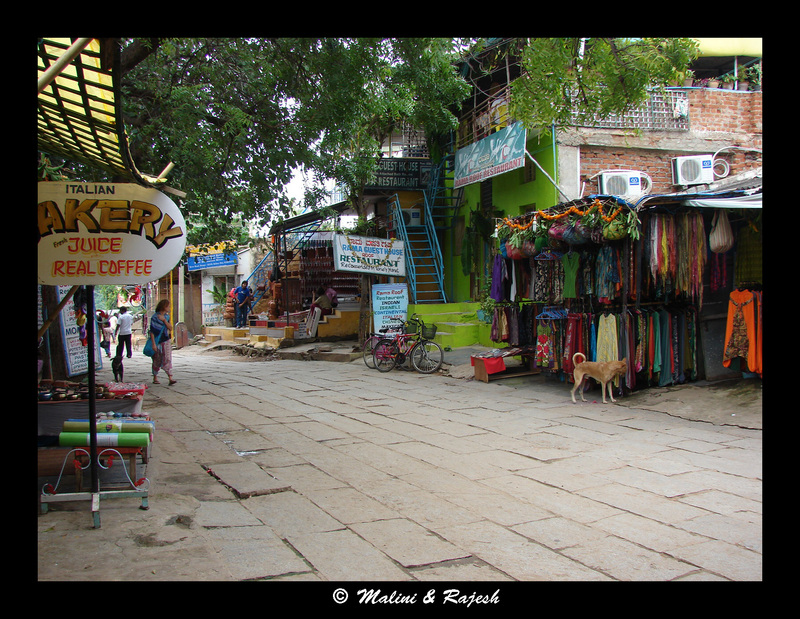 The signboards in Hebrew, the Italian and German bakeries and the tie and dye clothes hanging from the shops give the Hampi bazaar a ‘Janpath look’. The shops sell everything and anything from ethnic clothes, bags, religious artefacts etc. 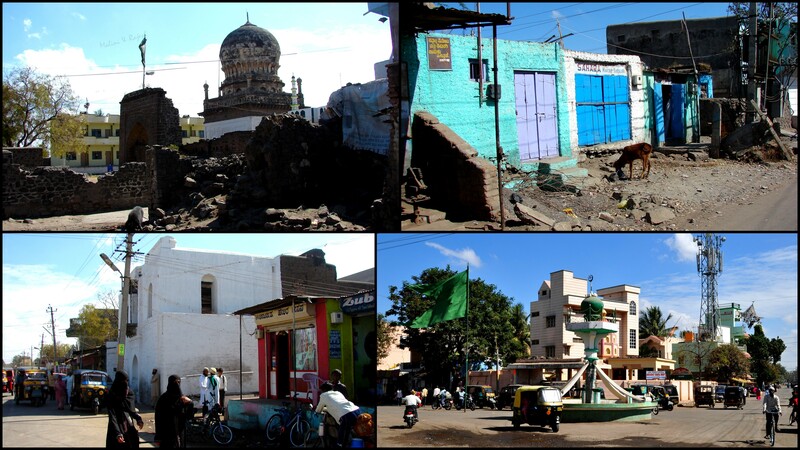 But in July, 2011, the district administration of Bellary, armed with a Karnataka High Court order, brought in three bull dozers to demolish the 20-year old bazaar. 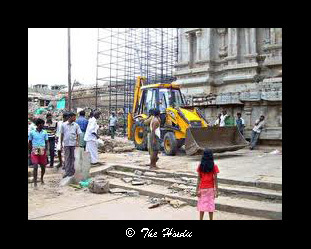 The entire stretch in front of the temple has now been razed to the ground, leaving hundreds of people with no means of livelihood . 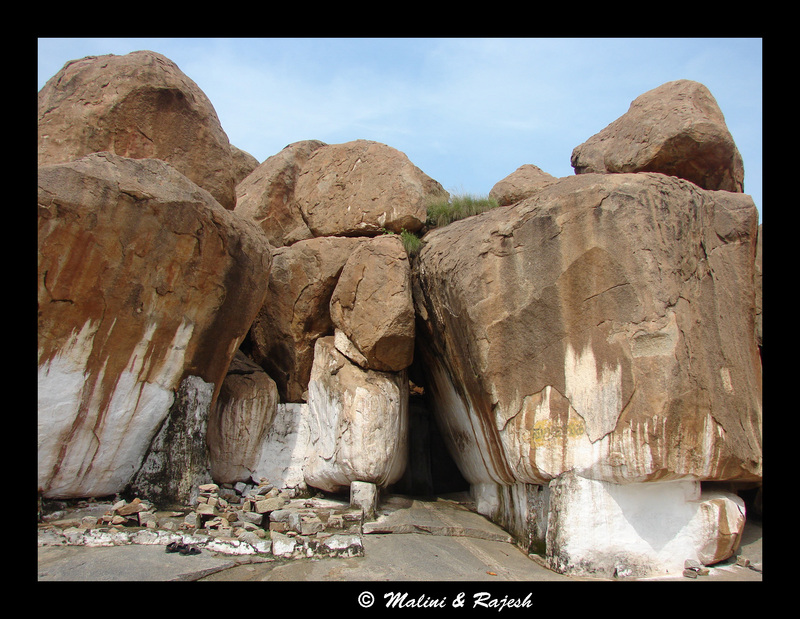 We took the road from the Hampi bazaar that climbs steeply up towards Hemakuta hill. 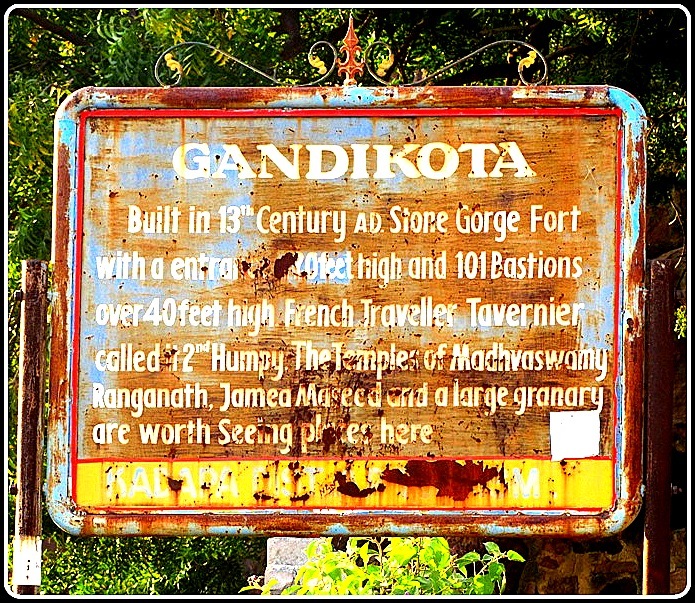 The next stop was the Kadlekalu Ganesha temple on the Hemakuta hill. 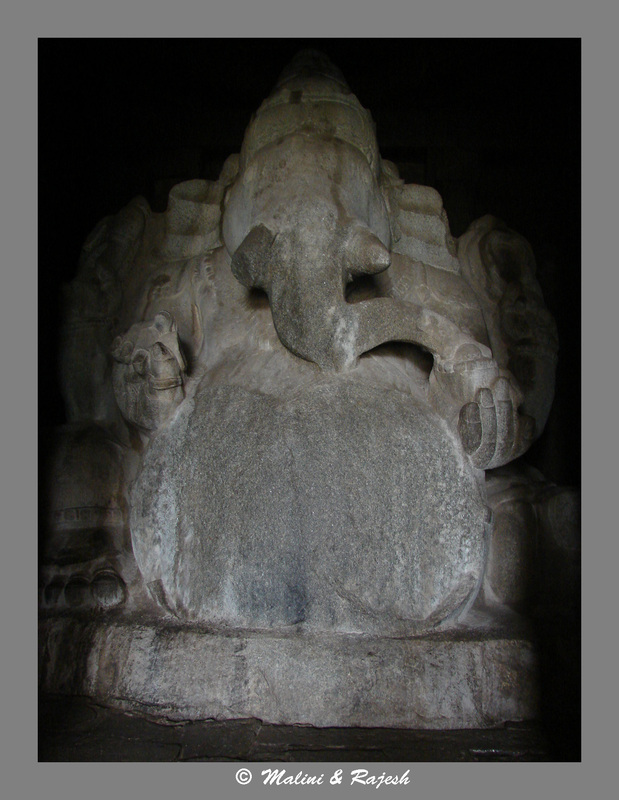 Here Ganesha is seen with his paunch shaped like a green gram seed, though it looked far more bigger than a green gram seed. 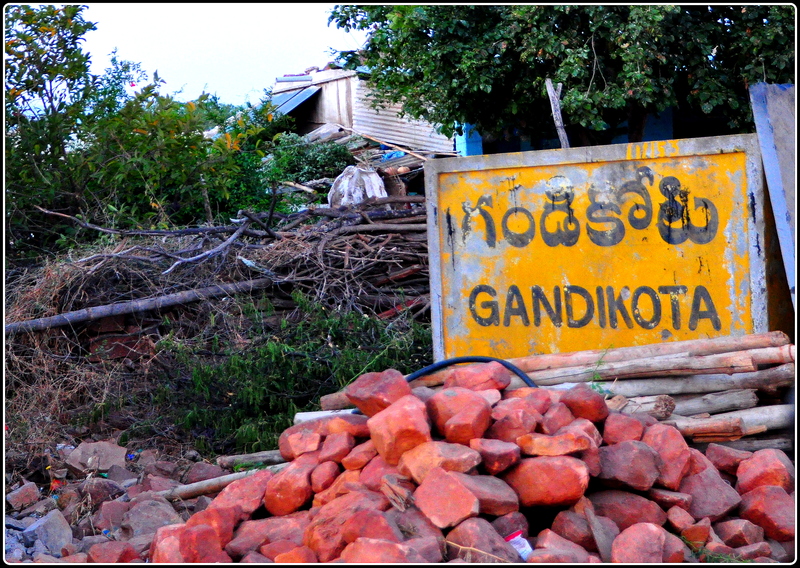 Right next to the Ganesha temple is a Krishna temple devoted to Balakrishna. The idol of Balakrishna now lies in a museum in Chennai. 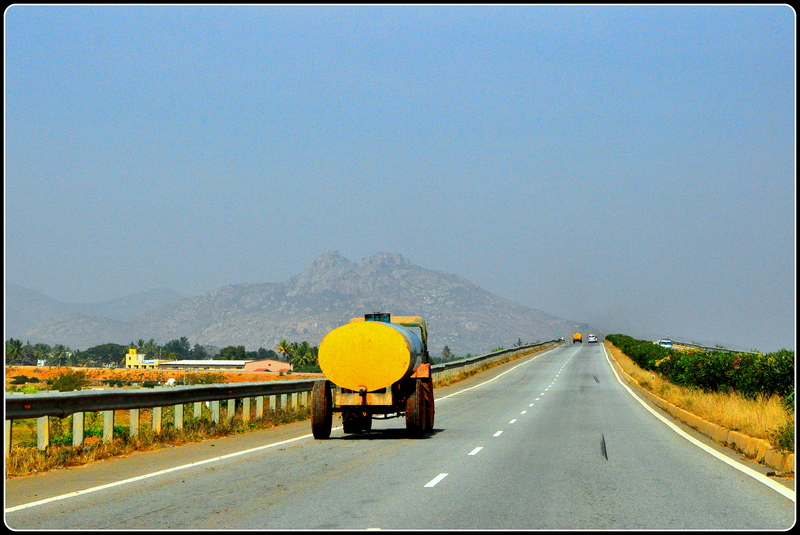 On the other side of the road is a bazaar and a pushkarini (water tank). 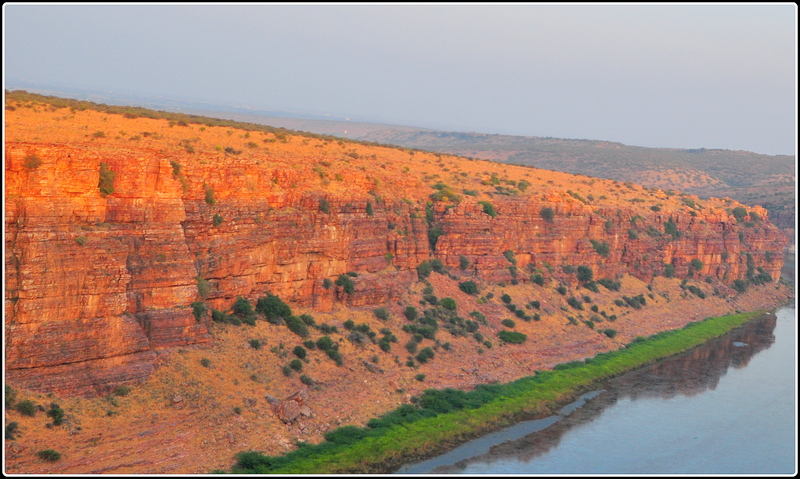 Further down is the statue of Lakshmi Narasimha. 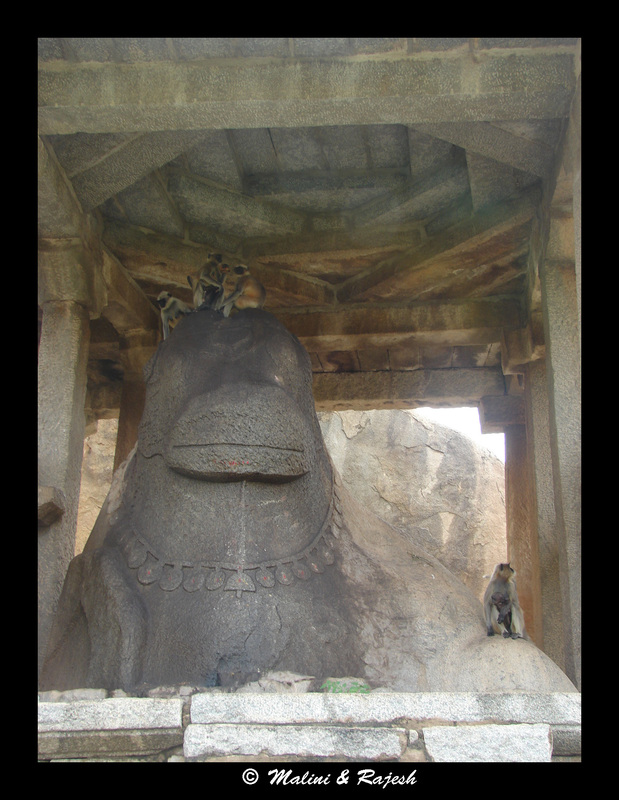 This giant monolithic statue of the man-lion god is the largest icon in Hampi. 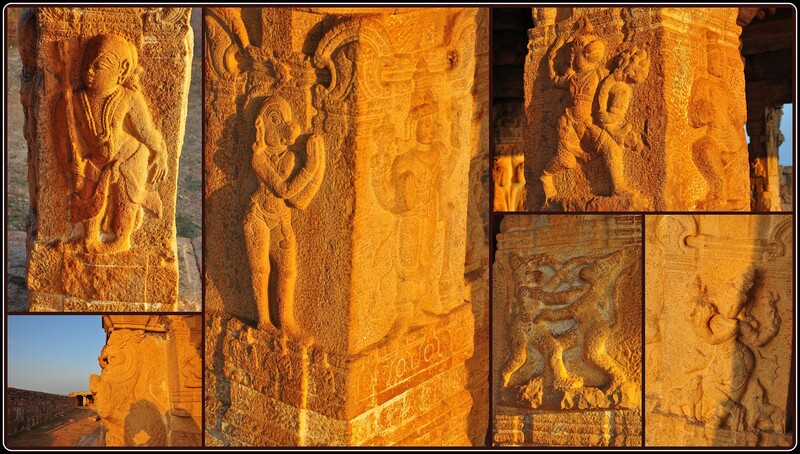 Narasimha is depicted in a cross-legged seated position. 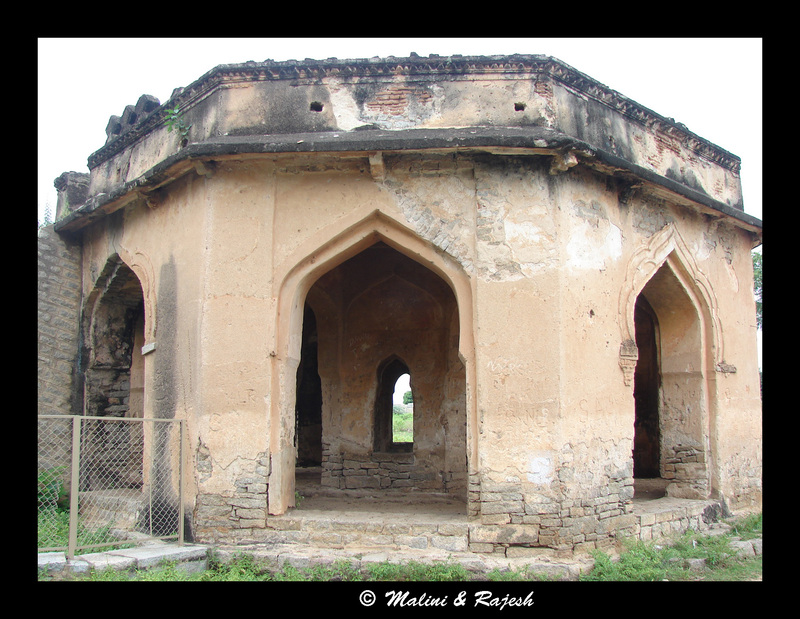 The original structure had his consort Lakshmi sitting on his lap. This image was destroyed during the enemy invasion. Currently, only a hand of the goddess resting on his waist can be seen. 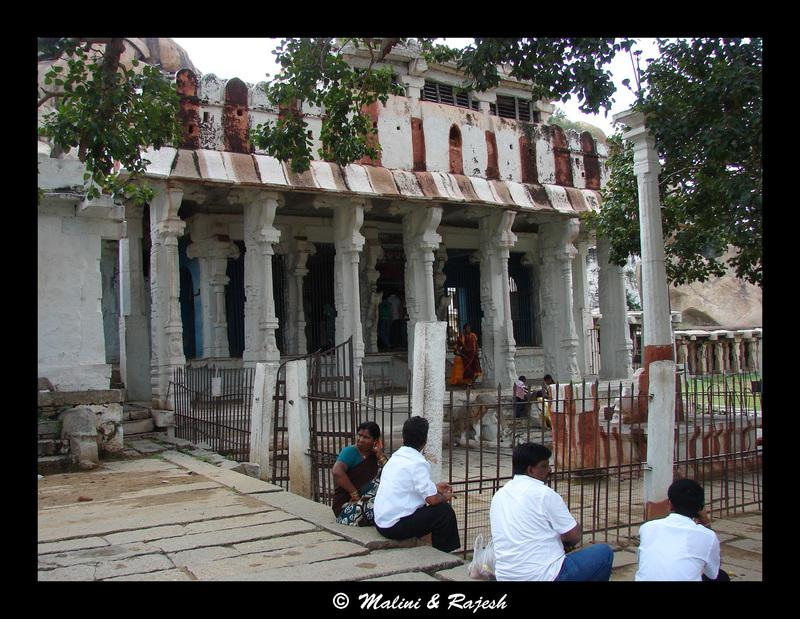 Right next to the Lakshmi Narasimha is a Badavalinga shrine which was built by a poor woman. 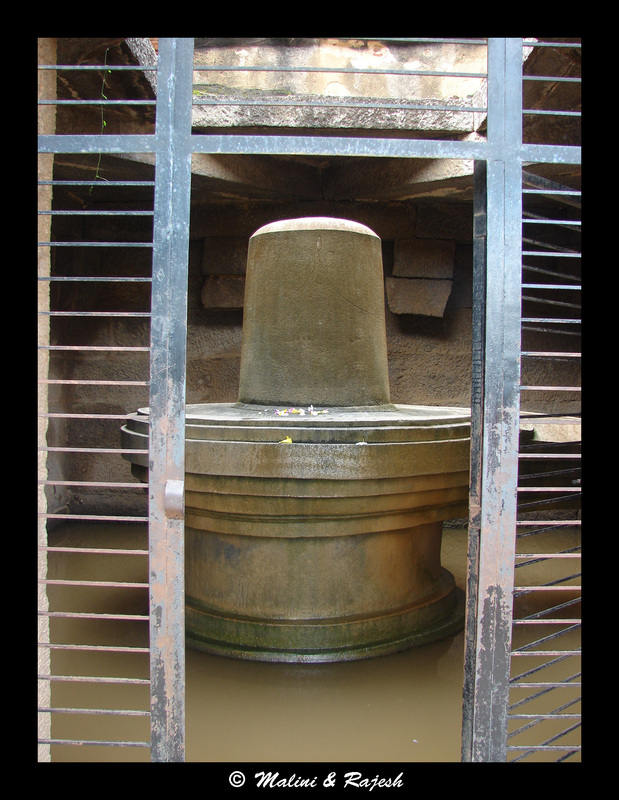 The pedestal always remains immersed in water. 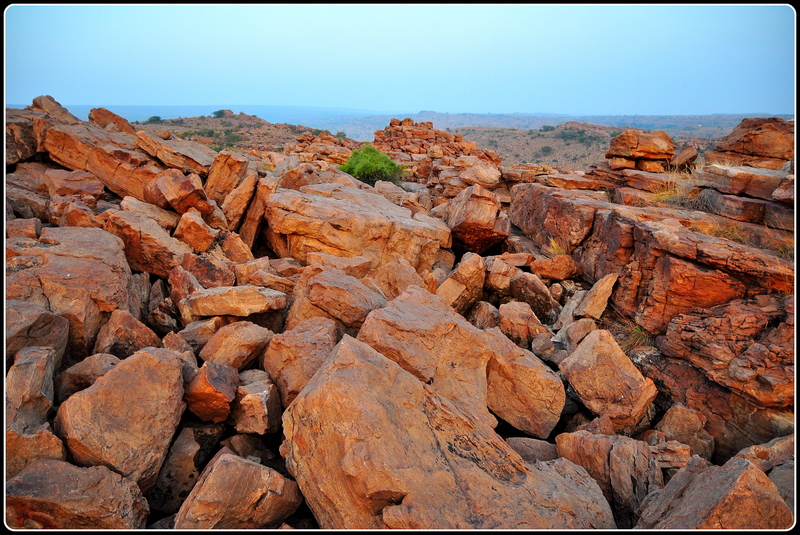 A few meters ahead is the Akki Tangi Gundu better known as sister stones. 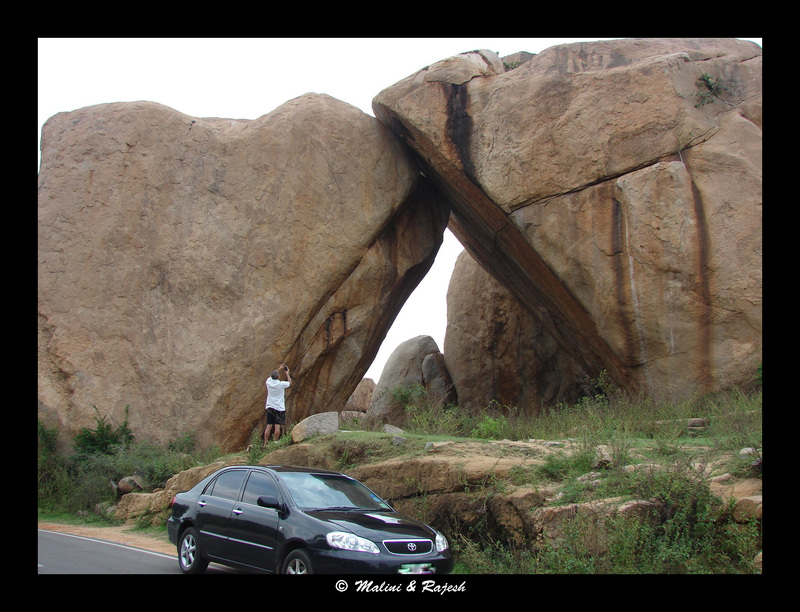 Two huge stones stand precariously leaning into each other. 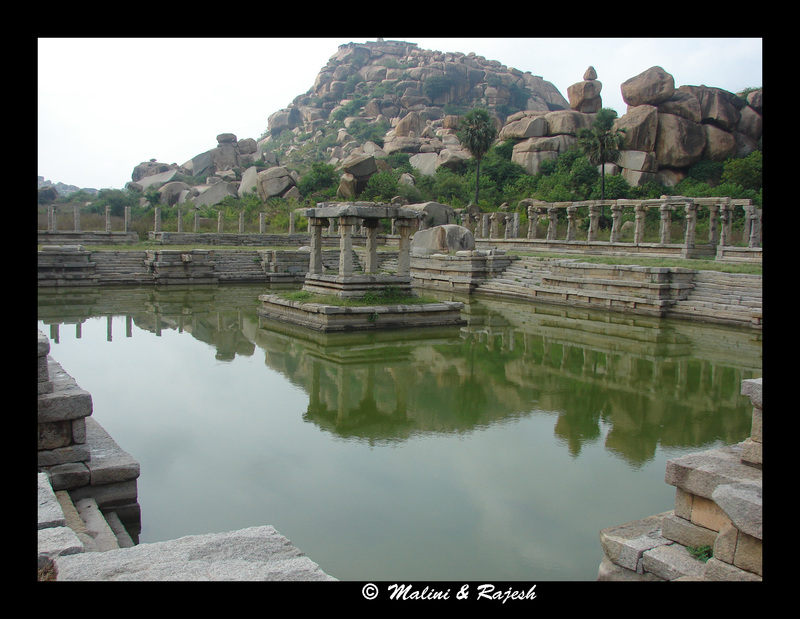 The story is that two sisters came to visit Hampi and were cursed into stones as they ridiculed the place. The sister stones were recently in the news because a portion collapsed. 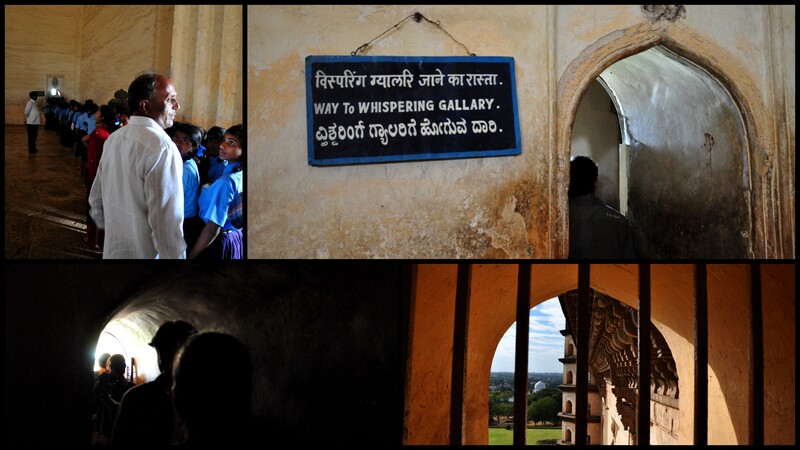 Our next stop was the underground Shiva temple. 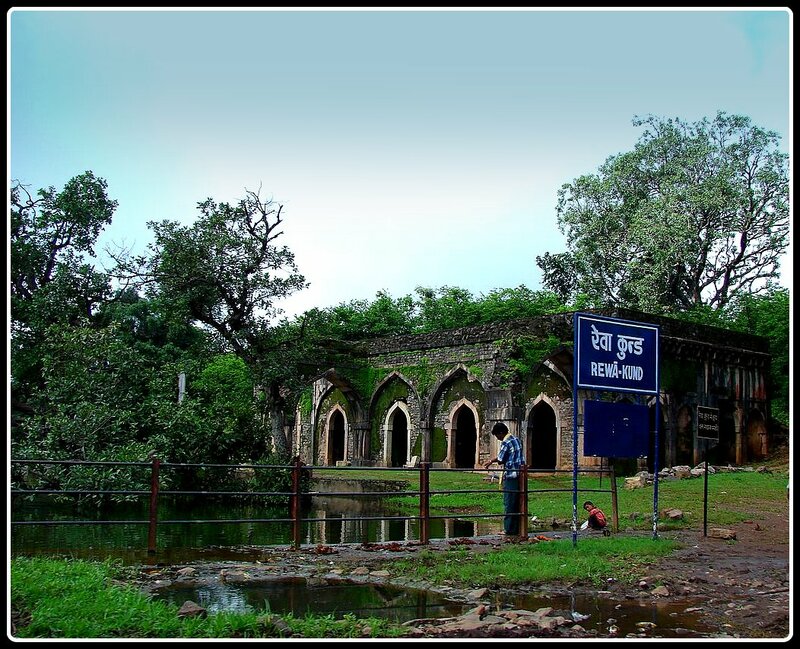 As the name suggests, the temple is below ground level. 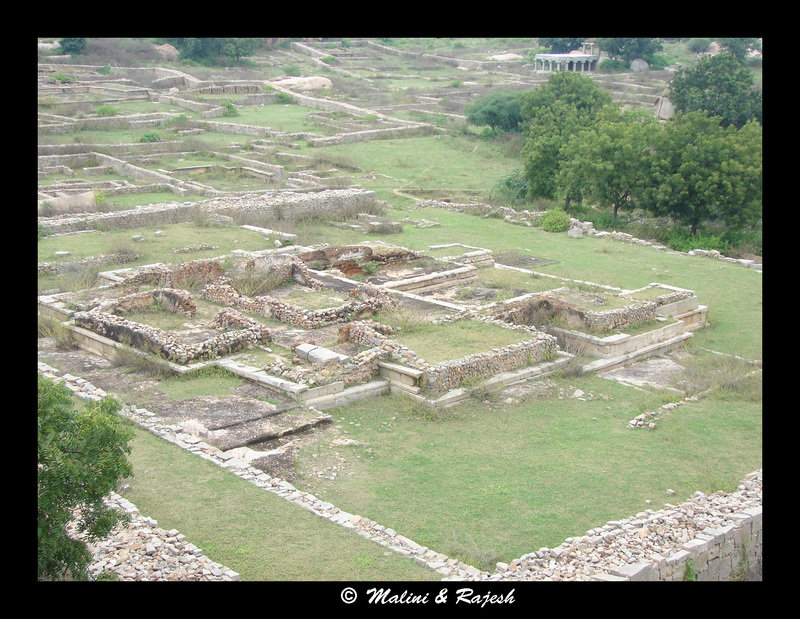 The structure is in a dilapidated state and the main sanctum is under water. 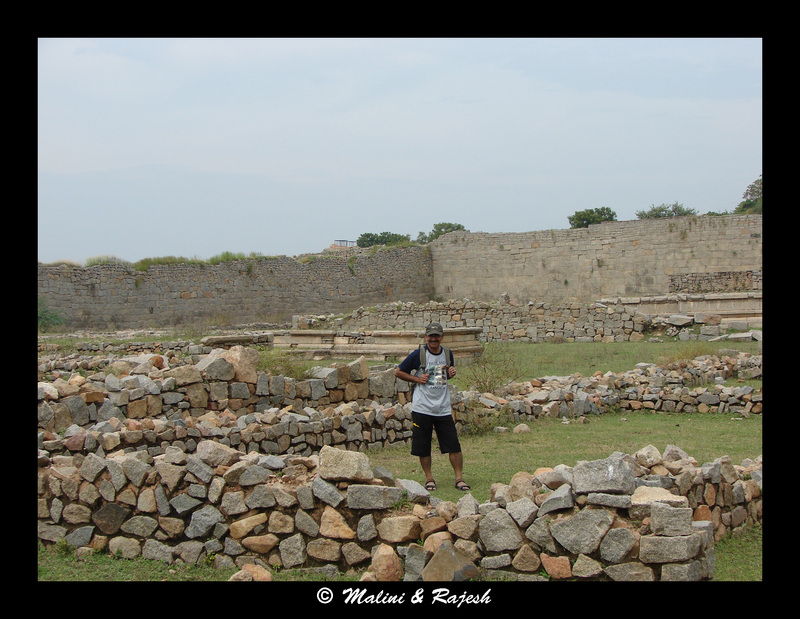 We moved on to the Zenana enclosure next. This used to be the ladies’ quarters. 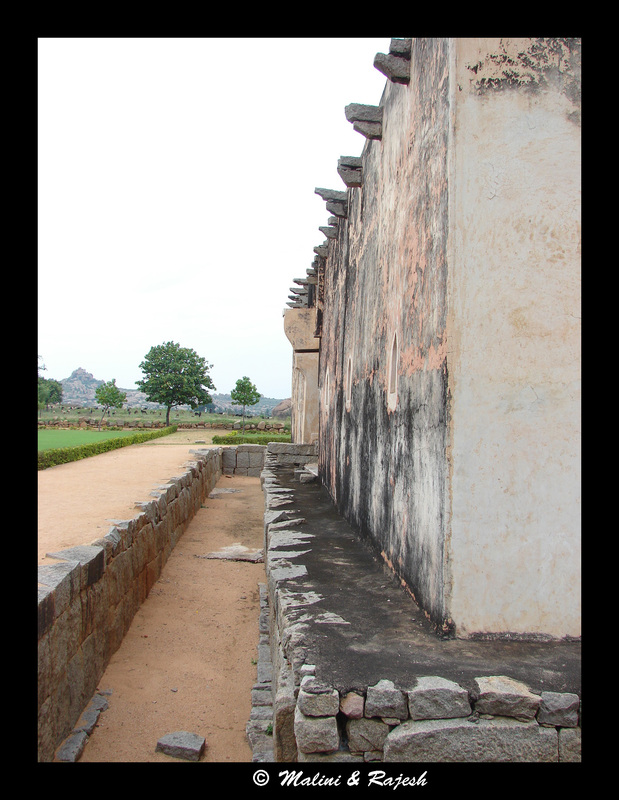 The enclosure has a huge wall running along the four sides. 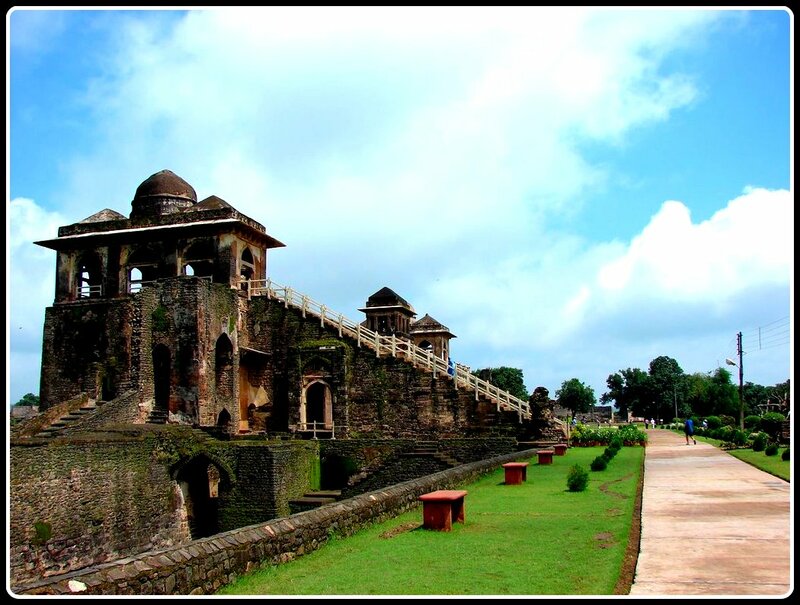 There are three watch towers and remnants of the Queen’s palace inside the enclosure. 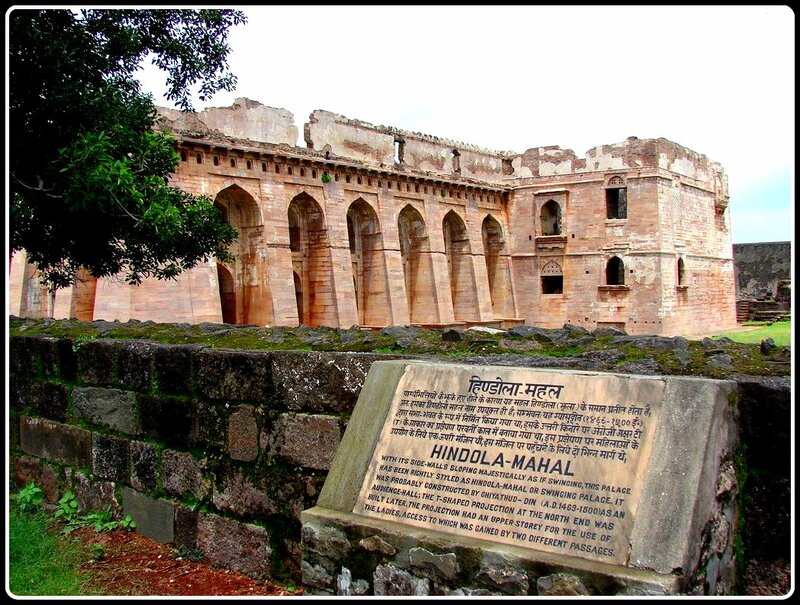 But what stood out was the Lotus Mahal. 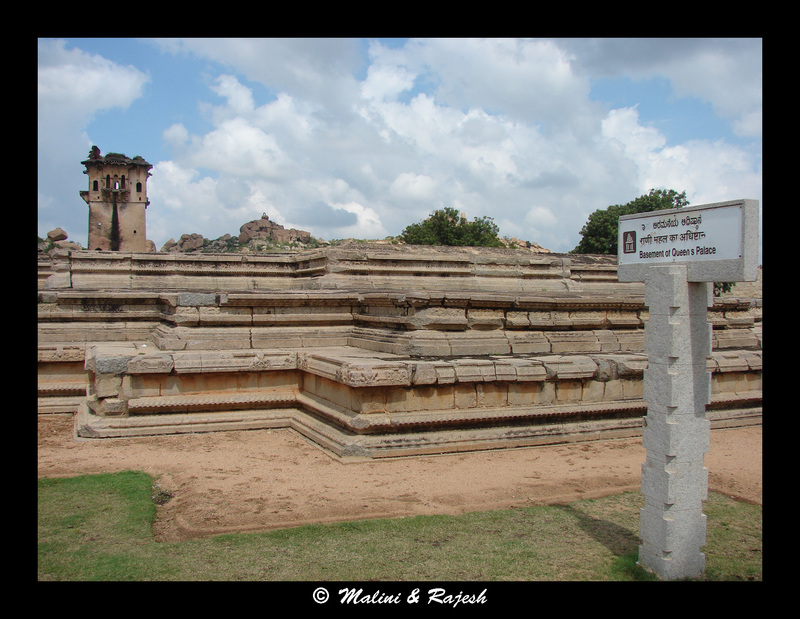 The Lotus Mahal stands on a raised platform and has two storeys. 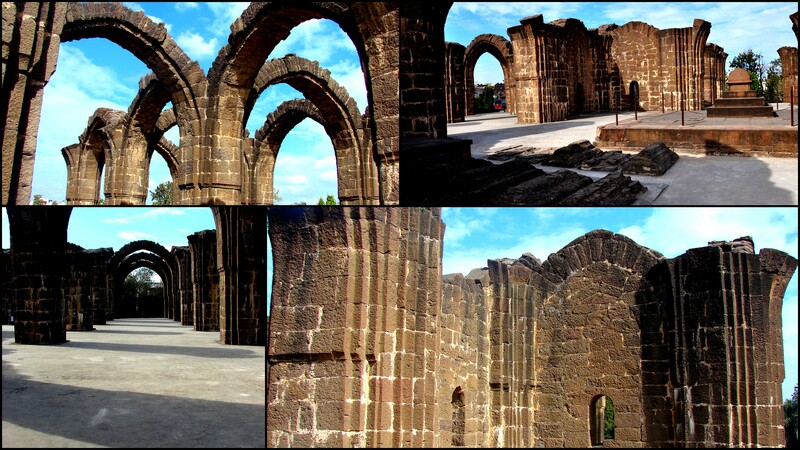 The first level has huge arches and pillars to support them and the level above has a lot of windows on all the sides. 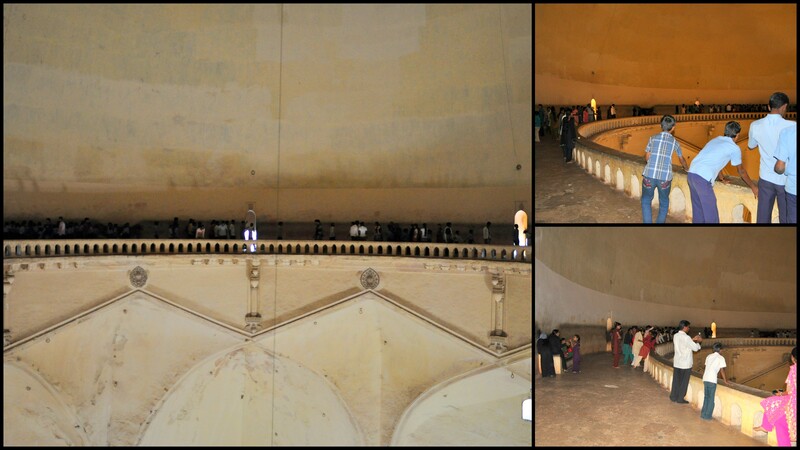 Just outside the Zenana enclosure is a long oblong building with huge domes on top. This is the elephant stable. 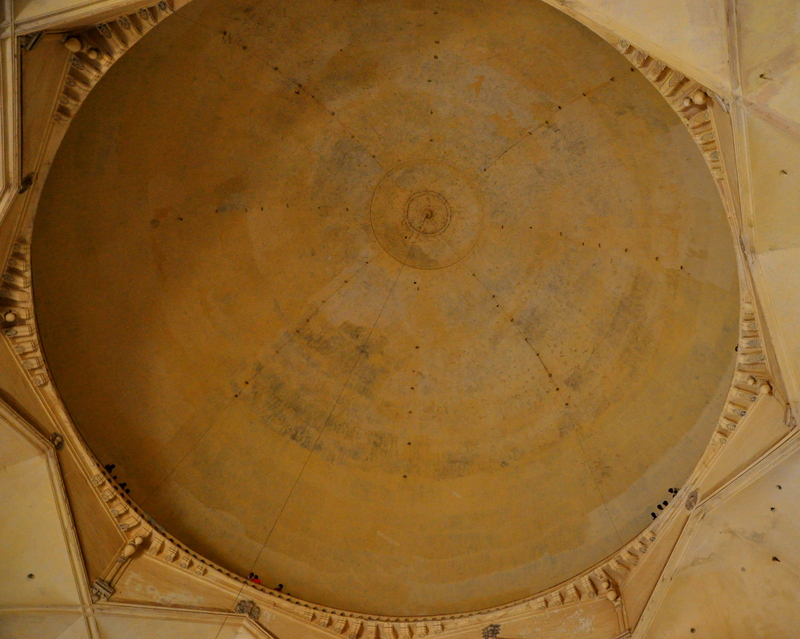 There are hooks attached to the inside of the dome probably used to tie the elephants. 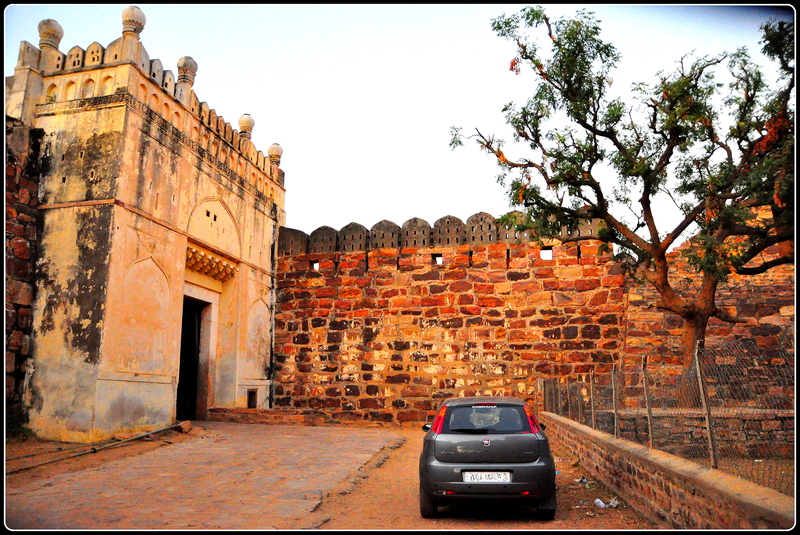 Close to the elephants stable is the Guard Room, which has arched entrances. 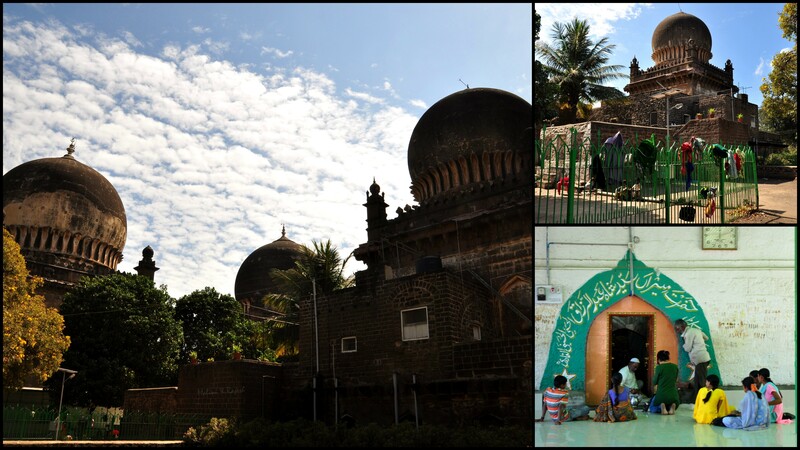 We next visited the Hazara Rama temple. 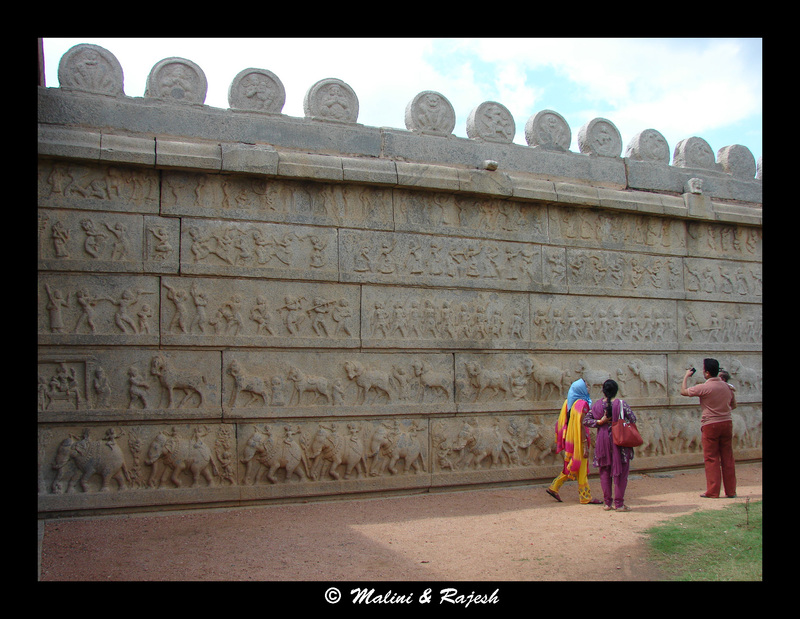 On the inner and outer walls are depicted the main incidents from Ramayana and a few scenes from Mahabharata. 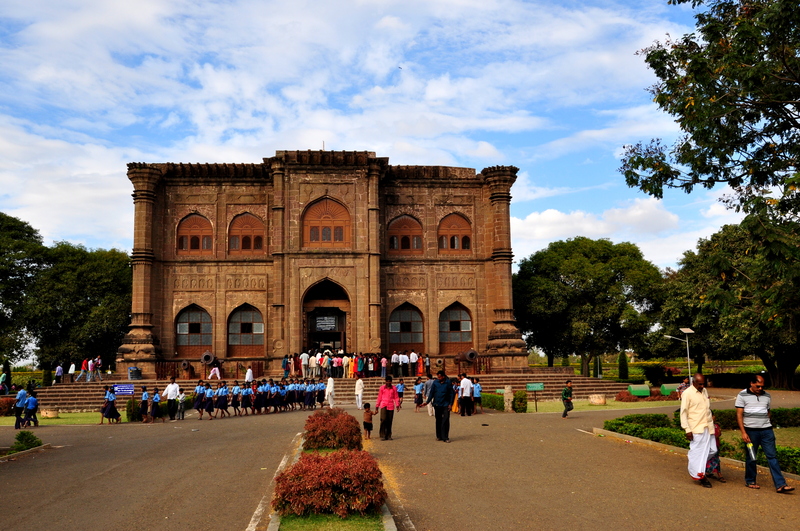 We walked ahead to the King’s palace which encloses the King’s audience hall, a large water tank and a huge pedestal structure called the Mahanavami Dibba. 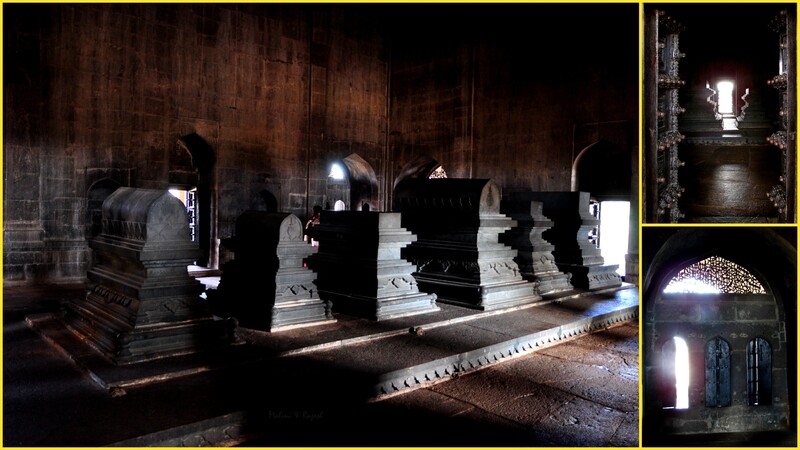 The King’s audience hall must have been a huge pillared structure in its prime. But now what remains is a platform with a lot of vestiges of pillar-sockets. 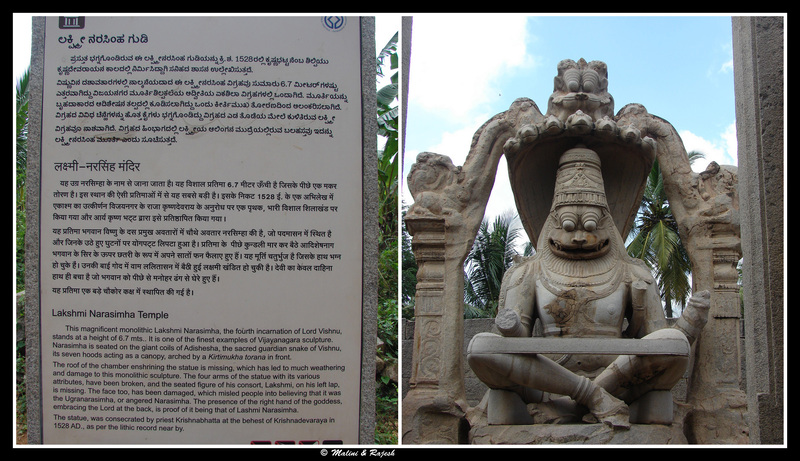 The Mahanavami Dibba was erected after Krishnadevaraya’s victorious campaigns in Orissa. 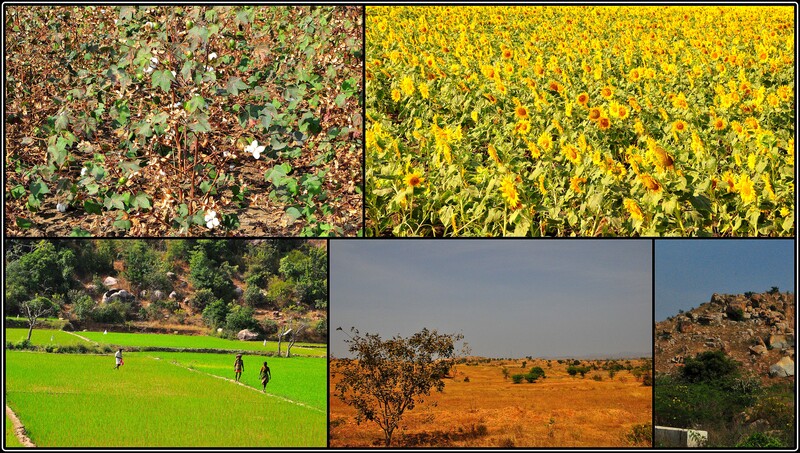 Ever since, it has played a prominent place in the Navarathri celebrations. 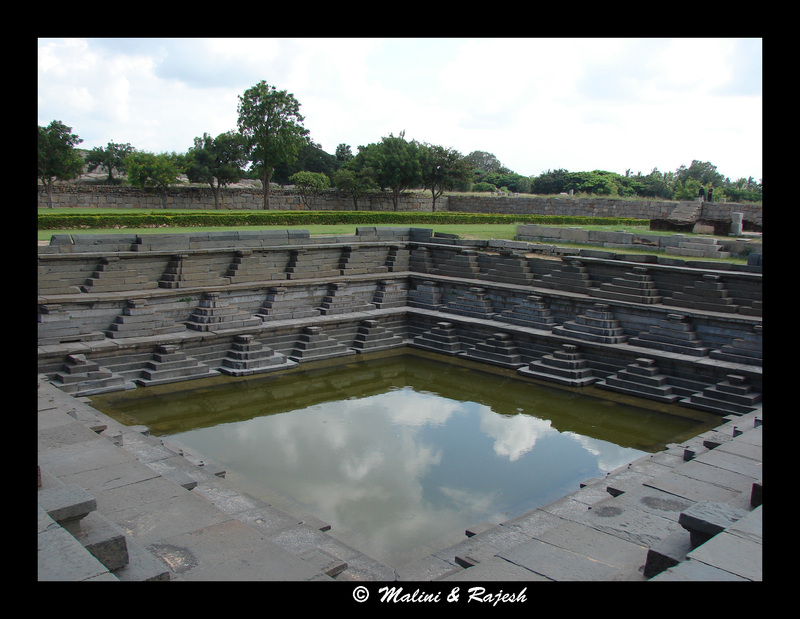 At the base of the Mahanavami Dibba is a water tank with steps on all sides. There are inlets and outlets around the tank. It was almost 2 pm and we were famished. 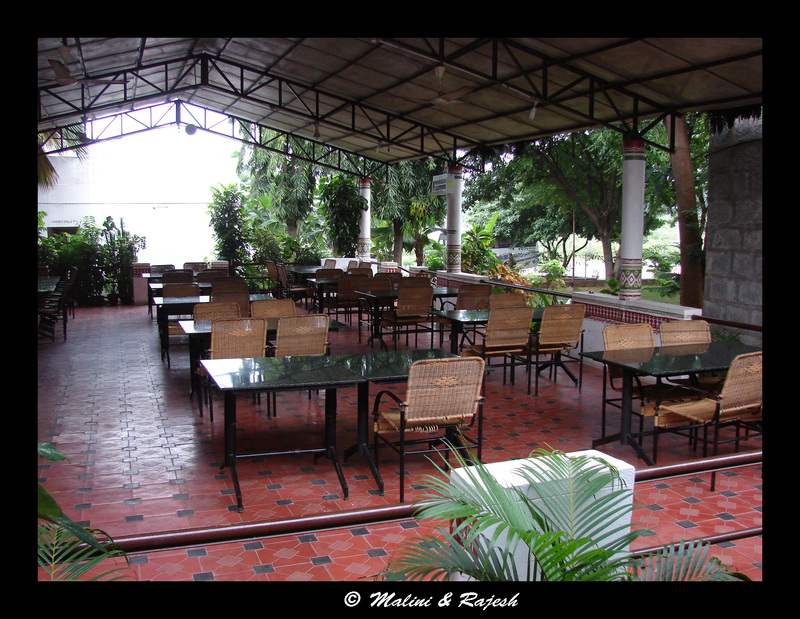 Our lunch was arranged at Mayura Bhuvaneshwari. 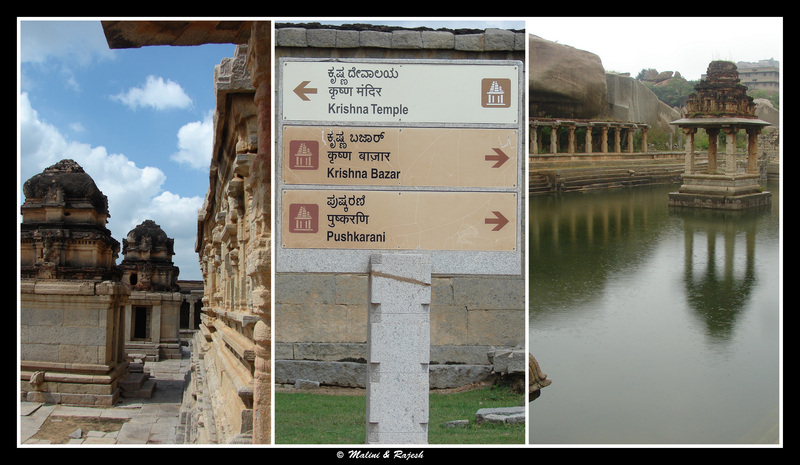 After lunch, the bus took us to Vittala temple. 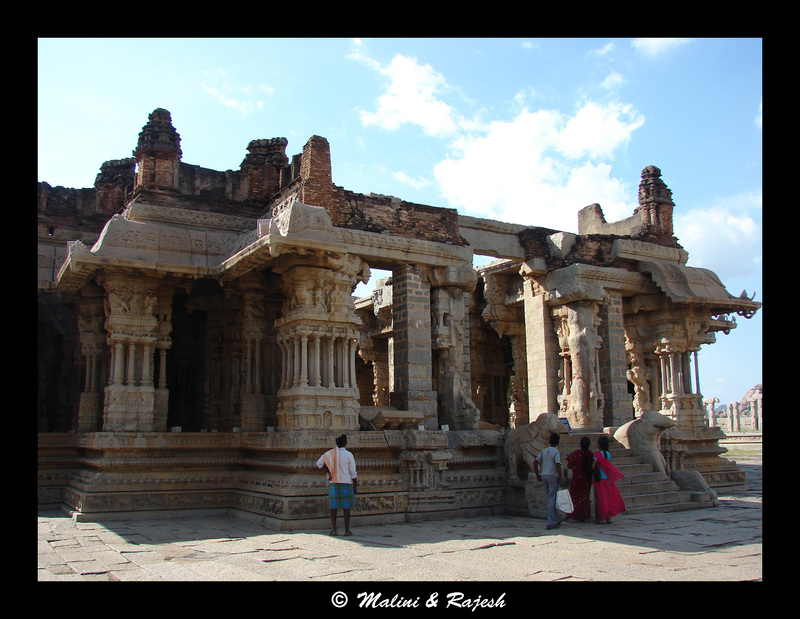 The Vittala temple complex is another architectural showpiece. 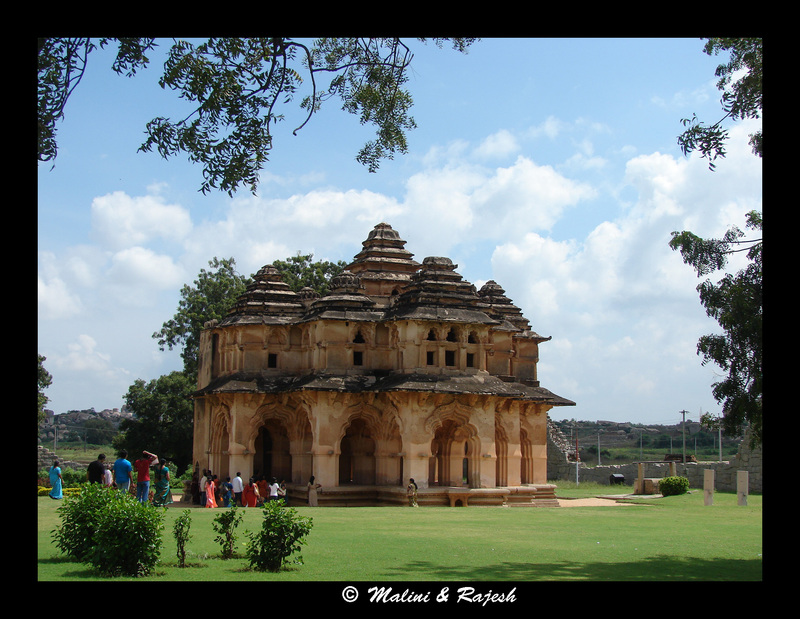 The temple is built within a walled enclosure and, just like the Virupaksha temple, has huge pillared Mandapas on all sides and towering Gopuras overlooking the complex. 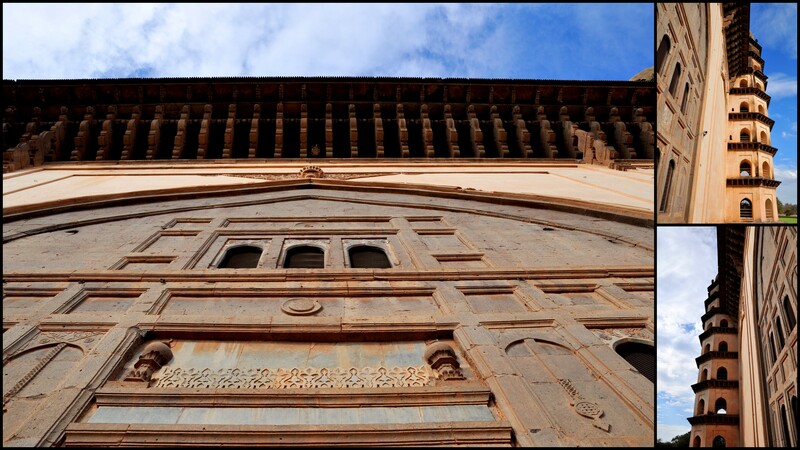 The Mandapas have numerous beautiful carvings and stand on ornate platforms. 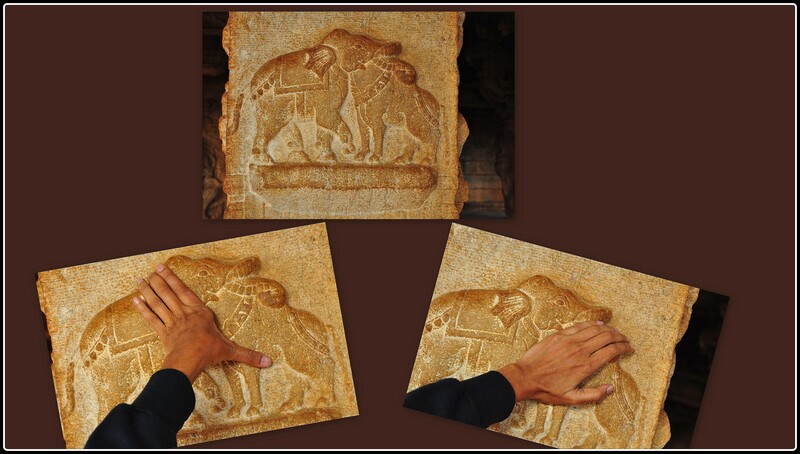 One such carving took our breath away. It looks like an elephant from the right and a bull from the left. 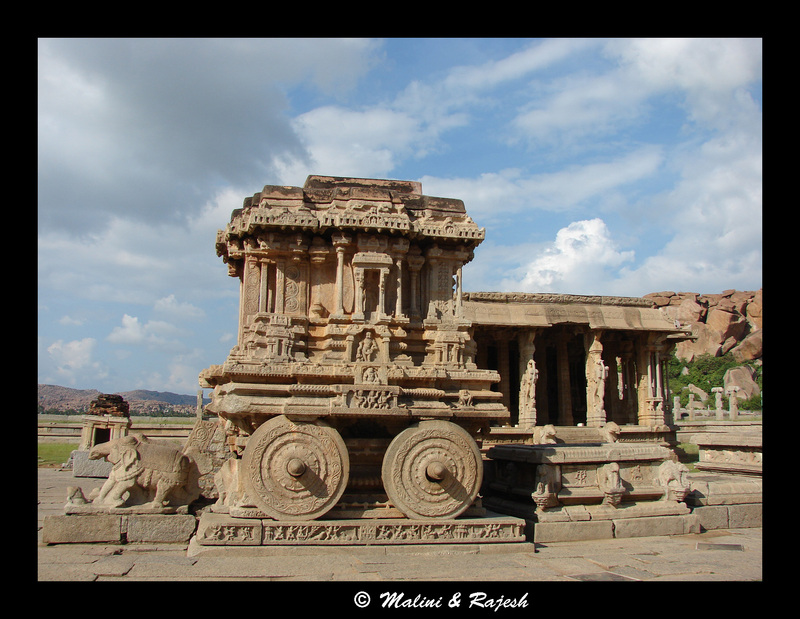 The highlight of Vittala temple is the stone chariot. 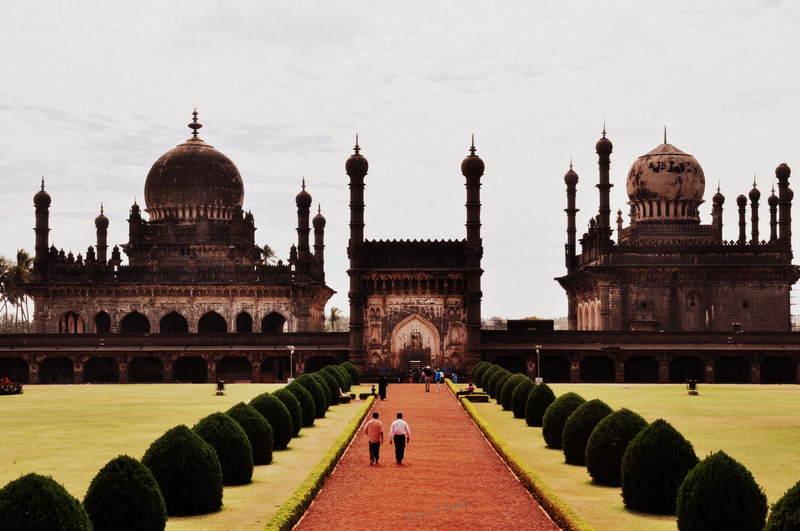 This iconic structure is the symbol of Karnataka tourism. 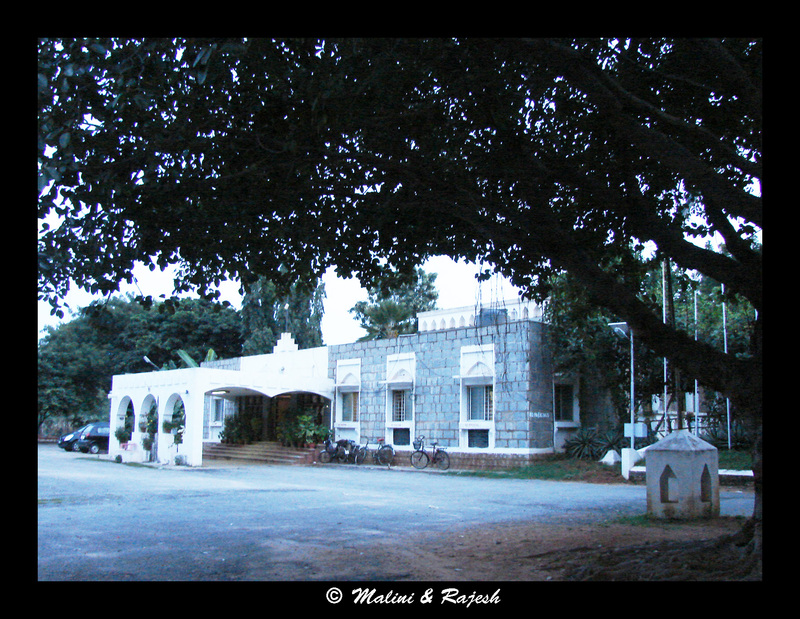 By the time we had walked around the complex, it was 6 pm and we decided to call it a day. 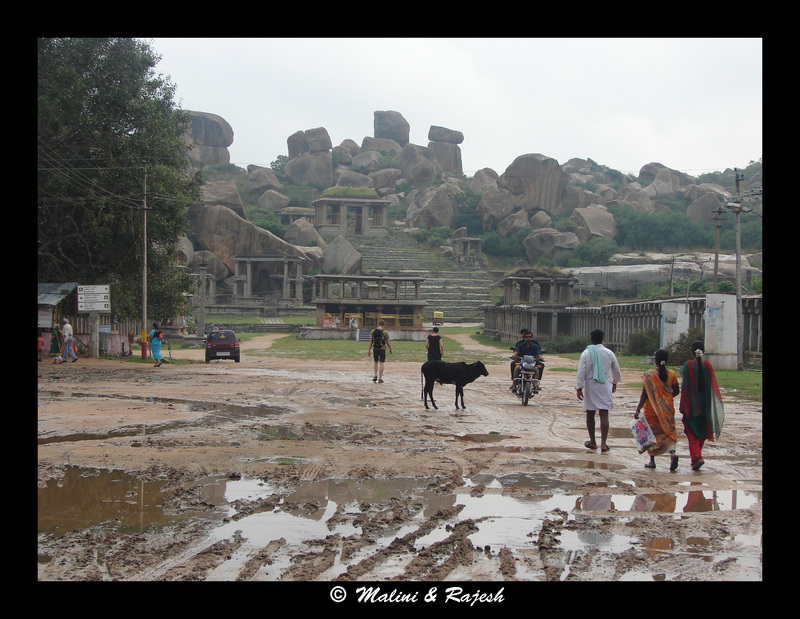 A walk through Hampi can be both mysterious and rustic. 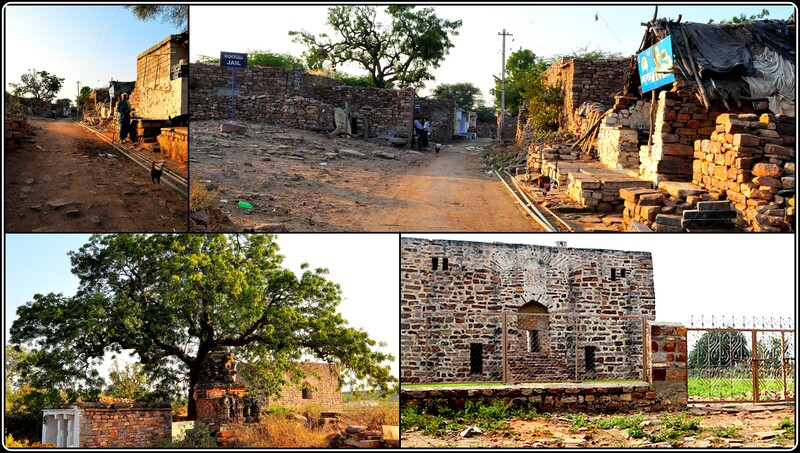 The boulders, the fallen temple stones, the broken palace basements – all have a story to tell. But we wanted to find some of those stories on our own. 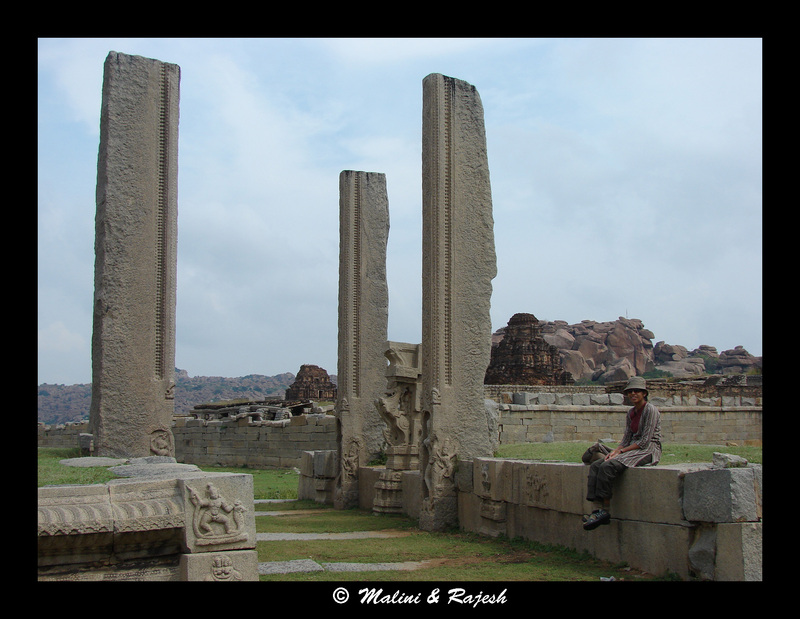 We had 2 more days in Hampi and we had already made up our mind. We were going to be travellers for the next two days. 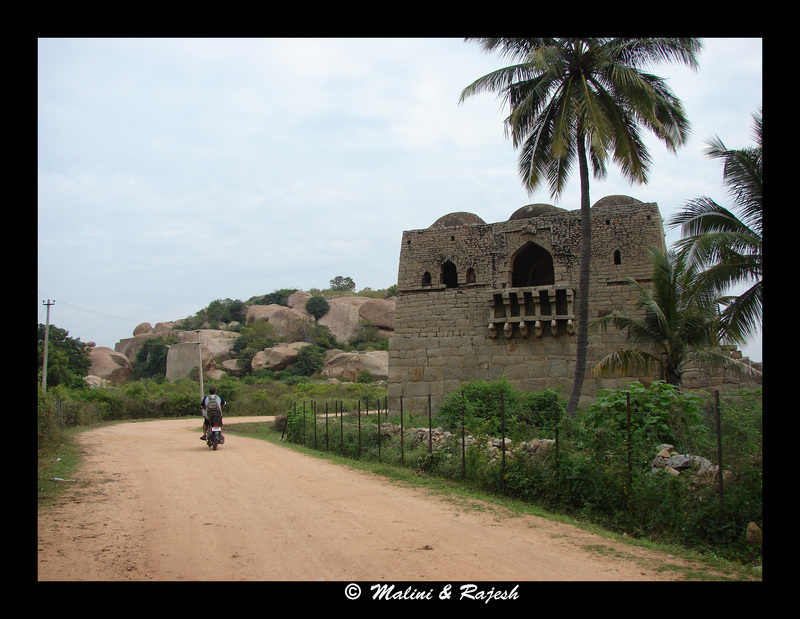 To read more: Go to Hampi: Day 2, the Walkabout.